Name Variation George Philip Keifer was also known as Kifer. Name Variation George Philip Keifer was also known as Kiefer. Name Variation George Philip Keifer was also known as Philip. George Philip Keifer was born in 1781 at Germany. He was the son of (?) Keifer. George Philip Keifer married Eva Marcia Roedel, daughter of Johann Heinrich Roedel and Eva Maria Handler, in 1808 at Germany. George Philip Keifer died circa November 1858 at Bloomfield, Morrow, Ohio. 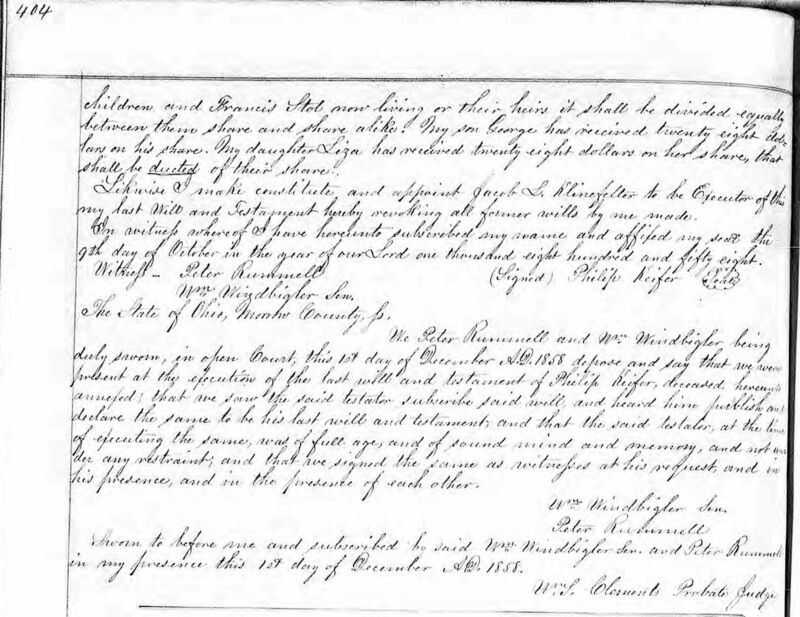 His estate was probated on 1 December 1858 at Morrow, Ohio, The last Will and Testament of Philip Keifer (Kiefer) late of Bloomfield township, Morrow County, Ohio, deceased, was this day produced in Court by Jacob L. Klinefelter, Executor in said Will named, and William Windbigler and Peter Rummell the subscribing witnesses to said Will appeared and in open court, on oath testified to the due execution of said Will; which testimony was reduced to writing and by them prespectively subscribed and filed with said Will, and it appearing to the Court by said testimony that said Will was duly attested and executed, and that the said testator at the time of executing the same was of full age, and of sound mind and memory and not under any restraint, it is ordered by the Court that said will and testimony be recorded. It is further ordered by the Court that Letters Testamentary issue to Jacob L. Klinefelter the Executor in said Will named upon his giving bond in the final sum of two thousand dollars conditioned for the faithful performance of his trust according to law. Whereupon the said Jacob L. Klinefelter appeared in open Court, accepted said appointment and gave his bond accordingly, with William Windbigler and Peter Rummell as sureties. The Court appoint Peter Rummell, John Halderman and William Windbigler to appraise the personal estate of said decedent. Total All Persons - White, Slaves, Colored, Other: 6. 1840 Bloomfield, Richland, Ohio He was listed as the head of a family on the 1840 Census at Bloomfield, Richland, Ohio, listed as Philip Keffer; census data blank. 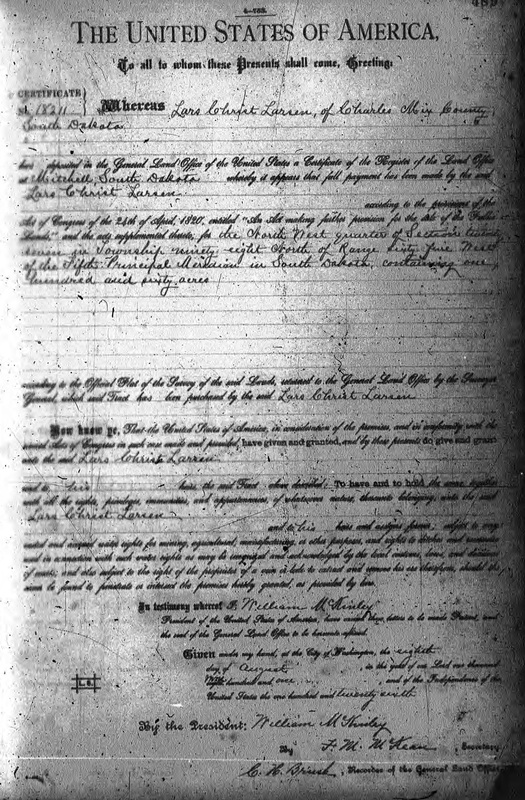 George Philip Keifer and Eva Marcia Roedel immigrated in June 1819 to ship named Elizabeth ship's captain: Morione Goonet. George Philip Keifer migrated in 1835 at Pennsylvania to, Morrow, Ohio, In the spring of 1835, he (Peter Keifer) joined his uncle, Philip Keifer, who was journeying to Ohio; he walked the most of the way. They settled in Troy (township, Morrow, Ohio). 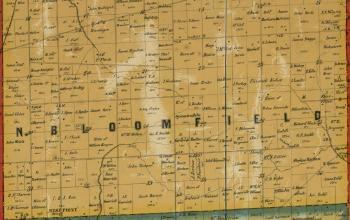 In 1857 at North Bloomfield, Morrow, Ohio, map of landowners - listed as P. Kifer. First - After all my lawful debts are paid and discharged the residue of my estate and personal I give, bequeath, and dispose of as follows, to wit: To my children and Francis Stol now living or their heirs it shall be divided equally between them share and share alike. My son George has received twenty eighter dollars on his share. My daughter Liza has received twenty eight dollars on her share, that shall be ducted of their share. Likewise I make constitute and appoint Jacob L. Klinefelter to be executor of my last Will and Testament hereby revoking all former wills by me made. In witness where of I have hereunto subscribed my name and affixed my seal the 9th day of October in the year of our Lord one thousand eight hundred and fifty eight. (Signed) Philip Keifer (seal) Witness - Peter Rummell, William Windbigler. [S249] U.S. Federal Census 1850 U.S. Federal Census, by Ancestry.com, Stamp 411. Dwelling 877. Name Variation Eva Marcia Roedel was also known as Eva Mary. Name Variation Eva Marcia Roedel was also known as Radle. Name Variation Eva Marcia Roedel was also known as E. Mary. Name Variation Eva Marcia Roedel was also known as Mary Eve. Name Variation Eva Marcia Roedel was also known as Readle. Name Variation Eva Marcia Roedel was also known as Mary Eva. Married Name 1808 As of 1808,her married name was Kifer. 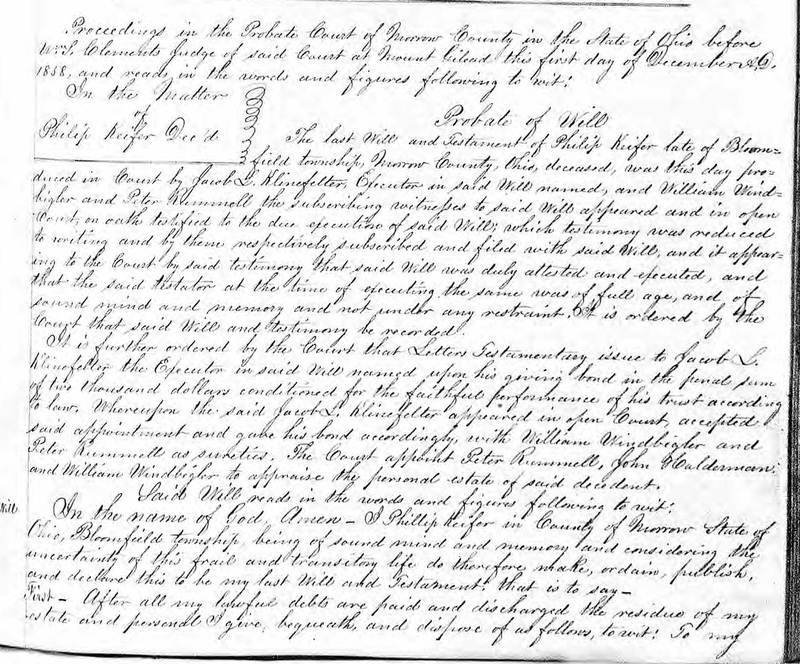 Married Name 1808 As of 1808,her married name was Kiefer. 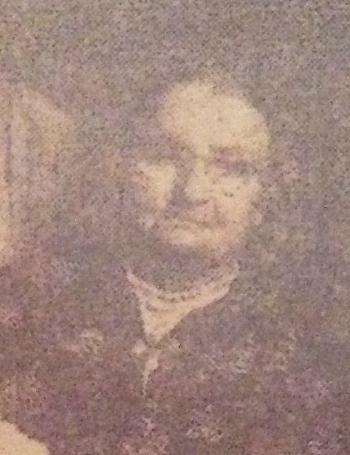 Eva Marcia Roedel was born in 1790 at Germany also reported as French. She was the daughter of Johann Heinrich Roedel and Eva Maria Handler. Eva Marcia Roedel married George Philip Keifer, son of (?) Keifer, in 1808 at Germany. Eva Marcia Roedel died on 6 August 1851 at Morrow, Ohio. She was buried after 6 August 1851 at Ross Cemetery, Morrow, Ohio, Wife of P. Age 61y. Listed as E Mary Kifer. 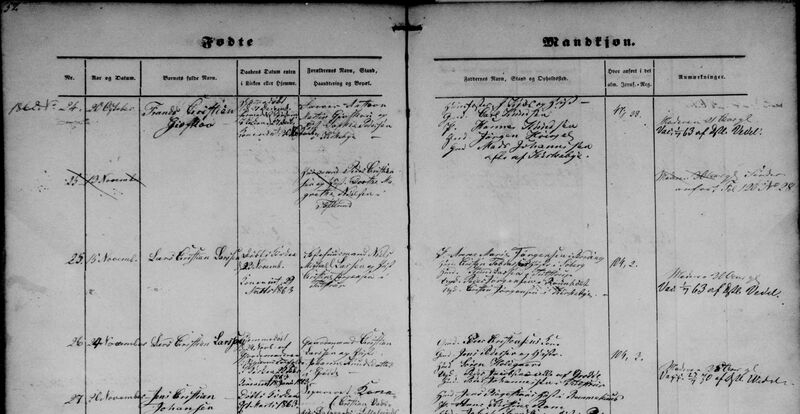 Eva Marcia Roedel and George Philip Keifer immigrated in June 1819 to ship named Elizabeth ship's captain: Morione Goonet. 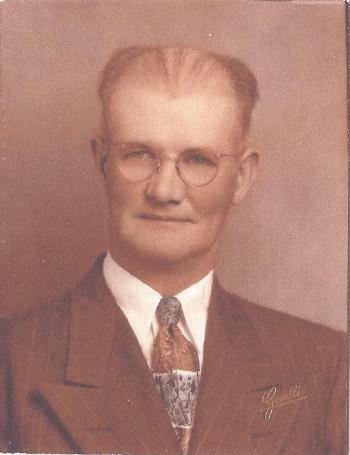 John Daniel Prater was born on 16 February 1890 at Chunky, Mississippi, also reported as Texas. 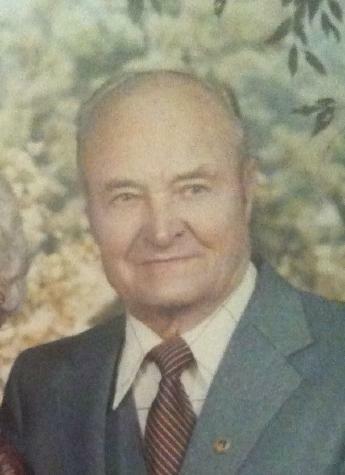 He was the son of Tandy Key Prater and Sarah Elizabeth Williams. John Daniel Prater married Leith H. Spyker, daughter of Henry Hartwell Spyker and Sarah M. Zintz, after 1910. 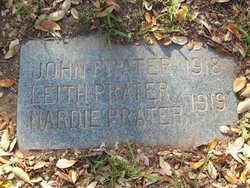 John Daniel Prater died on 20 October 1918 at Corpus Christi, Nueces, Texas, at age 28 Leith's husband had the influenza but kept on working until he took cold in rain and died in a weeks time with pneumonia - Oct 20th 1918. He was buried after 20 October 1918 at Rose Hill Memorial Park, Corpus Christi, Nueces, Texas, tombstone also lists wife Leith (Spyker) Prater and son Bernard (Nardie), who both died in the Corpus Christi storm in 1919. [S245] U.S. Federal Census 1900 U.S. Federal Census, by Ancestry.com, Dwelling 253, 254. ED26. Name Variation Agnes Myrtle Gilbertson was also known as Mertie. Name Variation Agnes Myrtle Gilbertson was also known as Myrtle Agnes. Married Name circa 1926 As of circa 1926,her married name was Mercer. 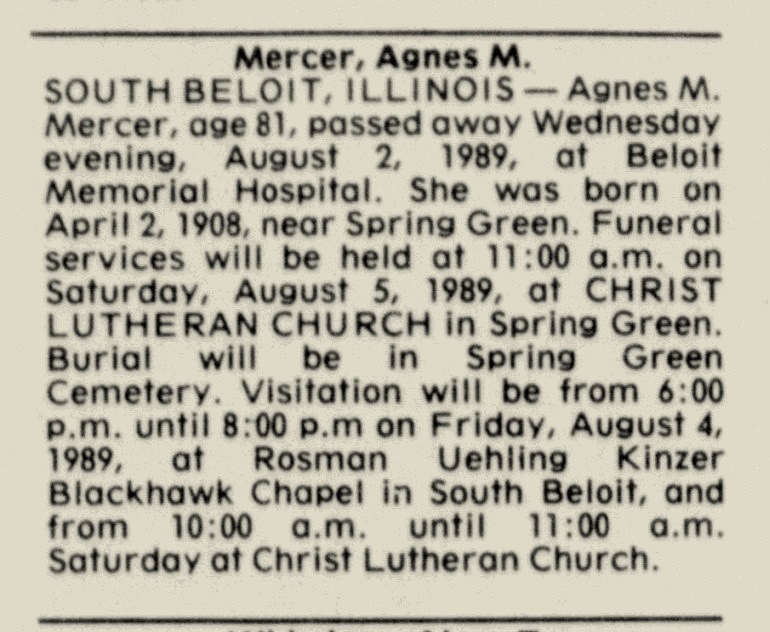 Agnes Myrtle Gilbertson was born on 2 April 1908 at near Spring Green, Sauk, Wisconsin. 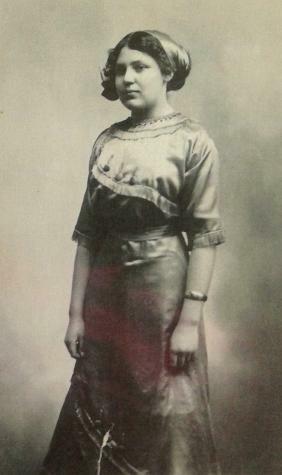 She was the daughter of Henry A. Gilbertson and Bertha Olson-Moen. 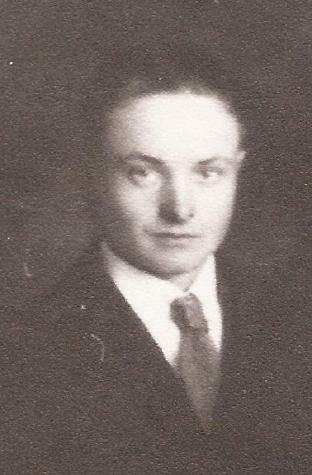 Edgar Kuth Mercer married Agnes Myrtle Gilbertson, circa 1926. She died on 2 August 1989 at Beloit Memorial Hospital, Beloit, Rock, Wisconsin, at age 81. [S180] Wisconsin Sauk Co Cemetery Records Vol 6, pg 77. [S244] U.S. Federal Census 1910 U.S. Federal Census, by Ancestry.com, Year: 1910; Census Place: Pulaski, Iowa, Wisconsin; Roll: T624_1711; Page: 12B; Enumeration District: 0063; Image: 1139; FHL Number: 1375724. [S243] U.S. Federal Census 1920 U.S. Federal Census, by Ancestry.com. [S250] U.S. Federal Census 1930 U.S. Federal Census, by Ancestry.com, ED56-34. Dwelling 32. [S373] U.S. Federal Census 1940 U.S. Federal Census, by Ancestry.com, ED56-36. Page 8b. Dwelling 132. Edgar Kuth Mercer was born on 22 August 1896 at Wisconsin. He was the son of Robert F. Mercer and Eliza Emma Witzel. 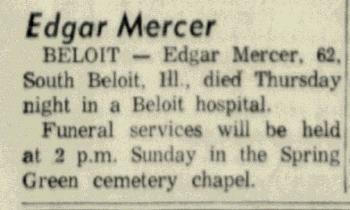 Edgar Kuth Mercer died on 26 February 1959 at South Beloit, Winnebago, Illinois, at age 62 Edgar Kuth Mercer obituary. Edgar Kuth Mercer was adopted before June 1900 at from an orphanage, Sparta, Wisconsin. On 5 June 1918 at World War I Draft Registration, Sauk, Wisconsin. He obtained US Social Security Card at Wisconsin. [S245] U.S. Federal Census 1900 U.S. Federal Census, by Ancestry.com, ED 145. Dwelling 53. Sheet 3A. [S364] Wisconsin State Census Wisconsin State Censuses, 1895 and 1905, by Ancestry.com, Dwelling 19. [S244] U.S. Federal Census 1910 U.S. Federal Census, by Ancestry.com, ED126. Sheet 9A. Stamp 22. Dwelling 8. [S243] U.S. Federal Census 1920 U.S. Federal Census, by Ancestry.com, stamp 227A line 44 Farm 68,69. ED178. Name Variation Samuel Irwin Freeborn was also known as S. I. Name Variation Samuel Irwin Freeborn was also known as Ervine. Samuel Irwin Freeborn was born on 30 April 1833 at Chautauqua, New York. He was the son of Christopher Freeborn and Mary Seton. Samuel Irwin Freeborn married Elvina Clara Howe, daughter of Squire Howe and Lucina Humphrey, on 28 October 1858 at by Rev. 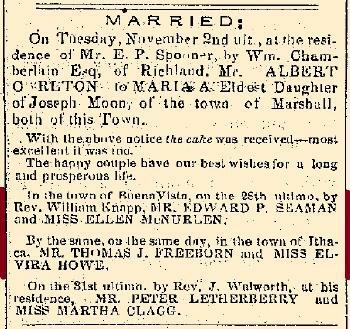 William Knapp, Buena Vista, Richland, Wisconsin, incorrectly listed as Freborn,Thomas (instead of Samuel); Thomas J (Samuel I) Freeborn and Elvira Howe marriage announcement. Samuel Irwin Freeborn married Hadassah Ann Spyker, daughter of Reverand Simon S. Spyker and Rosanna Kiefer, on 18 August 1873 at Richland, Wisconsin. 1840 Elk Creek, Erie, Pennsylvania Samuel Irwin Freeborn is counted on the census of 1840 in the household of Christopher Freeborn at Elk Creek, Erie, Pennsylvania; 1 male 50-60, 1 male 15-20, 1 male 10-15, 1 female 40-50, 1 female 15-20, 1 female 10-15. 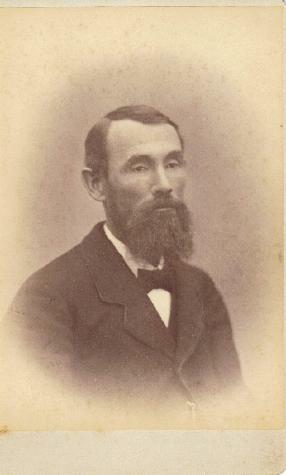 S I Freeborn, horticulturist and apiarist, first came to Richland county in 1851, with his brother-in-law, James M Cass, with whom he lived, being unmarried at that time. Soon after his arrival he engaged in the lumber business, in company with a man named Barber. They went up Pine river, cut the timber and rafted it down the stream. They had at one time 2200 logs upon the river. He was married in 1859 to Elvira Howe, a native of Canada. Two years later he settled on his present farm, on the northeast quarter of section 20, town 10 north, range 2 east. In 1856 he bought twenty colonies of bees of Green Mayfield, which were the beginning of the apiary he now owns. At present he has 320 colonies. He sold, in 1882, 28,000 pounds of honey. In the nursery business, he is the pioneer of this place. He has met with decided success, and has made large sales, for a new enterprise, and the stock being as represented, gives satisfaction and an increasing demand may be expected. In 1862 he associated A L Hatch in this business. They have at present, a nursery stock of 150,000 trees, an orchard of 4000 trees and a general stock in proportion. Mr. Freeborn is a native of New York, born in Chautauqua county, April 30, 1833. His father died when he was ten years old. Soon after, his mother was married to Thomas Pound, and the family removed to Crawford Co., Penn., where they lived until 1847. In that year they emigrated to the territory of Wisconsin and located in Dane county, making the trip in thirty days, traveling overland with teams. The subject of this sketch remained with his parents a short time, then went to Blue Mound, where his brother had charge of a stage station. He assisted him there in the care of the horses, two seasons. At the age of sixteen he went to Helena and engaged in ferrying on the Wisconsin river, two summers. During that time he ferried many persons across the river, who became settlers of Richland county. 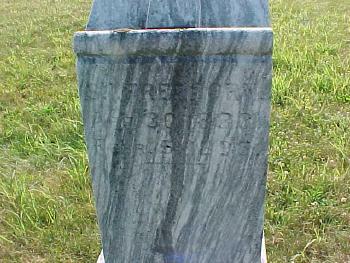 Mrs. Freeborn died in 1872, leaving three children --- Arvilla, Elmer and Ernest. In 1873 he was married to Hadassah Spyker. Two children have blessed this union --- Simon A and Lorena. Politically, Mr. Freeborn belongs to the republican party, having been identified with that organization since its formation.8 Mary Seton witnessed the migration in 1847 at Dane, Wisconsin. 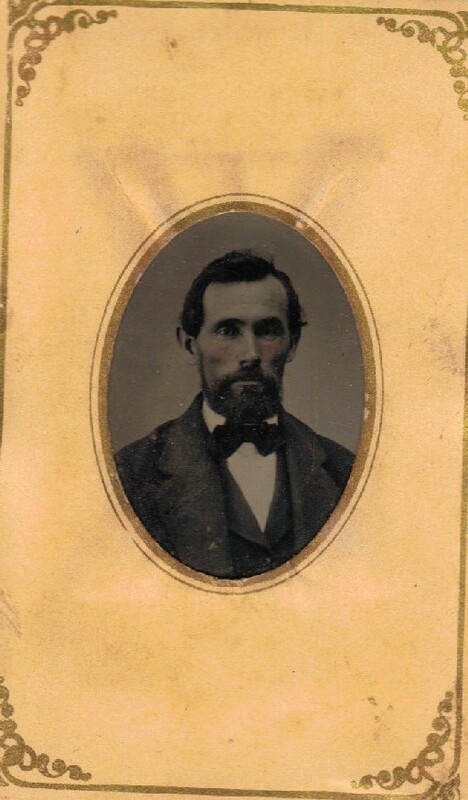 Samuel Irwin Freeborn migrated in 1851 at Richland, Wisconsin. In 1868 at Richland County Nursery, Richland, Wisconsin, This nursery was started in 1868 by S J Freeborn, at his home on section 20. In 1871 he was joined by A L Hatch, and a partnership was formed between these two gentlemen for carrying on the business. At this time the nursery was removed to sections 22 and 27, where sixty acres were purchased, forty of which were improved. Since that time other tracts of land have been purchased until they now have 160 acres, the most of which they use. Both of these gentlemen have separate orchards, aside from the nursery, Mr. Freeborn having 3500 trees and A L Hatch, 2000. The firm has been very successful in their business, and much credit is due to them for their energy and enterprise in the establishment and prosecution of this beneficial and much needed industry. In September 1880 at Ithaca, Richland, Wisconsin, Freeborn and Hatch, of Ithaca, have a most remarkable seedling apple, of which they are justly proud. Madison Wisconsin State Journal September 8, 1880 - Freeborn and Hatch, of Ithaca, have a most remarkable seedling apple, of which they are justly proud. In January 1891 at Madison, Dane, Wisconsin, Wisconsin Beekeeper conference attended by S. I. Freeborn. [S255] Wisconsin Richland County Death Index, by Wisconsin, D-435. [S220] Tales the Tombstone Tells, online http://www.monticellowi.com/RichlandCo/TalesPage66.htm, page 66. [S249] U.S. Federal Census 1850 U.S. Federal Census, by Ancestry.com, page 420. Dwelling 39. [S248] U.S. Federal Census 1860 U.S. Federal Census, by Ancestry.com, Page 61. Sheet 119. [S247] U.S. Federal Census 1870 U.S. Federal Census, by Ancestry.com, Page 6. Dwelling 50. [S246] U.S. Federal Census 1880 U.S. Federal Census, by Ancestry.com, ED263. Dwelling 48. Page 5. 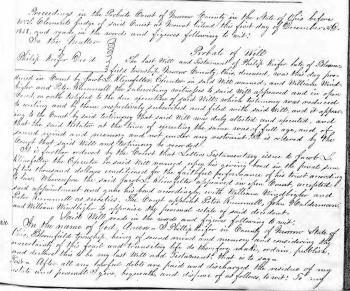 [S221] Richland Wisconsin History, online, Chapter 26 - Ithaca. 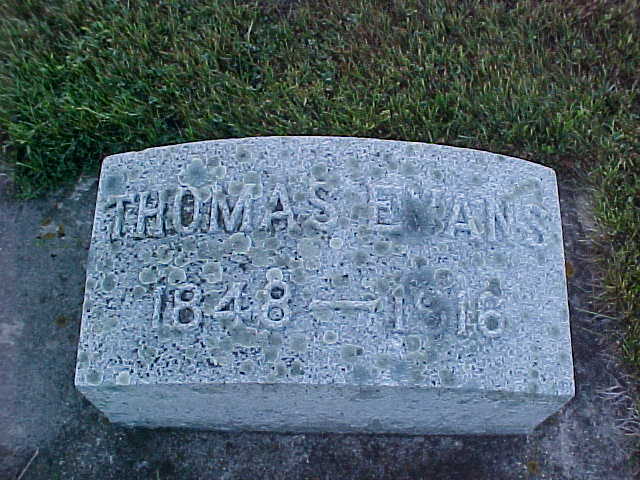 Thomas Evans was born in June 1848 at Wales. He was the son of Evan D. Evans and Jane Morgan Newgate. 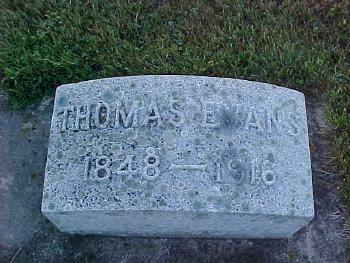 Thomas Evans married Mary Ellen Spyker, daughter of Reverand Simon S. Spyker and Rosanna Kiefer, on 19 April 1886 at Richland, Wisconsin. 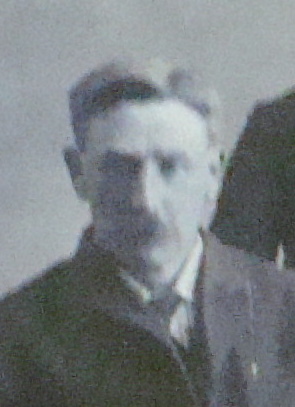 Thomas Evans died in 1916. Thomas Evans immigrated with Evan D. Evans and Jane Morgan Newgate in 1852. 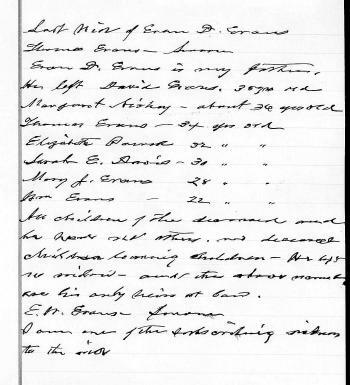 In Evan D. Evans's will dated 1882, Thomas Evans was named as executor. He was a retired farmer in 1900. He was a laborer of odd jobs in 1910. [S180] Wisconsin Sauk Co Cemetery Records Vol 6, pg 91. [S248] U.S. Federal Census 1860 U.S. Federal Census, by Ancestry.com, Page 115-116. Dwelling 881. [S247] U.S. Federal Census 1870 U.S. Federal Census, by Ancestry.com, image not available Roll: M593_1739 Page: 231 Image: 467. 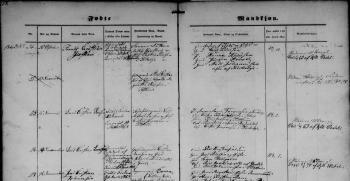 [S246] U.S. Federal Census 1880 U.S. Federal Census, by Ancestry.com, NA Film Number T9-1446 Sheet 237B. [S245] U.S. Federal Census 1900 U.S. Federal Census, by Ancestry.com, ED145. Dwelling 202. [S364] Wisconsin State Census Wisconsin State Censuses, 1895 and 1905, by Ancestry.com, Dwelling 18. [S244] U.S. Federal Census 1910 U.S. Federal Census, by Ancestry.com, ED126. Dwelling 174. Name Variation Benjamin Franklin Langdon was also known as Franklin. Name Variation Benjamin Franklin Langdon was also known as Frank. 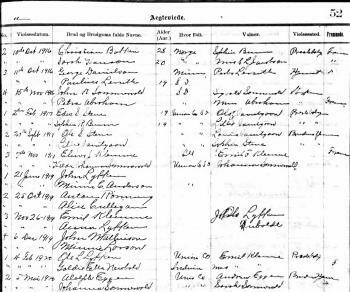 Benjamin Franklin Langdon was born on 6 August 1855 at Senecca, Crawford, Wisconsin. He was the son of Samuel Porter Langdon and Nancy Emory. Benjamin Franklin Langdon married Hattie Arnold in 1900 first marriage for him. Benjamin Franklin Langdon married Jessie Estelle Spyker, daughter of Reverand Simon S. Spyker and Rosanna Kiefer, on 19 May 1909 at second marriage for each. 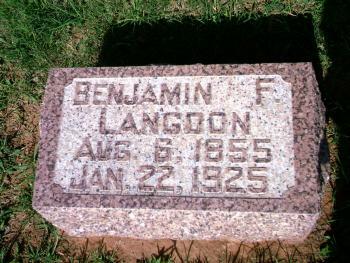 Benjamin Franklin Langdon died on 22 January 1925 at Custer, Oklahoma, at age 69. 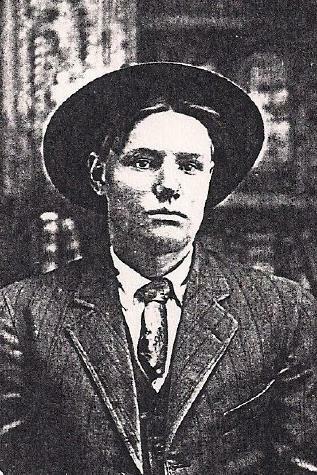 He was buried after 22 January 1925 at Greenwood Cemetery, Weatherford, Custer, Oklahoma. 1885 Lincoln, Buena Vista, Iowa Benjamin Franklin Langdon appeared on the census of 1885 in the household of Samuel Porter Langdon at Lincoln, Buena Vista, Iowa. 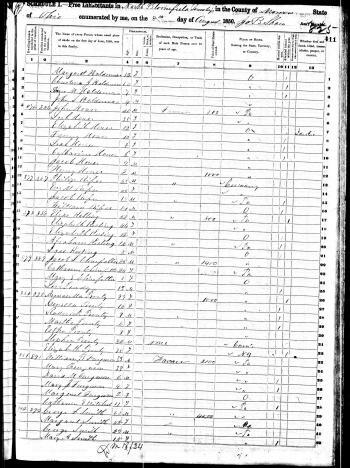 [S248] U.S. Federal Census 1860 U.S. Federal Census, by Ancestry.com, Page 99. Written number 905. Dwelling 804. [S247] U.S. Federal Census 1870 U.S. Federal Census, by Ancestry.com, Page 30. Dwelling 124. 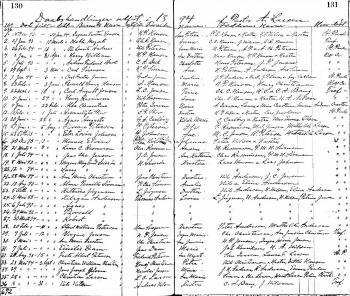 [S246] U.S. Federal Census 1880 U.S. Federal Census, by Ancestry.com, NA Film Number T9-0329 Page Number 43C. [S245] U.S. Federal Census 1900 U.S. Federal Census, by Ancestry.com, ED61. Dwelling 182. [S244] U.S. Federal Census 1910 U.S. Federal Census, by Ancestry.com, ED118. Dwelling 110. [S243] U.S. Federal Census 1920 U.S. Federal Census, by Ancestry.com, ED28. Dwelling 3. Name Variation Nathan Brown Hood was also known as N. B.
Nathan Brown Hood was born on 14 August 1840 at Butler, Pennsylvania. He was the son of Samuel Blair Hood and Sarah Jane Miller. 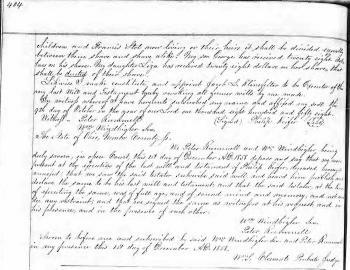 Nathan Brown Hood married Mehitabel Sweet, daughter of Abijah Sweet and Mariah Rhodes, circa 1860 at first marriage for him. 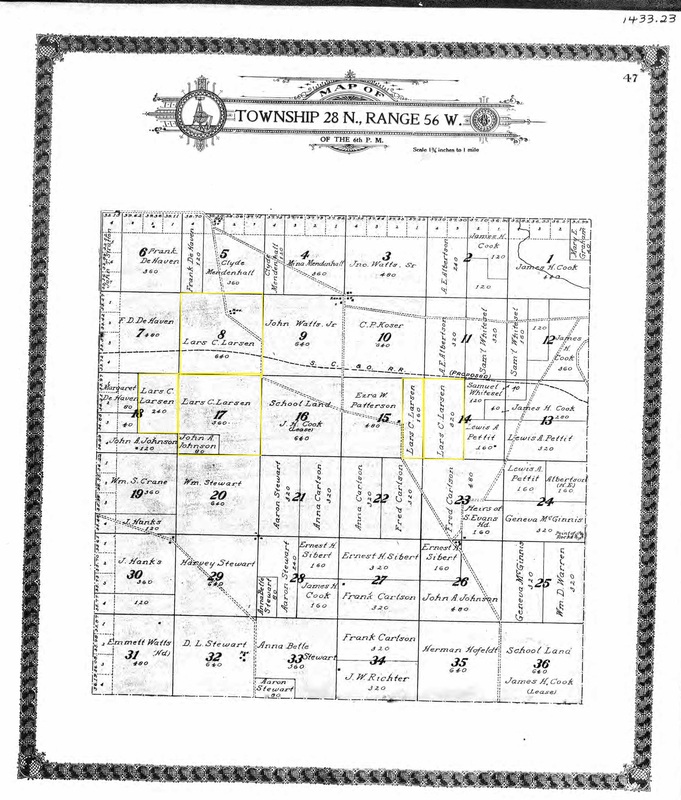 Nathan Brown Hood married Jane T. Tunnicliff on 1 January 1866 at 2nd marrige for him, Loganville, Sauk, Wisconsin. 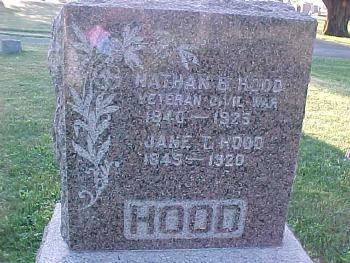 Nathan Brown Hood died on 18 December 1925 at Lone Rock, Sauk, Wisconsin, at age 85 Nathan Brown (N. B.) Hood death notice. In 1880 N. B. HOOD, farmer, Sec. 29; P. O. Lone Rock; was born in Pittsburgh, Penn., Aug. 14, 1840; he was educated at the “Iron City” College, Pittsburgh; he came to Wisconsin in 1859, locating in the town of Spring Green, Sauk County, which has been his home ever since, with the exception of the time he was in the service of the Union, and the year 1868, which he lived in Loganville, this county. In the war of the rebellion, Mr. Hood first enlisted in the Sixth Wisconsin Battery; was enrolled in September, 1861, and served in the battery until December, 1862, then was transferred to United States Signal Corps, in which he served until July, 1864, and in January, 1865, entered Co. E, 49th W. V. I., and served in that regiment until the close of the war, when he was honorably discharged. In politics Mr. Hood is an active Republican; at present writing he holds the offices of Justice of the Peace, Notary Public and Clerk of District Schools. He has been twice married; his first wife was Miss M. Sweet; she died Dec. 31, 1862; two children by the first marriage—Ida and Sylvester; his present wife was Miss Jennie Tunnicliff, of Loganville, this county; they have five children—Clarence C., Victor V., Eliza E., Adda A. and Ralph R. Mr. Hood owns a valuable farm, well located and improved. [S180] Wisconsin Sauk Co Cemetery Records Vol 6, page 80. [S249] U.S. Federal Census 1850 U.S. Federal Census, by Ancestry.com, Dwelling 132. [S248] U.S. Federal Census 1860 U.S. Federal Census, by Ancestry.com, Page 124. Dwelling 943. [S247] U.S. Federal Census 1870 U.S. Federal Census, by Ancestry.com, Page 13. Stamp 234. Dwelling 31. [S246] U.S. Federal Census 1880 U.S. Federal Census, by Ancestry.com, NA Film Number T9-1446 Page Number 230C. [S246] U.S. Federal Census 1880 U.S. Federal Census, by Ancestry.com, 1880 Census for Sauk Co, Spring Green: pg 1 #9,10. [S245] U.S. Federal Census 1900 U.S. Federal Census, by Ancestry.com, ED145. Dwelling 61. [S244] U.S. Federal Census 1910 U.S. Federal Census, by Ancestry.com, ED126. Dwelling 33. [S243] U.S. Federal Census 1920 U.S. Federal Census, by Ancestry.com, ED178. Dwelling 56. Name Variation August G. Baumgarten was also known as A. G.
August G. Baumgarten was born on 30 October 1860 at Barum, Hanover, Germany. He was the son of Friedrich Baumgarten and Wilhelmine Katherina Henrietta Estorf. August G. Baumgarten married Katherina Licht, daughter of Friedrick Licht and Dorothea (? ), on 28 November 1884 at Loganville, Sauk, Wisconsin. 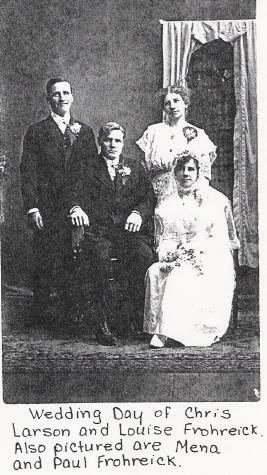 August G. Baumgarten married Bertha Huebing, daughter of Frederick Huebing and Elizabeth Geffert, on 19 March 1899 at Loganville, Sauk, Wisconsin. 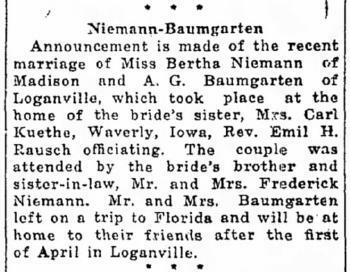 August G. Baumgarten married Bertha A. Niemann, daughter of Henry Friedrich Niemann and Anna Margaretha Hasz, in March 1918 at Iowa Announcement is made of the recent marriage of Miss Bertha Niemann of Madison and A. G. Baumgarten of Loganville, which took place at the home of the bride's sister, Mrs. Carl Kuethe, Waverly, Iowa, Rev. Emil H. Rausch officiating. 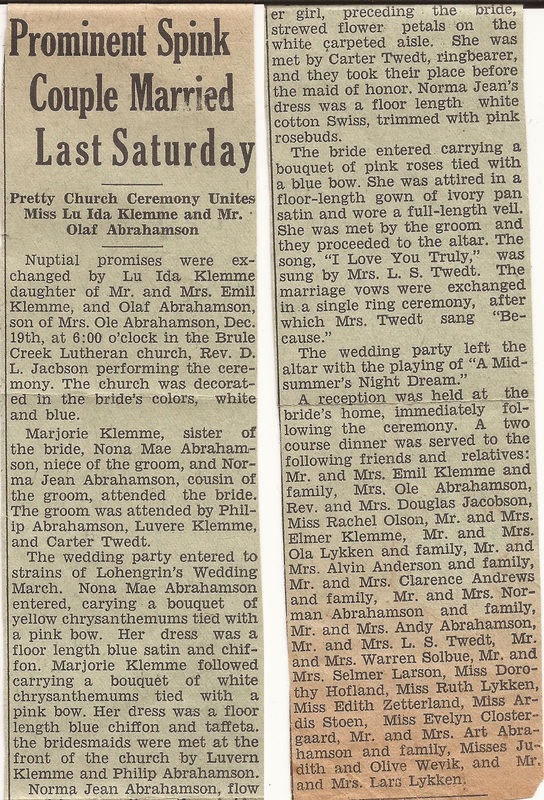 The couple was attended by the bride's brother and sister-in-law, Mr. and Mrs. Frederick Niemann. Mr. and Mrs. Baumgarten left on a trip to Florida and will be at home to their friends after the first of April in Loganville. 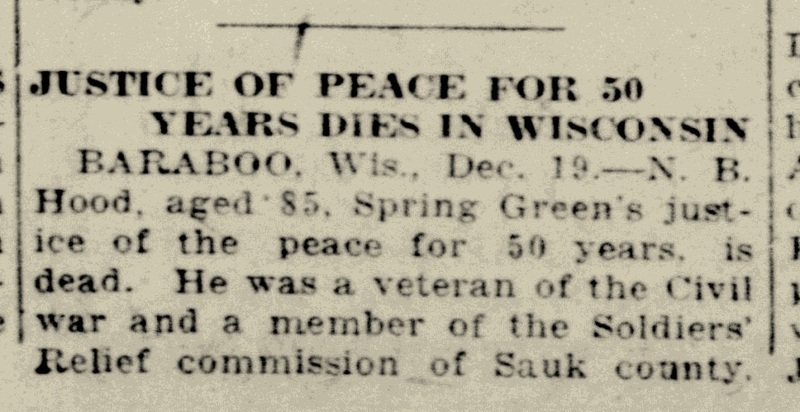 (published in The Capital Times, Madison, WI, 09 Mar 1918). 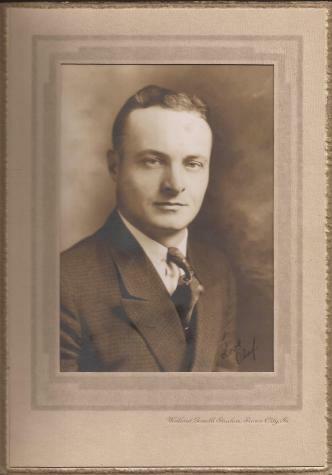 August G. Baumgarten died on 21 October 1948 at Baraboo, Sauk, Wisconsin, at age 87 August G. Baumgarten age 88 years, passed away Thursday afternoon at St Mary's Ringling hospital after a week's illness. He came to this country from Germany about 85 years ago and settled with his parents on a farm in the Township of Westfield. In 1890 he started a farm implement business in Logaville. He also operaed an implement store at Rock Springs for a number of years. In l935 he retired and moved to Baraboo where he has made his home since. He is survived by his wife and five sons and daughters, Mrs. Edward Koenecke, Reedsburg; Mrs. Dean DuBois; Mrs. John Hughes, Madison; Lawrence of Milwaukee and Harold of Reedsburg. 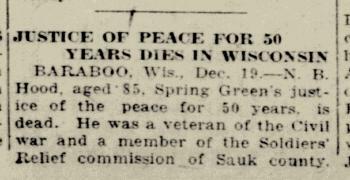 He also leaves to mourn his eighteen grand children, five great grandchildren, two brothers, Otto Meyer of Rock Springs, and Fred Baumgarten of Baraboo, one sister Mrs. Henry Schultz of the town of Westfield, and many other relatives and friends. Funeral services will be held on Monday Afternoon at two o-clock at St. John's Lutheran church. Rev. H.C.Kirchner officiating. Burial will be in St. Peters cemetery in Loganville. He was buried after 21 October 1948 at St. Peters Cemetery, Loganville, Sauk, Wisconsin. Bertha Huebing, and by his second marriage there were four children, namely: Edwin, Lawrence, Levera and Harold. He and Bertha A. Niemann lived in 1935 at Loganville, Sauk, Wisconsin, as reported in 1940 census. [S247] U.S. Federal Census 1870 U.S. Federal Census, by Ancestry.com, Year: 1870; Census Place: Westfield, Sauk, Wisconsin; Roll: M593_1739; Page: 295B; Image: 598; Family History Library Film: 553238. [S246] U.S. Federal Census 1880 U.S. Federal Census, by Ancestry.com, Year: 1880; Census Place: Westfield, Sauk, Wisconsin; Roll: 1446; Family History Film: 1255446; Page: 280C; Enumeration District: 265. [S245] U.S. Federal Census 1900 U.S. Federal Census, by Ancestry.com, ED132. Dwelling 2. [S244] U.S. Federal Census 1910 U.S. Federal Census, by Ancestry.com, ED130. Dwelling 27. Stamp 62. [S243] U.S. Federal Census 1920 U.S. Federal Census, by Ancestry.com, ED171. Dwelling 39. Sheet 2B. [S250] U.S. Federal Census 1930 U.S. Federal Census, by Ancestry.com, ED56-22. Dwelling 36. 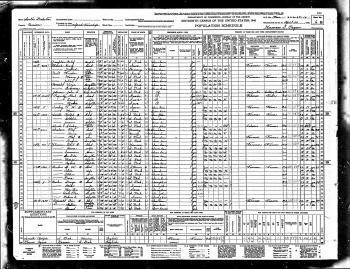 [S373] U.S. Federal Census 1940 U.S. Federal Census, by Ancestry.com, Year: 1940; Census Place: Baraboo, Sauk, Wisconsin; Roll: T627_4523; Page: 15B; Enumeration District: 56-2. Name Variation Emma Dorothea Steckelberg was also known as Emilie. Married Name 22 June 1904 As of 22 June 1904,her married name was Niemann. Emma Dorothea Steckelberg was born at Wisconsin on 1 December 1882. She was the daughter of Frederick Steckelberg and Augusta Wilhelmina Uphoff. Emma Dorothea Steckelberg married Henry George Niemann, son of Henry Friedrich Niemann and Anna Margaretha Hasz, on 22 June 1904 at Sauk, Wisconsin. 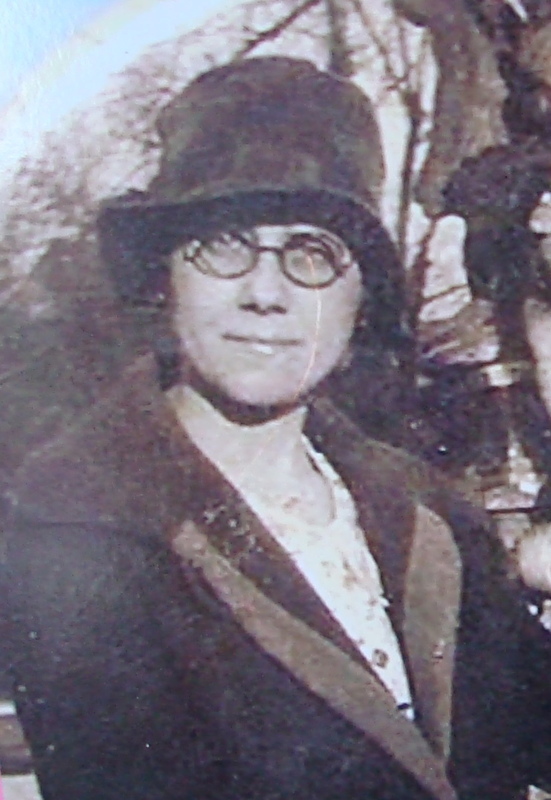 Emma Dorothea Steckelberg died on 12 March 1965 at Wisconsin, at age 82. 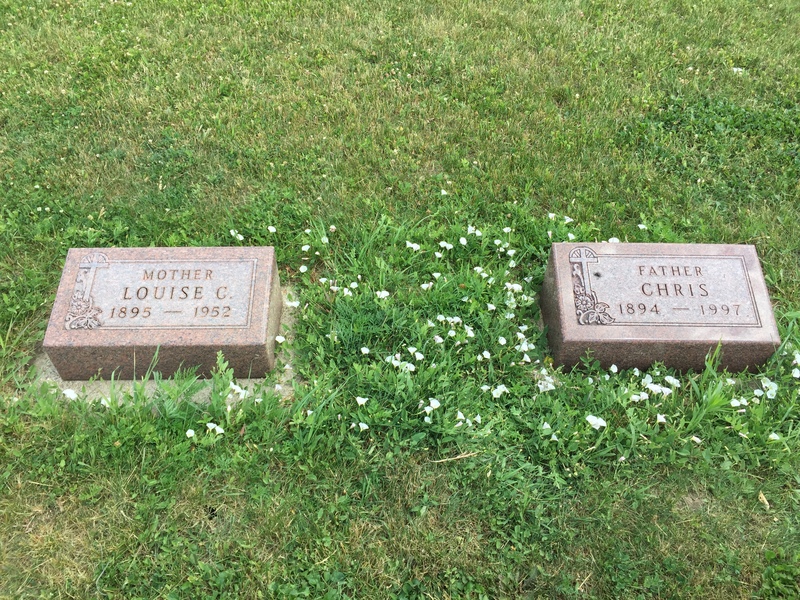 She was buried after 12 March 1965 at St. Peter's Lutheran Cemetery; row 9, Westfield, Sauk, Wisconsin. On 10 March 1930 Fred Steckelberg, 72, injured. On 20 June 1954 at Loganville, Sauk, Wisconsin, Henry and Emma (Steckelberg) Niemann 50th wedding anniversary celebration. 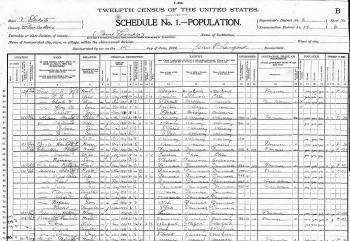 [S244] U.S. Federal Census 1910 U.S. Federal Census, by Ancestry.com, ED 130. Sheet 1A. Dwelling 10. [S243] U.S. Federal Census 1920 U.S. Federal Census, by Ancestry.com, ED 171. Sheet 1B. Dwelling 16. [S250] U.S. Federal Census 1930 U.S. Federal Census, by Ancestry.com, ED56-22. Sheet 1A. Dwelling 16. 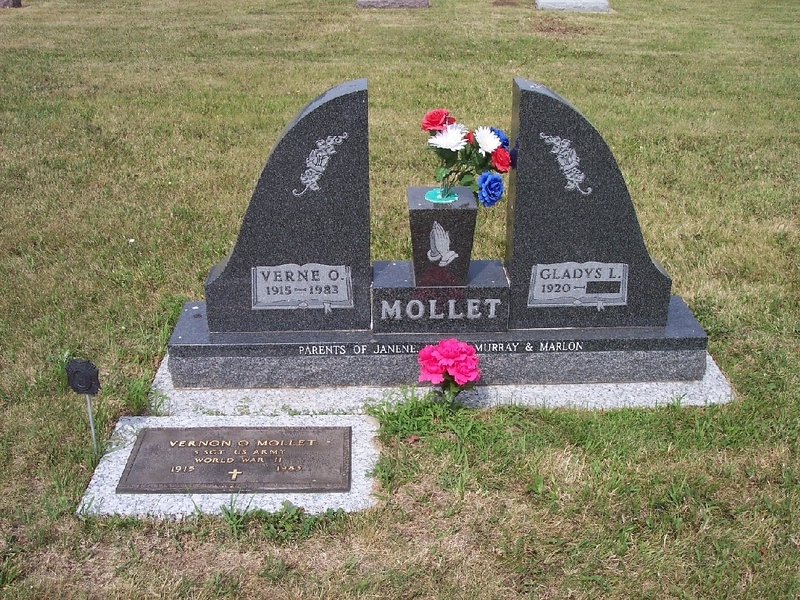 Name Variation Vernon Otis Mollet was also known as Verne. 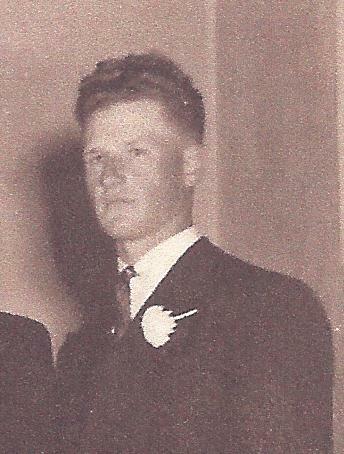 Vernon Otis Mollet was born on 12 July 1915 at Clearfield (near Winner), Tripp, South Dakota. He was the son of Ernest Franklin Mollet and Ellen Charlotte Carlson. Vernon Otis Mollet died on 13 June 1983 at VA Hospital; from brain cancer; suffered from depression and alcoholism, Sioux Falls, South Dakota, at age 67 Vernon Mollet, 67, Alcester, died Monday (June 13, 1983) in a hospital in Sioux Falls. 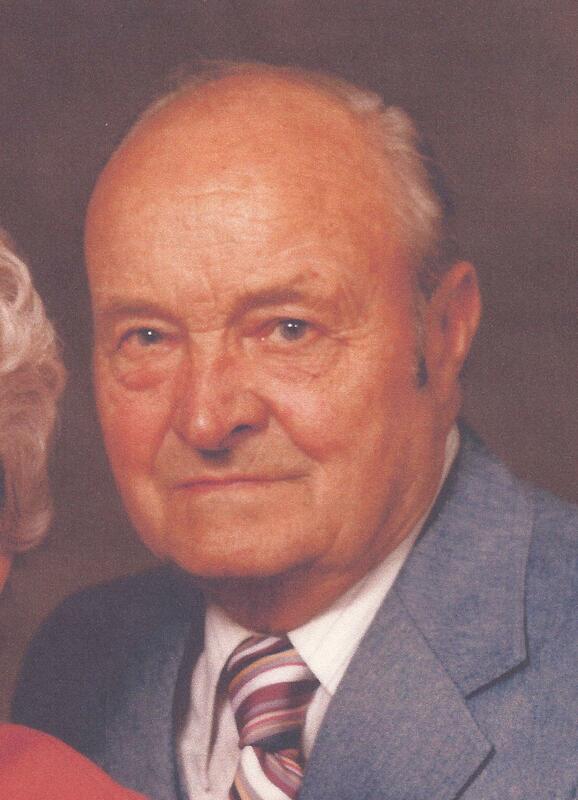 The funeral will be Thursday 2 p.m. in Nathanael Lutheran Church, Alcester, with the Rev. Charles Peterson officiating. Burial will be in Pleasant Hill Cemetery under the direction of Wass Funeral Home, Alcester. 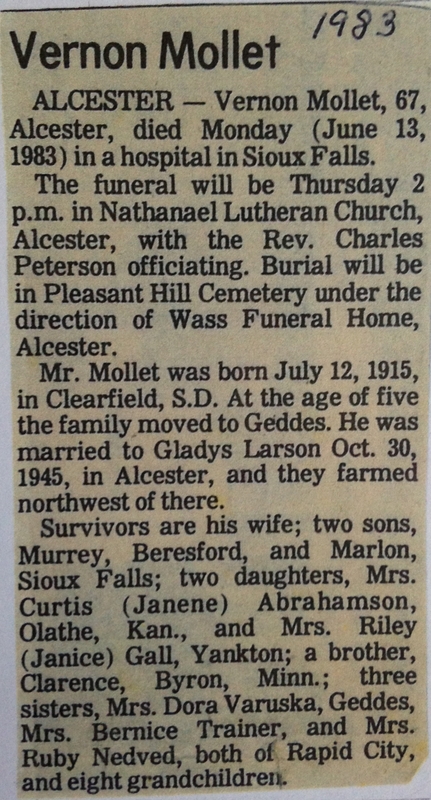 Mr. Mollet was born July 12, 1915, in Clearfield, S.D. 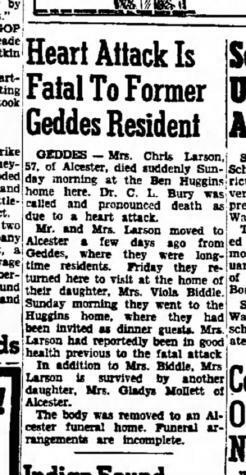 At the age of five the family moved to Geddes. 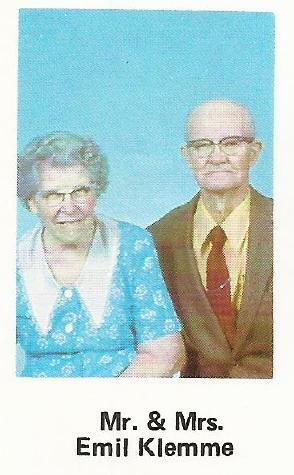 He was married to Gladys Larson Oct. 30, 1945, in Alcester, and they farmed northwest of there. Survivors are his wife; two sons, Murrey, Beresford, and Marlon, Sioux Falls; two daughters, Mrs. Curtis (Janene) Abrahamson, Olathe, Kan., and Mrs. Riley (Janice) Gall, Yankton; a brother, Clarence, Byron, Minn; three sisters, Mrs. Dora Varuska, Geddes, Mrs. Bernice Trainer, and Mrs. Ruby Nedved, both of Rapid City, and eight grandchildren. 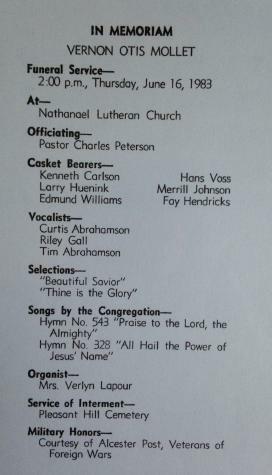 He was buried on 16 June 1983 at Nathanael Lutheran Church & Pleasant Hill Cemetery, Alcester, Union, South Dakota. 1935 Geddes ward 3, Charles Mix, South Dakota Vernon Otis Mollet appeared on the census of 1935 in the household of Ernest Franklin Mollet at Geddes ward 3, Charles Mix, South Dakota. Mollet brothers - standing Clarence, Al Seated Ed and Vern. 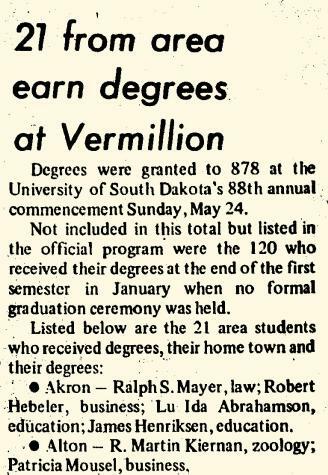 Vernon Otis Mollet graduated in 1933 at Geddes High School, Geddes, Charles Mix, South Dakota. 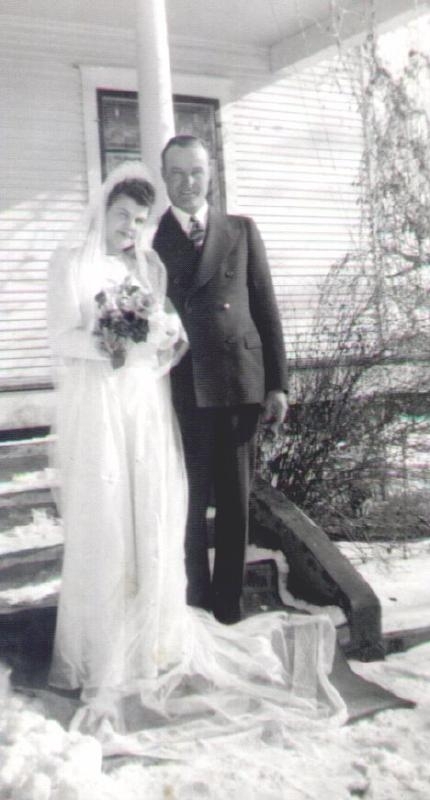 On 22 December 1940 Chris and Louise Larson - 25th wedding anniversary - 22 Dec 1940. Handwriting by Gladys Larson Mollet. On 23 February 1942 at military enlistment in Army. He began military service on 27 June 1942. He ended military service on 12 October 1945. On 10 April 1947 at spent Easter Sunday at the home of Mr and Mrs. Chris Larson. He obtained US Social Security Card at South Dakota; Last residence Alcester, Union, South Dakota. On 25 August 1955 Mr and Mrs George Steeneck of Hawarden, Mr and Mrs Vern Mollet and family and Mr and Mrs Forrest Sappingfield and family were guests in the Herman Smearman home Thursday evening in honor of Mrs Smearman's birthday. Before 1968 Verne and his dad Ernie Mollet. On 18 February 1968 at Hawarden, Iowa, Mr. and Mrs. Oscar Gibson of Canton were honored on their 40th wedding anniversary Sunday, February 18, at the home of their daughter, Mrs. J. Lawrence Schiefen of rural Hawarden. Dinner guests included Mr. and Mrs. Clifford Faughender and Gaylen and Mrs. Hannah Paulson, all of Geddes, South Dakota, and Mrs. Dorothy Schiefen of Hawarden. Friends and relatives who came in the afternoon to surprise the honored couple were Mr. and Mrs. Ernest Gibson of Tyndall, South Dakota; Mr. and Mrs. Norman Gibson, Mrs. Herb Olson and Mrs. Glen Jerke of Avon, South Dakota; Mr. and Mrs. Fred Strehlow and Vicky and Mr. and Mrs. Chester Vipond of Hudson; Mr. and Mrs. Verne Mollet and Mrs. Martha Smearman of Alcester; Mr. and Mrs. Virgil Biddle, Verla and Glenda of Garretson, South Dakota, and Mr. and Mrs. Rudolph Twedt of Canton. At the close of the social afternoon lunch was served by the hostess. On 5 July 1972 at Qualm family reunion. [S243] U.S. Federal Census 1920 U.S. Federal Census, by Ancestry.com, ED 40. Sheet 7B. Dwelling 34. [S250] U.S. Federal Census 1930 U.S. Federal Census, by Ancestry.com, ED12-8. Dwelling 55. [S373] U.S. Federal Census 1940 U.S. Federal Census, by Ancestry.com, Year: 1940; Census Place: Geddes, Charles Mix, South Dakota; Roll: T627_3851; Page: 9A; Enumeration District: 12-8. Name Variation Chris Larson was also known as Christen. Name Variation Chris Larson was also known as Christian. 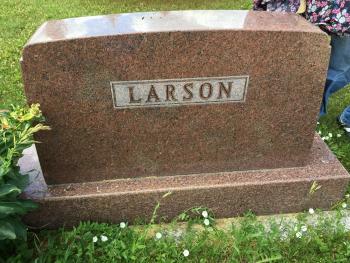 Name Variation Chris Larson was also known as Larsen. Chris Larson was born on 28 May 1894 at near Blair, Washington, Nebraska, also reported as Bancroft, Nebraska; also reported as 28 May 1893. 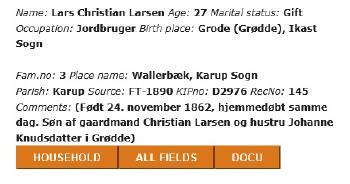 He was the son of Lars Chris Larsen and Ane Maria Pedersen. 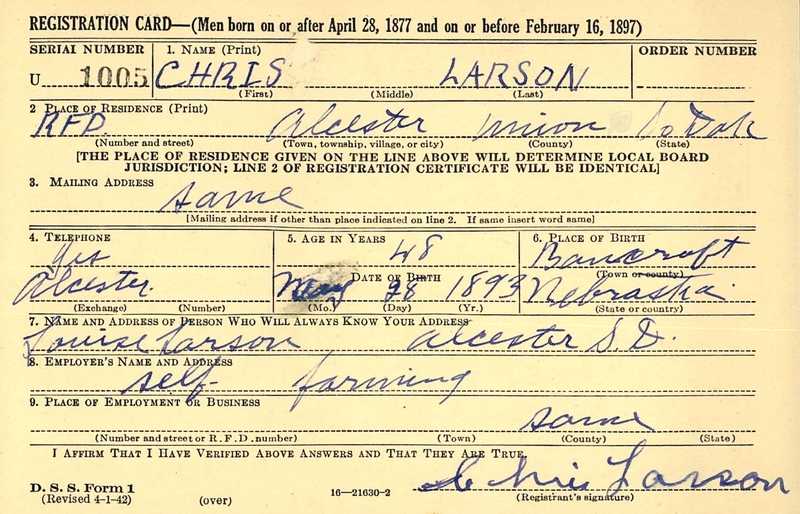 Chris Larson was baptized on 2 September 1894 at St Paul Lutheran Church, Orum, Nebraska. 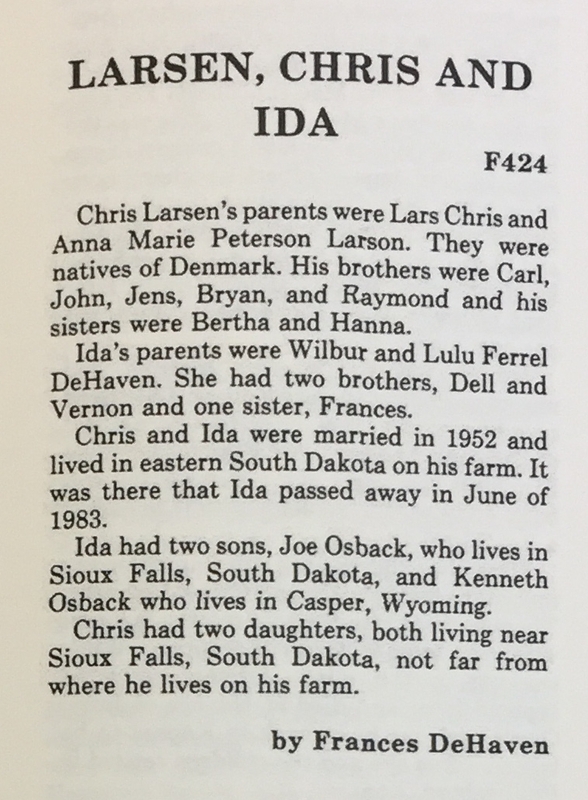 Chris Larson married Ida Olive DeHaven, daughter of Wilbur LeRoy DeHaven and Lulu May Ferrel, on 9 October 1952 at Morrill, Nebraska. Chris Larson died on 9 April 1997 at age 102. He was buried after 9 April 1997 at Pleasant Hill Cemetery aka Alcester Cemetery, Alcester, Union, South Dakota. 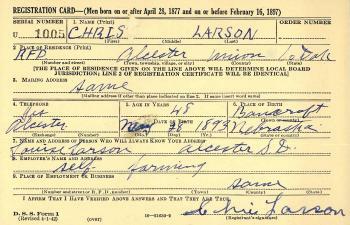 Chris Larson obtained US Social Security Card at South Dakota; last residence Alcester, Union, South Dakota. Family photo. 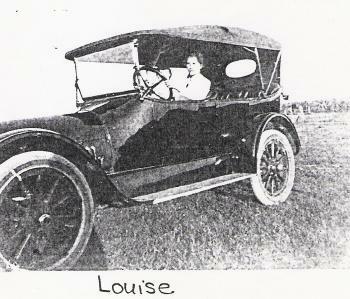 He and Louise Christine Frohreich were photo by car. 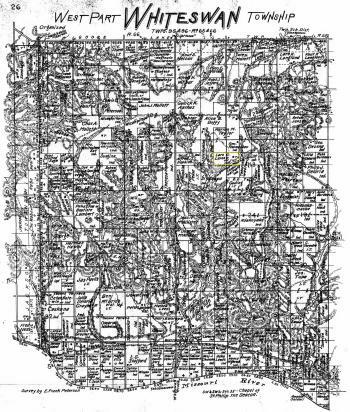 He purchased land in 1917 at Bought 200 acres east of, Geddes, Charles Mix, South Dakota. On 5 June 1917 at World War I Draft Registration, Charles Mix, South Dakota. He was ill with which left Chris in a coma for 10 weeks on 4 June 1934 at had stroke. He was a farmer in 1940. On 22 December 1940 Chris and Louise Larson - 25th wedding anniversary - 22 Dec 1940. Handwriting by Gladys Larson Mollet. He migrated in 1941 at Came to, Union County, South Dakota. 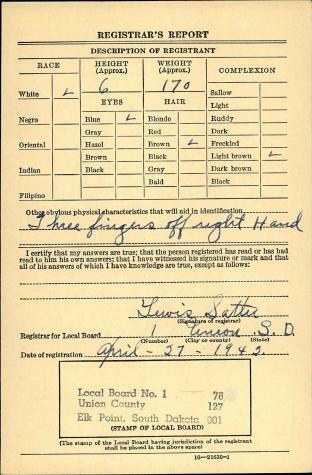 In 1942 at World War II Draft Registration, Charles Mix, South Dakota. 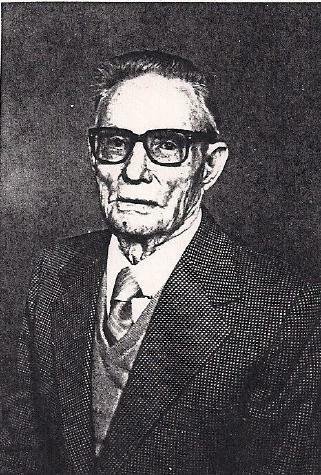 He purchased land in 1944 at Bought 200 acres east of, Alcester, Union, South Dakota. 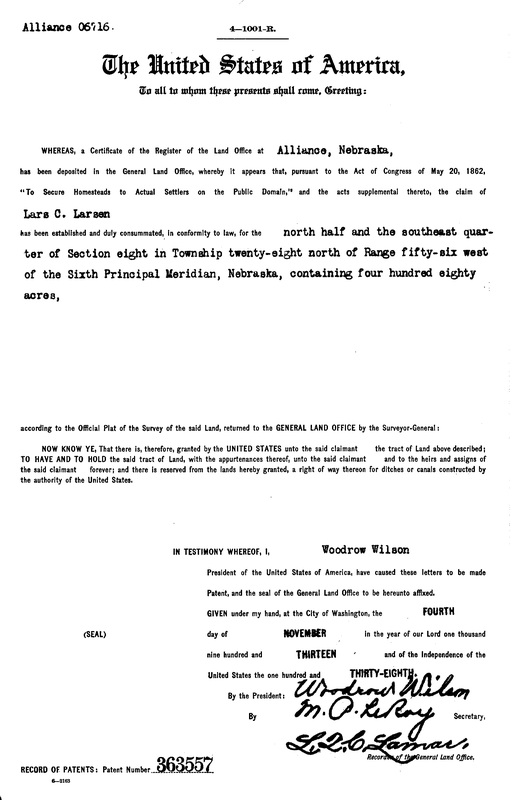 He purchased land in 1945 at Bought Dean place northwest of, Alcester, Union, South Dakota. On 10 April 1947 at spent Easter Sunday at the home of Mr and Mrs. Chris Larson. 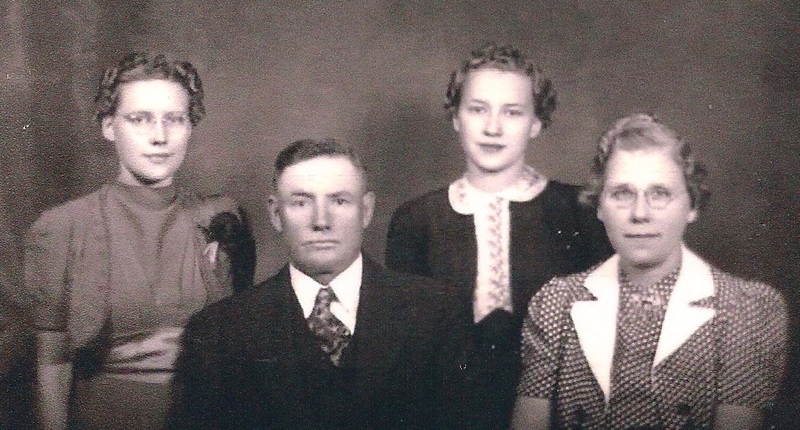 Circa 1948 Great-Grandma Mary Larsen, baby girl Mollet, Grandpa Chris Larson and Gladys Mollet. On 7 September 1967 at Ed Gunderson family reunion Including Chris Larson and Hannah Paulson - The Daily Republic (Mitchell, SD). In May 1993 Chris Larson, well-known farmer and cattle feeder of the Alcester area for many years will be 99 years old on May 28. In those ninety-nine years Chris endured some unbelievable experiences, close calls and terrible hardships which he survived only with his one-in-a-million blend of perseverance, determination and endurance. In the settlement of South Dakota and the development of farming practices into the modern, mechanized system of the present time several stages of development have occurred. Usually we think of this as the work of people of two or three generations. Seldom do we find in the lifetime of one person the experience of homesteading on the prairie, breaking the sod and living through thee experiences of depression, drought and dust storms, two world wars and then continuing on and participating in the age of modern farming, and this in the lifetime of a person who is still living and remembering this history. In his 99 years, Chris has lived and experienced the whole range of the settlement and development of South Dakota farming. He remembers prairie fires, devastating droughts, grasshoppers that ate everything in sight and lots of hard times. A few years ago Chris Larson sat down with a tape recorder and with a keen sense of memory described many of the events of his life, some stories almost unbelievable but as Chris says time after time on his tapes, "Now you people of today might not believe this, but it's absolutely true." And all who know Chris know that if he says so you can believe it. This is the storey of Chris's life where he lived it, in Charles Mix county, South Dakota, in the Nebraska panhandle around Harrison and the last half of his life in Union county around Alcester. Chris's parents, Lars and Mary Larsen were born, grew up and married at Viborg, Denmark, where his father, Lars, served in the Danish Army. Three sons were born to them in Denmark. 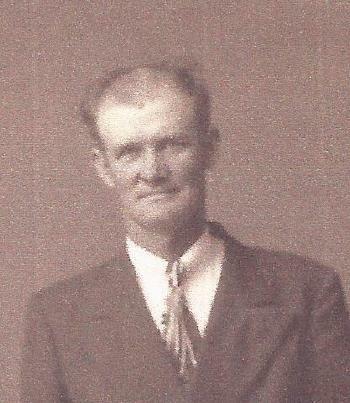 Lars came to America alone in 1888 and three years later his wife and three sons came to America to join him at Blair, Nebraska, where he had farm work. One son died while they were at Blair and three other children were born there, Chris and a brother and sister. In 1897 they family loaded up in a covered wagon and moved to Charles Mix county, South Dakota, and settled on a farm one mile east and one mile north of the old Mansbridge store in Moore township. Three years later they moved to a different farm about a mile east. While there a tornado took every building except the house, so they moved again, this time to a farm four west and two south of Lake Andes, a farm with a lot of extremely hilly ground. His father had Chris and his brother and sister go down to tat farm the summer before they moved there and put up hay for the winter. Chris was only about eight, his brother 12 and his sister 10. With a team and buckrake and pitchforks the three children stayed here and stacked hay for two or three weeks. Chris learned to work hard at an early age. Later that fall the family moved down to the hilly farm west of Lake Andes. Chris remembers it as a place that required a lot of hard work. He remembers his mother shearing eighty sheep with a hand clipper. There were acres of hill pasture which had to be fenced which required many days of cutting posts by the Missouri river and putting in the fences. Then a prairie fire might come along and burn a lot of the posts and it was back to more post cutting and fencing. At this time Christ was not quite old enough to split rock and put in fence posts. It was his job to ride the rented pasture land which is now the town of Lake Andes. When the town of Lake Andes was built Chris's father helped haul the lumber for the town and also for the building of Geddes. One day Chris neglected his pasture duties for a bit and picked up 17 eggs somewhere which he sold for twenty cents at a saloon and bought some cigarette paper and piece of candy, (a rare luxury). One time when Chris was 12 his brother Bryan was ten, the boys were sent with four horses to a farm near Geddes to stay by themselves and plow with a walking plow. They had to stand on a box to reach high enough to harness the team. After a time they became so lonesome that they turned the horses loose, knowing they would go home and thus they got to spend one night at home, eight miles away. After a few years on the farm by Lake Andes his father decided to take up a homestead in the panhandle of Nebraska. Horses, cows, machinery and household furnishing were loaded on one of the so called emigrant trains, destination Harrison, Nebraska. 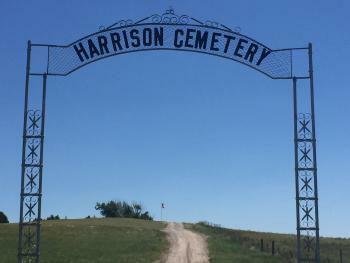 At Harrison they unloaded and by team and wagon made their way 22 miles south till they came to knoll on the prairie where Chris said his father stated, "this is where we'll have our farm." The wagon was emptied and over a small trench which they had dug in the ground, the empty wagon box was turned over. This was the shelter for the family until a small house was erected. They had left eight or ten horses back at Lake Andes so Chris's father had to return to bring them out for use on their Nebraska farm, just six miles from the Wyoming line. A small house and barn were built and they began breaking sod and planting crops. The following year, 1909, Chris started school, mostly all older kids and such a rough bunch that the teacher stood it for only about two months and then quit. Chris's years as a young lad around Harrison were filled with some rugged experiences. One winter a very severe snowstorm killed hundreds of cattle, mostly those of the large ranchers in the area along the Niobrara river. The cattle drifted with the storm into the river and were covered with snow and suffocated. The only thing salvageable was the hide. He remembers hayracks, loaded with hides, pulled by four horses, coming into Harrison where the hides were shipped out by rail. 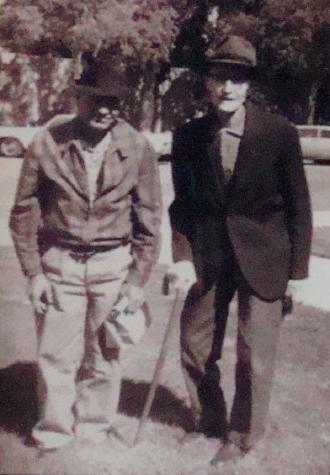 Chris worked that winter for a rancher named Jack Berett and was in charge of feeding 200 head of cattle. After the storm he rode for hours trying to locate them. When he was ready to give up he noticed steam coming from a huge snowbank. He got help to scoop them out and not a one died. There on the ranch at Harrison he learned to handle and break horses. He spent most of his free time breaking wild horses to ride for use on buggies or machinery. He had a riding horse which he could ride into Harrison across country jumping over any fences they encountered not having to open the fifteen to twenty gates along the way. The next year Chris's sister and brother-in-law, who were farming east of Geddes in South Dakota decided that they wanted to homestead in Nebraska too. Chris's father decided that it would be a good idea if he rented their farm at Geddes and had Chris go back to South Dakota to farm it. So with spring approaching they took a couple of teams of horses, two wagons and few other pieces of farm equipment and loaded them on the train at Harrison for the trip back east. One passenger was allowed to ride along with the freight, so rather than buy a ticket, Chris hid under the wagon box. He had been seen earlier there with his father so the railroad men became suspicious. They found him and was put off the train. 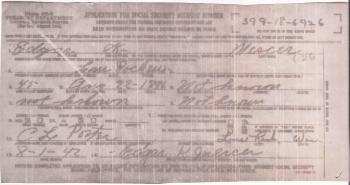 He had to buy a ticket on a passenger train and caught up with his father at Norfolk. There they took the railroad spur north to the town of Niobrara, Nebraska, where they would cross the Missouri into South Dakota. They unloaded from the train, hooked up their teams and prepared to drive across the Missouri on the ice. Warm weather had caused the ice to honeycomb. They were told to walk beside their wagons as far as the harness lines would reach, then if the wagons broke through they would have a chance to save themselves. They made it across safely to Running Water on the South Dakota side. The next day, heading for the farm at Geddes and caught in a snowstorm, spring seemed a long ways away. The storm became severe and they stopped at a farm near Tyndal where they were invited in for the night with the family who, Chris said, "were a Bohemian family, wonderful people." The next morning when the storm lad eased up and they were leaving, Chris's father asked what they owned for the several meals and feed for the horses. He remembers that the amount asked was only about four or five dollars but his father had only a larger bill and the farmer had no change for it. "You'll be going through Wagner, just leave the money at the bank there" said the farmer host. Chris was impressed at the trust that man had in them, two complete strangers. They completed the trip the next day to the farm east of Geddes and Chris got his few essential pieces of household furniture and supplies put away and then a few days later it was time for his father to head back to Harrison. With a team and buggy Chris took his father to Bonesteel, crossing the Missouri again, to make the trip back on the stagecoach which was still a major means of transportation in that area where railroads were not yet available to all towns. As soon as the snow melted and the ground dried up a bit Chris started the spring plowing with the old walking plow that they had brought back from Nebraska. An old neighbor, named Larsen, (a Dane but not a relative) and his wife came along in their top buggy, headed for Geddes. The kindly old neighbor walked over to where Chris was plowing with the dilapidated walking plow and said, "You'll never raise a crop in ground plowed like that, nothing but lumps that look like a hog has been rooting here. You've got to have a better plow than that." Chris said he had no money to get a better plow. "Don't worry about that," his neighbor said, "I'm going to Geddes now, I'll get you a new plow and pay for it." Thanks to that kind and generous neighbor, that afternoon someone from Rice Brothers Implement in Geddes brought out to Chris a new plow that did a good job of plowing and it was a plow with a seat on it! This was real progress, a riding plow. Later Chris's father paid for the plow. 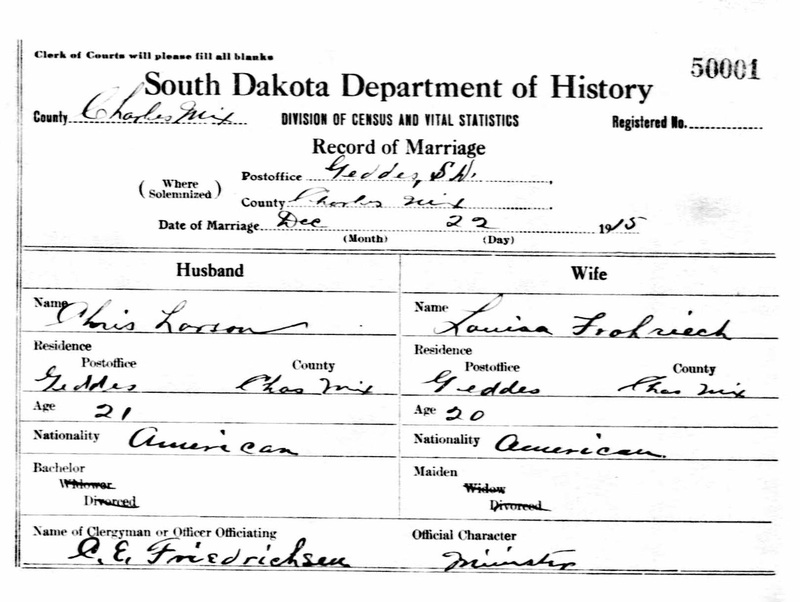 [S342] South Dakota, South Dakota Marriage Certificates, 1905-1949, Spouse: Chris Lorson. [S342] South Dakota, South Dakota Marriage Certificates, 1905-1949. [S245] U.S. Federal Census 1900 U.S. Federal Census, by Ancestry.com, ED79. Dwelling 134. [S244] U.S. Federal Census 1910 U.S. Federal Census, by Ancestry.com, ED230. Stamp 247. Dwelling 125. [S243] U.S. Federal Census 1920 U.S. Federal Census, by Ancestry.com, ED41. Dwelling 119. [S250] U.S. Federal Census 1930 U.S. Federal Census, by Ancestry.com, ED12-20. Dwelling 60. [S373] U.S. Federal Census 1940 U.S. Federal Census, by Ancestry.com, Year: 1940; Census Place: Rhoda, Charles Mix, South Dakota; Roll: T627_3851; Page: 4B; Enumeration District: 12-26. [S394] Inc. Harrison Community Club, Sioux County (NE) History, First 100 Years, pages 98-99. [S394] Inc. Harrison Community Club, Sioux County (NE) History, First 100 Years, page 503. 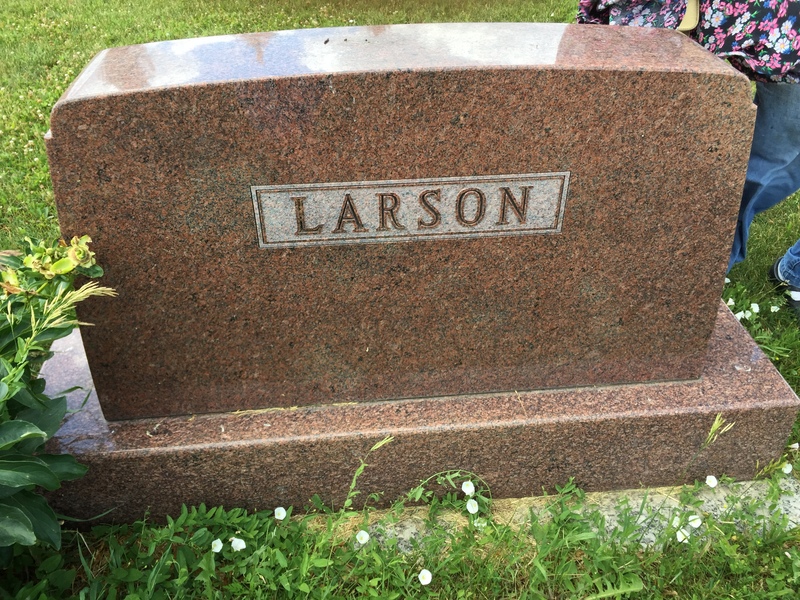 Married Name 22 December 1915 As of 22 December 1915,her married name was Larson. Married Name 22 December 1915 As of 22 December 1915,her married name was Larsen. 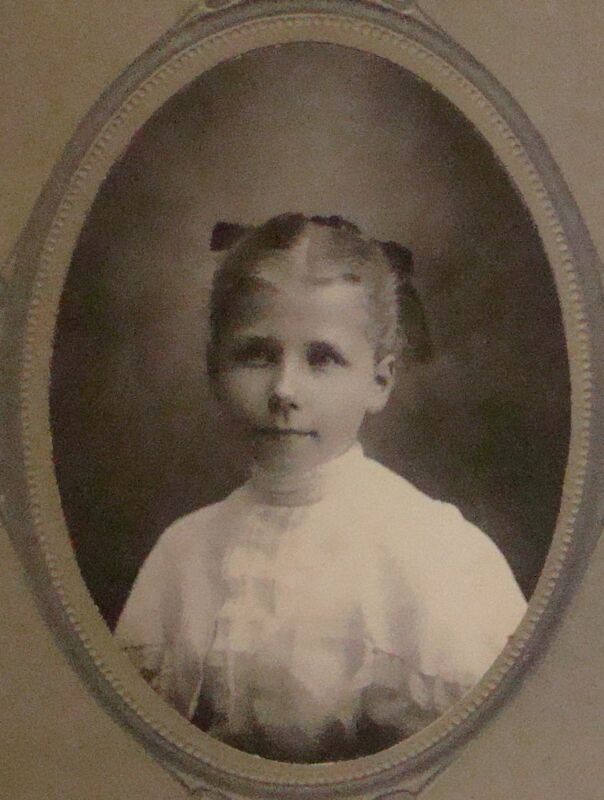 Louise Christine Frohreich was born on 20 June 1895 at Yankton, South Dakota, also reported as Jun 1896. She was the daughter of Friedrich Wilhelm Frohreich and Sarah Mader. 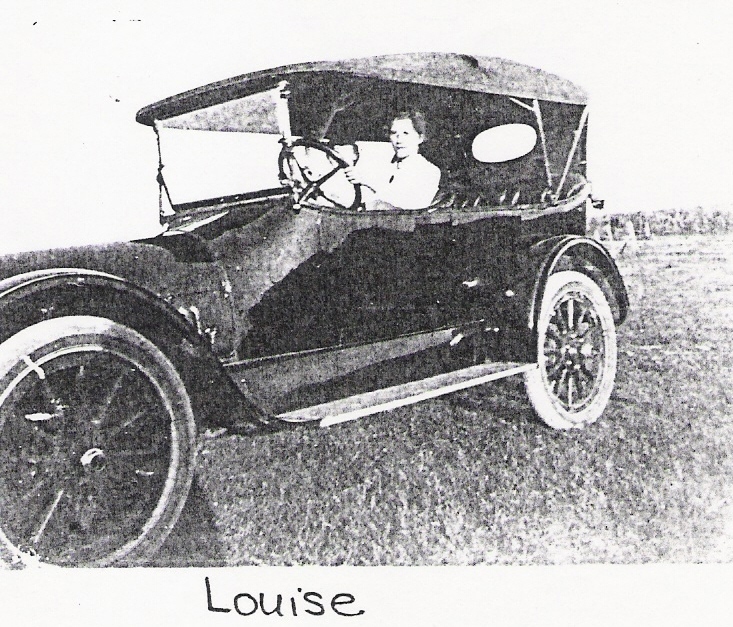 Louise Christine Frohreich died on 16 March 1952 at heart attack, Geddes, Charles Mix, South Dakota, at age 56 also reported as Alcester, Union county, SD. 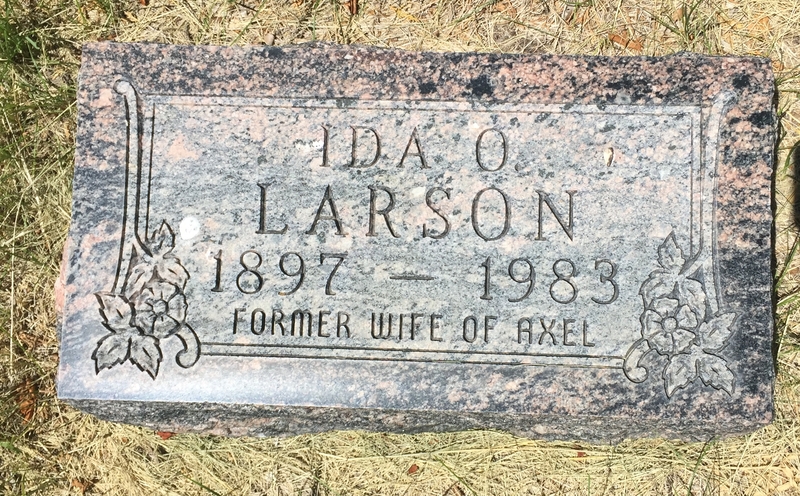 She was buried on 20 March 1952 at Pleasant Hill Cemetery aka Alcester Cemetery, Alcester, Union, South Dakota. 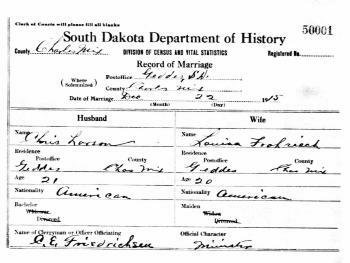 1905 South Dakota Louise Christine Frohreich appeared on the census of 1905 in the household of Friedrich Wilhelm Frohreich at South Dakota. Louise Christine Frohreich and Chris Larson were photo by car. In 1920 Viola, Louise and baby Gladys Larson 1920. On 22 December 1940 Chris and Louise Larson - 25th wedding anniversary - 22 Dec 1940. Handwriting by Gladys Larson Mollet. 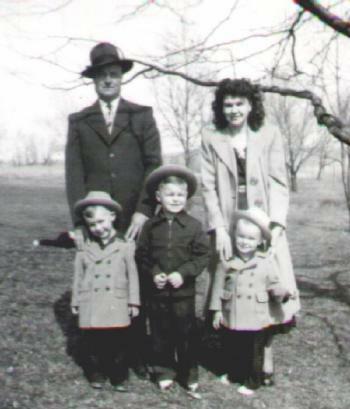 On 10 April 1947 at spent Easter Sunday at the home of Mr and Mrs. Chris Larson. 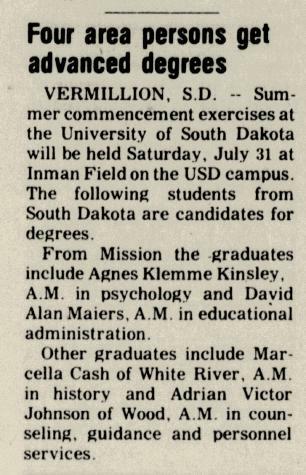 On 7 September 1967 at Ed Gunderson family reunion Including Chris Larson and Hannah Paulson - The Daily Republic (Mitchell, SD). [S245] U.S. Federal Census 1900 U.S. Federal Census, by Ancestry.com, ED74. Dwelling 116. 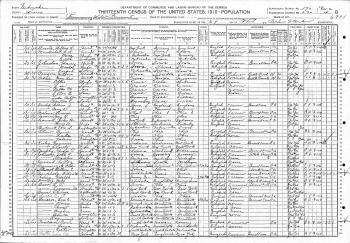 [S244] U.S. Federal Census 1910 U.S. Federal Census, by Ancestry.com, ED90. Dwelling 34. Name Variation Viola Marie Larson was also known as Vi. Married Name 20 September 1941 As of 20 September 1941,her married name was Biddle. 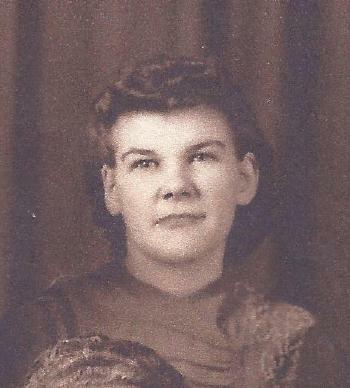 Viola Marie Larson was born on 13 October 1917 at South Dakota. She was the daughter of Chris Larson and Louise Christine Frohreich. 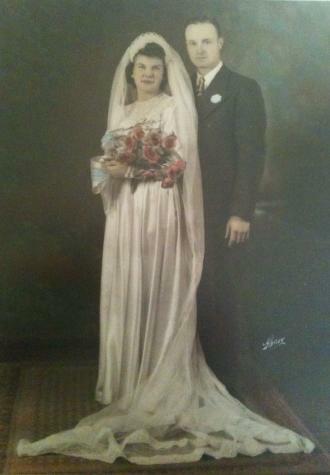 Viola Marie Larson married Virgil P. Biddle, son of Orville George Biddle and Gertrude Marie Miller, on 20 September 1941. Viola Marie Larson died on 7 April 2012 at age 94 Viola "Vi" Biddle, 94, died Saturday, April 7, 2012, at the Sanford Foundation Hospice Cottage. Funeral service will begin at 11:00 AM on Monday, April 9, 2012, at Zion Lutheran Church in Garretson, SD with burial to follow at 2:30 PM at Pleasant Hill Cemetery in Alcester, SD. The family will be present to greet friends for visitation from 5:00 to 7:00 PM on Sunday, April 8 at George Boom Funeral Home in Sioux Falls. Among those who survive and gratefully shared her life are her four children: Verla Biddle, Sioux Falls, SD, Glenda Jonson (Arnie), Ottertail, MN, Virginia Biddle, Minnetonka, MN, Gary Biddle (Hannele), Charlotte, NC; Four grandchildren, six great-grandchildren; four step-grandchildren; four step great-grandchildren; 12 nieces and nephews, her sister, Gladys Mollet of Alcester, SD and sister-in-law, Pat Biddle of Geddes. 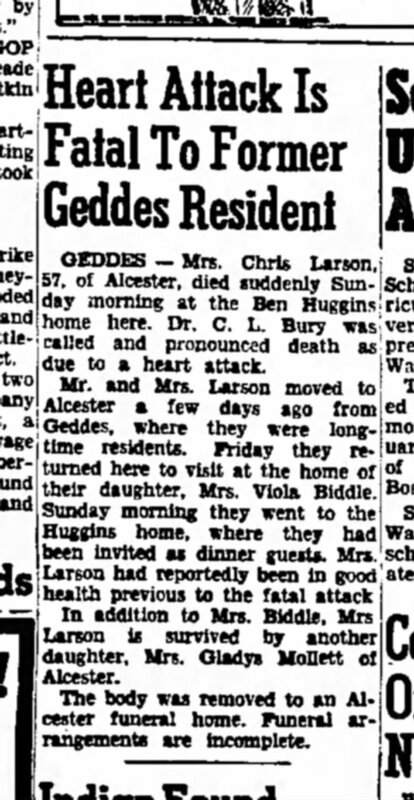 She was preceded in death by her husband, Virgil, in December, 1991, her parents, Chris and Louise Larson, step-mother Ida Larson, her father and mother-in-law, Orville and Sarah Biddle of Geddes, brothers-in-law Leonard (Pete), Robert and John (Jack) Biddle. She was buried after 7 April 2012 at Pleasant Hill Cemetery, Alcester, Union, South Dakota. Family photo. 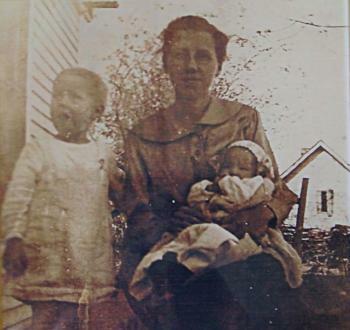 In 1920 Viola, Louise and baby Gladys Larson 1920. 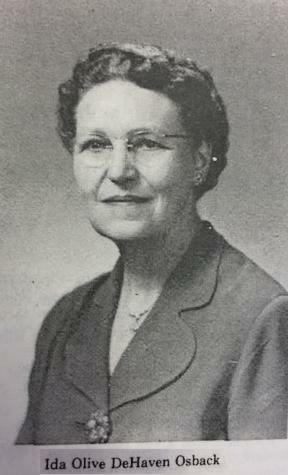 Viola Marie Larson was a secretary at real estate office in 1940. On 22 December 1940 Chris and Louise Larson - 25th wedding anniversary - 22 Dec 1940. Handwriting by Gladys Larson Mollet. 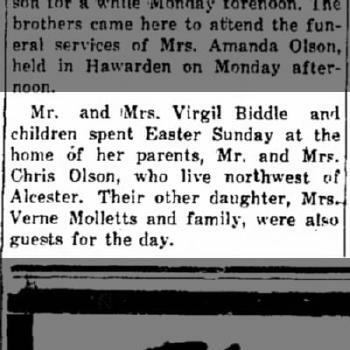 On 10 April 1947 at spent Easter Sunday at the home of Mr and Mrs. Chris Larson. 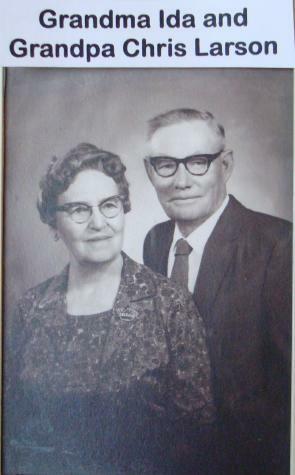 On 18 February 1968 at Hawarden, Iowa, Mr. and Mrs. Oscar Gibson of Canton were honored on their 40th wedding anniversary Sunday, February 18, at the home of their daughter, Mrs. J. Lawrence Schiefen of rural Hawarden. 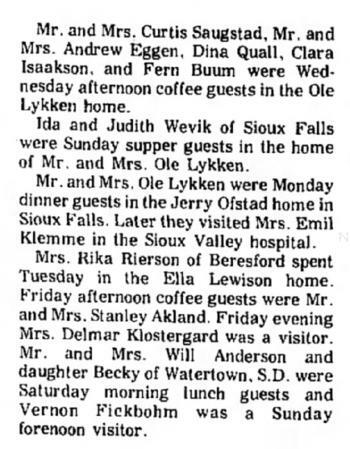 Dinner guests included Mr. and Mrs. Clifford Faughender and Gaylen and Mrs. Hannah Paulson, all of Geddes, South Dakota, and Mrs. Dorothy Schiefen of Hawarden. Friends and relatives who came in the afternoon to surprise the honored couple were Mr. and Mrs. Ernest Gibson of Tyndall, South Dakota; Mr. and Mrs. Norman Gibson, Mrs. Herb Olson and Mrs. Glen Jerke of Avon, South Dakota; Mr. and Mrs. Fred Strehlow and Vicky and Mr. and Mrs. Chester Vipond of Hudson; Mr. and Mrs. Verne Mollet and Mrs. Martha Smearman of Alcester; Mr. and Mrs. Virgil Biddle, Verla and Glenda of Garretson, South Dakota, and Mr. and Mrs. Rudolph Twedt of Canton. At the close of the social afternoon lunch was served by the hostess. In 2007 Viola Biddle and kids at her 90th birthday. Married Name 1917 As of 1917,her married name was Osback. Married Name 1943 As of 1943,her married name was York. Married Name 9 October 1952 As of 9 October 1952,her married name was Larson. Married Name 9 October 1952 As of 9 October 1952,her married name was Larsen. 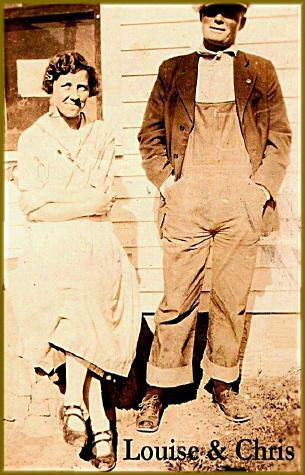 She was the daughter of Wilbur LeRoy DeHaven and Lulu May Ferrel. 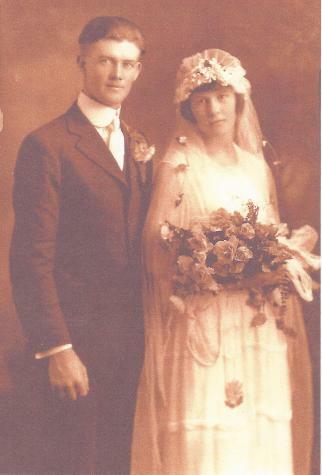 Ida Olive DeHaven married Axel Vernhardt Osback in 1917 at Harrison, Nebraska. 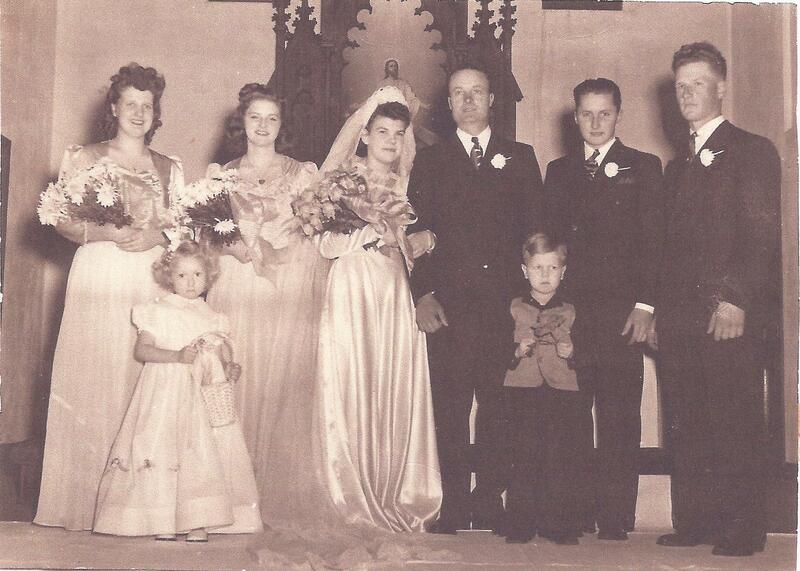 Ida Olive DeHaven married Roy Otis York, son of William Addison York Jr. and Sarah Jane Mattson, in 1943. 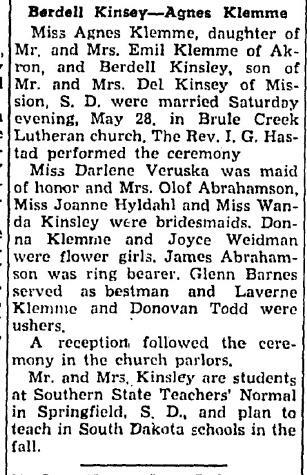 Ida Olive DeHaven married Chris Larson, son of Lars Chris Larsen and Ane Maria Pedersen, on 9 October 1952 at Morrill, Nebraska. Ida Olive DeHaven died on 27 June 1983 at age 86 Ida Larson, 86, Alcester, died Monday at Bethesda Home for the Aged, Beresford. Ida DeHaven was born Jan. 30, 1897, near Hay Springs, Neb. 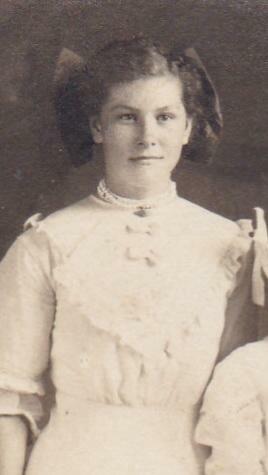 She moved with her parents south of Harrison, Neb., in 1908. She taught school for a short time before her marriage to Axel Osback in 1917 at Harrison. They moved to Akron, Ohio. 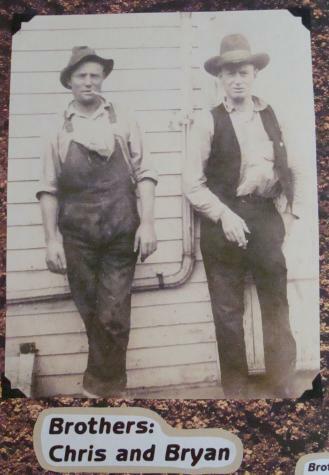 They later moved to Sioux County where they farmed and ranched until 1931. They then moved to Harrison where they operated a dairy farm. Her husband died in 1938. She continued to operate the dairy farm. In 1943, she married Roy York. They lived in Mitchell, Neb. He died in 1849. In October 1952, she married Chris Larson at Morrill, Neb. They had lived on a farm near Alcester since. 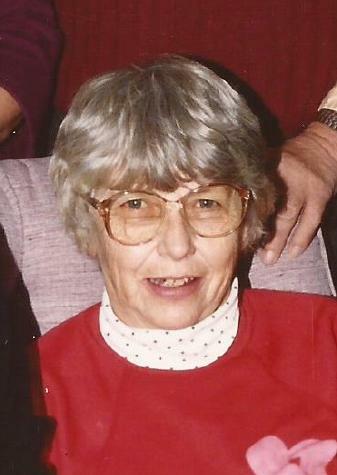 Survivors include her husband; two sons, Joe Osback, Sioux Falls, and Kenneth Osback, Casper, Wyo; four stepdaughters; 11 grandchildren; 19 great-grandchildren; and one brother, Vernon DeHaven, Puyallup, Wash. Services will be 10 a.m. Wednesday at United Methodist Church in Beresford. There will be a second service at 2p.m Thursday at United Methodist Church in Harrison. Burial will be in Harrison cemetery. Visitation will be 9a.m. to 9p.m. today at Wass Funeral Home, Alcester, S.D. She was buried after 27 June 1983 at Harrison City Cemetery, Harrison, Sioux, Nebraska. 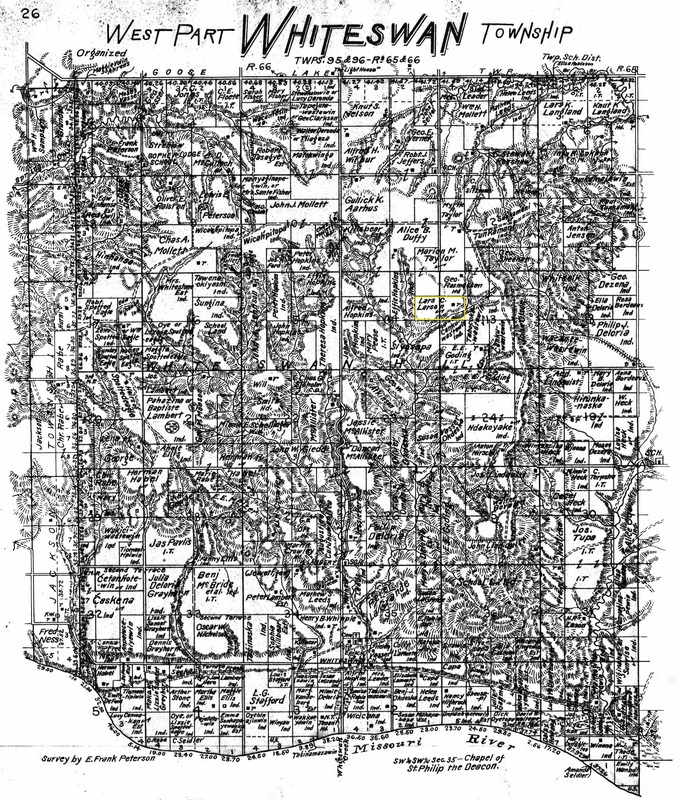 [S18] Sioux County, Sioux County History. [S245] U.S. Federal Census 1900 U.S. Federal Census, by Ancestry.com, ED79. Dwelling 38. [S244] U.S. Federal Census 1910 U.S. Federal Census, by Ancestry.com, ED230. Dwelling 100. 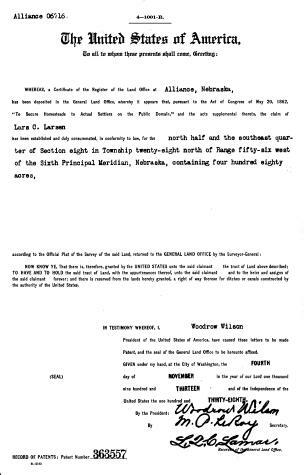 [S243] U.S. Federal Census 1920 U.S. Federal Census, by Ancestry.com, Year: 1920;Census Place: Panhandle, Sioux, Nebraska; Roll T625_999; Page: 1B; Enumeration District: 251; Image: 1114. [S250] U.S. Federal Census 1930 U.S. Federal Census, by Ancestry.com, Year: 1930; Census Place: Bowen, Sioux, Nebraska; Roll 1293; Page: 2B; Enumeration District: 4; Image: 992.0. [S394] Inc. Harrison Community Club, Sioux County (NE) History, First 100 Years, page 379. 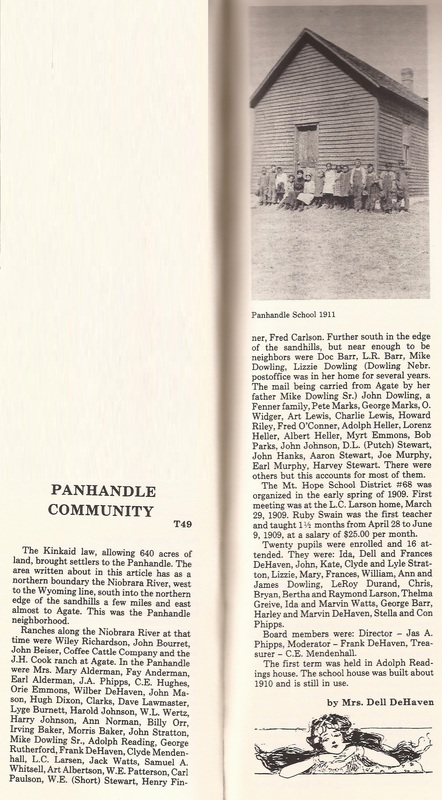 [S394] Inc. Harrison Community Club, Sioux County (NE) History, First 100 Years, pages 379-380. Lars Larsen family. Back: Jens, Chris, Hannah. Middle: Lars, Bryan, Anna. Front: Raymond, Bertha. Name Variation Lars Chris Larsen was also known as L. C.
Name Variation Lars Chris Larsen was also known as Lars Christian. Name Variation Lars Chris Larsen was also known as Lars Christen. 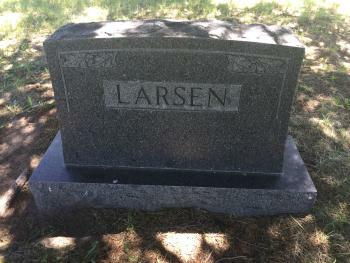 Name Variation Lars Chris Larsen was also known as Larson. Name Variation Lars Chris Larsen was also known as Christ. He was the son of Christian Larsen and Johanne Knudsdatter. Lars Chris Larsen witnessed the baptism of Hannah Larsen on 16 June 1892 at St Paul Lutheran Church, Orum, Nebraska. 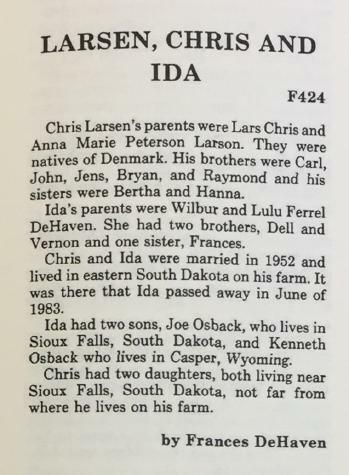 Lars Chris Larsen witnessed the baptism of Chris Larson on 2 September 1894 at St Paul Lutheran Church, Orum, Nebraska. Lars Chris Larsen witnessed the baptism of Bryan William Larsen on 22 October 1899 at First Lutheran Church, Lake Andes, South Dakota; Baptism with sister Bodil Lette. Lars Chris Larsen witnessed the baptism of Bertha R. Larsen on 22 October 1899 at First Lutheran Church, Lake Andes, South Dakota; Baptism with brother William Bryan. Lars Chris Larsen witnessed the baptism of Raymond B. Larsen on 3 November 1907 at First Lutheran church, Lake Andes, South Dakota. Lars Chris Larsen died in 1941 at from bowel obstruction. 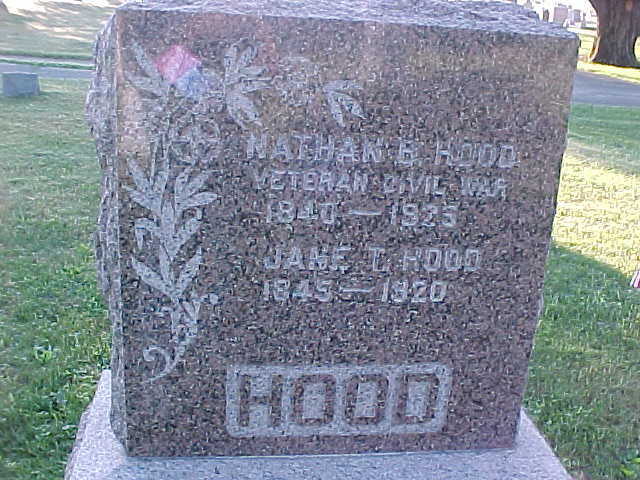 He was buried in 1941 at Harrison Cemetery, Harrison, Sioux, Nebraska. 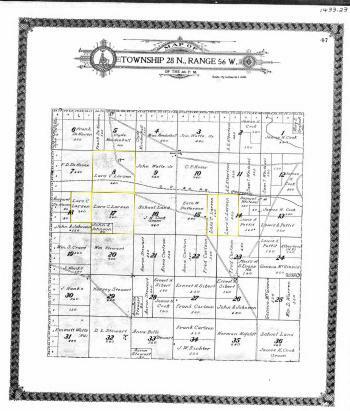 In 1916 at Land Ownership Map, Township 28N Range 56W, Sioux, Nebraska, includes 5 sections owned by Lars C. Larsen. According to Tim Abrahamson, Lars sent each of his 4 boys to homestead to meet the requirements to acquire the land. The boys were as young as 8 or 9 years old. 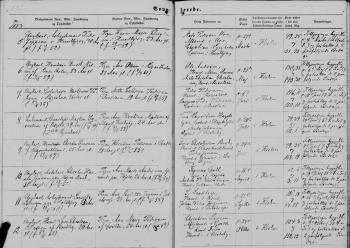 [S384] The Danish National Archives; Census Records, 1890 Denmark Census - Viborg, Lysgaard, Karup, Wallerbæk, Karup Sogn - Lars Christian Larsen comments. [S383] The Danish National Archives; Church Records, Lars Christian Larsen birth record 24 Nov 1862, Page 57 Image 62, Ringkøbing Amt, Ikast Sogn, Kontraministerialbog (1816 - 2002) Denmark. [S383] The Danish National Archives; Church Records, Lars Christian Larsen - Ane Marie Pedersen marriage record 23 Oct 1883, Image 134, Ringkøbing Amt, Ikast Sogn, Kontraministerialbog (1816 - 2002) Denmark. 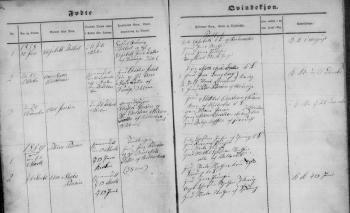 [S384] The Danish National Archives; Census Records, 1870 Denmark Census - Ringkøbing, Hammerum, Ikast, Grøde - Christian Larsen. 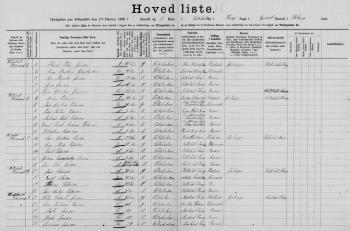 [S384] The Danish National Archives; Census Records, 1880 Denmark Census - Ringkøbing, Hammerum, Ikast, Grødde, Grødde Bye - Christen Larssen (Christian Larsen). 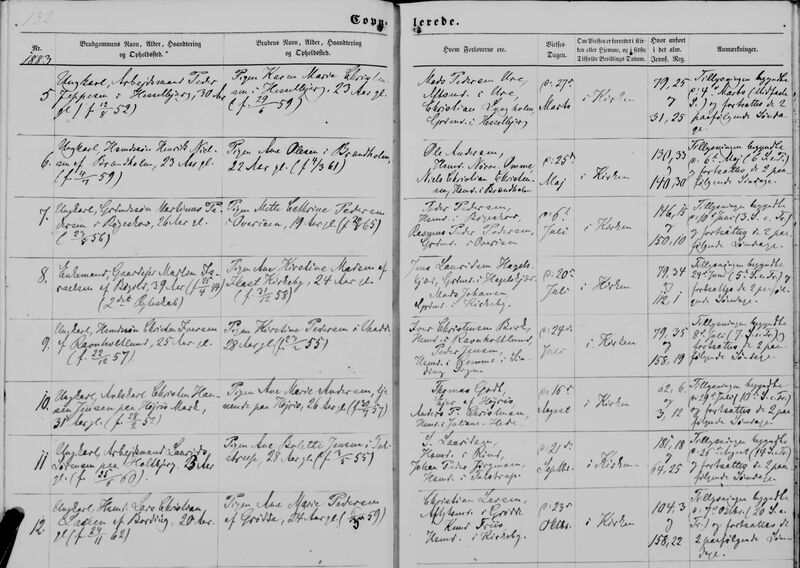 [S384] The Danish National Archives; Census Records, 1890 Denmark Census - Viborg, Lysgaard, Karup, Wallerbæk, Karup Sogn - Lars Christian Larsen. [S243] U.S. Federal Census 1920 U.S. Federal Census, by Ancestry.com, ED247. Dwelling 42. [S250] U.S. Federal Census 1930 U.S. Federal Census, by Ancestry.com, ED83-3. Dwelling 88. [S373] U.S. Federal Census 1940 U.S. Federal Census, by Ancestry.com, Year: 1940; Census Place: Harrison, Sioux, Nebraska; Roll: T627_2266; Page: 5B; Enumeration District: 83-3. [S240] SD Charles Mix Co. Atlas, by South Dakota. Name Variation Ane Maria Pedersen was also known as Ane Maria Jensen. Name Variation Ane Maria Pedersen was also known as Anna Marie. Name Variation Ane Maria Pedersen was also known as Marie. Name Variation Ane Maria Pedersen was also known as Ane Marie. Name Variation Ane Maria Pedersen was also known as Peterson. 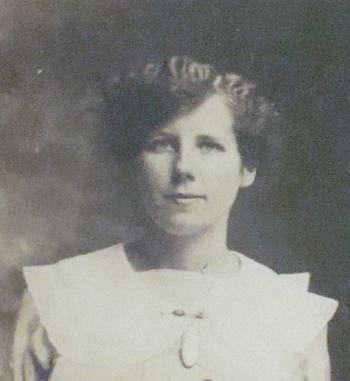 Name Variation Ane Maria Pedersen was also known as Mary Marie. Married Name 23 October 1883 As of 23 October 1883,her married name was Larson. Married Name 23 October 1883 As of 23 October 1883,her married name was Larsen. 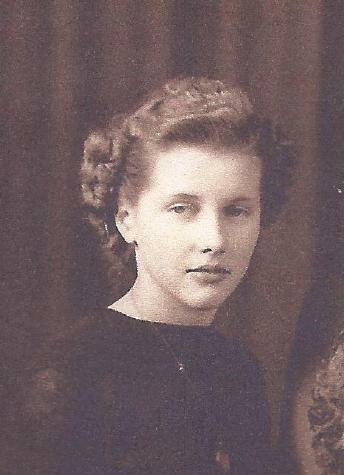 She was the daughter of Jens Peder Pedersen and Bodil Nielsdatter. Ane Maria Pedersen witnessed the baptism of Hannah Larsen on 16 June 1892 at St Paul Lutheran Church, Orum, Nebraska. Ane Maria Pedersen witnessed the baptism of Chris Larson on 2 September 1894 at St Paul Lutheran Church, Orum, Nebraska. Ane Maria Pedersen witnessed the baptism of Bryan William Larsen on 22 October 1899 at First Lutheran Church, Lake Andes, South Dakota; Baptism with sister Bodil Lette. 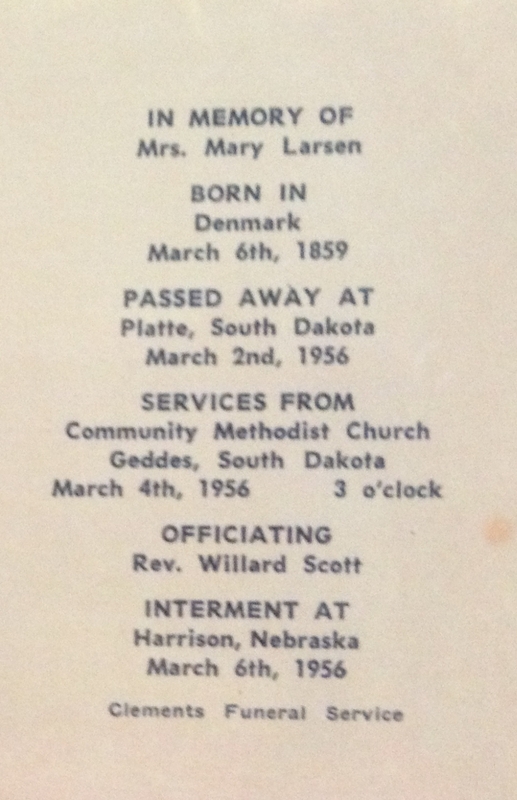 Ane Maria Pedersen witnessed the baptism of Bertha R. Larsen on 22 October 1899 at First Lutheran Church, Lake Andes, South Dakota; Baptism with brother William Bryan. Ane Maria Pedersen witnessed the baptism of Raymond B. Larsen on 3 November 1907 at First Lutheran church, Lake Andes, South Dakota. Ane Maria Pedersen died on 2 March 1956 at from pneumonia, Platte, South Dakota, at age 96. 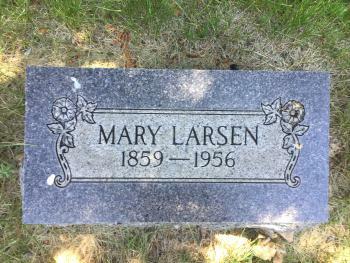 She was buried on 4 March 1956 at Harrison Cemetery, Harrison, Sioux, Nebraska, listed as Mary Larsen. Translation: Twin. Born March 6, baptized at home on March 13, 1859. Daughter of bolsmand Jens Pedersen and his wife Bodil Nielsdatter in Vallerbæk. Ane Maria Pedersen immigrated in 1890 Lars came to America alone in 1890 (also reported as 1888) and one (or three) years later his wife and three sons came to America to join him at Blair, Nebraska. She migrated in 1897 at Charles Mix, South Dakota. She had 7 with 6 living in 1900 children. She migrated circa 1908 at Harrison, Sioux, Nebraska. She had 8 with 6 living in 1910 children. 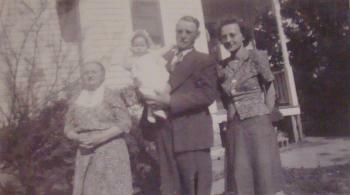 Circa 1948 Great-Grandma Mary Larsen, baby girl Mollet, Grandpa Chris Larson and Gladys Mollet. 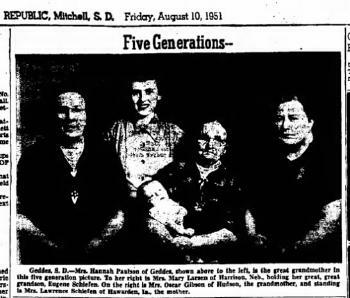 On 10 August 1951 at 5 Generation photo 5 Generations - Mrs. Hannah Paulson, Mrs. Mary Larsen, Eugene Schiefen, Mrs. Oscar Gibson, Mrs. Lawrence Schiefen. - The Daily Republic (Mitchell, SD). On 6 March 1955 Mary Pederson Celebrates 96th Birthday. 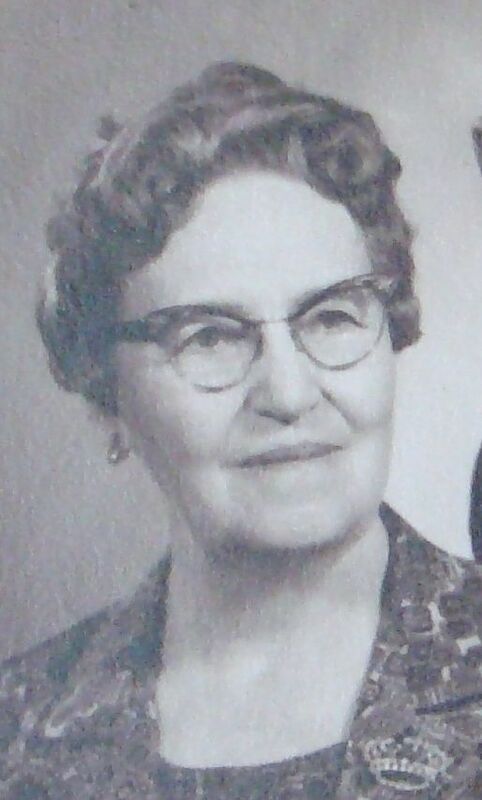 Sunday, March 6, 1955, was the 96th birthday anniversary of Mrs. Mary Pederson Larsen, which was observed with open house at the home of her daughter, Mrs. Hannah Paulson in Geddes, South Dakota. Relatives were entertained Saturday March 5, to accommodate the many well wishers. Miss Margaret Ostberg baked and decorated the beautiful birthday cake. Mary Pedersen was born in Knupstrup, Kaarup Sogn, Denmark, March 6, 1859. 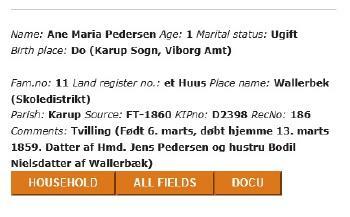 Her parents, Mr. and Mrs. Jens Peder Pedersen lived to be 93 and 96, respectively. Her twin sister and three brothers also lived to see their nineties. 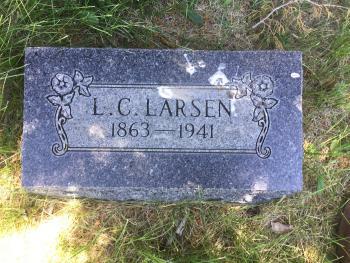 She married Lars C. Larsen, October 22, 1883 in the Lutheran church of Kaarup Denmark. 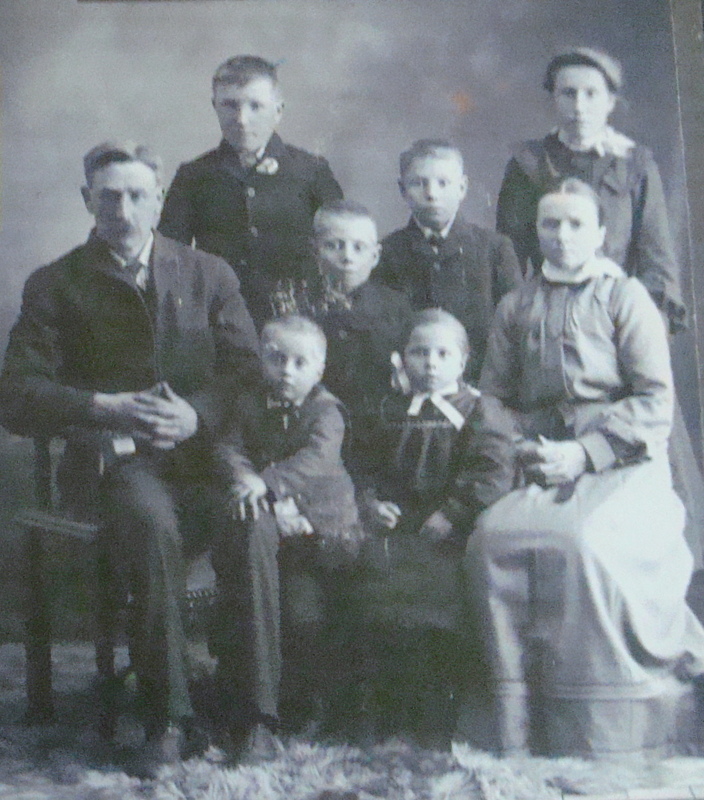 Eight children were born to this union, Mrs. Hannah Paulson of Geddes, South Dakota; Mrs. Lee Orr of Fresno, California; and four sons, Chris Larsen of Alcester, South Dakota; Bryan and Raymond Larsen of Harrison, Nebraska; and Carl Larsen of Colville, Washington; Two sons Jens and John, died some years ago. 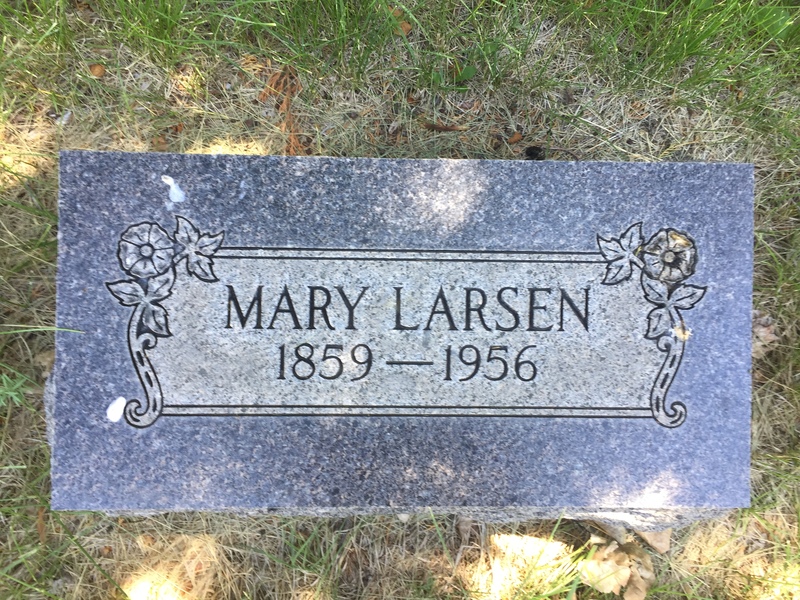 Besides her six children, Mrs. Larsen has eleven grand children; twenty-four great grandchildren; and three great-great-grandchildren. 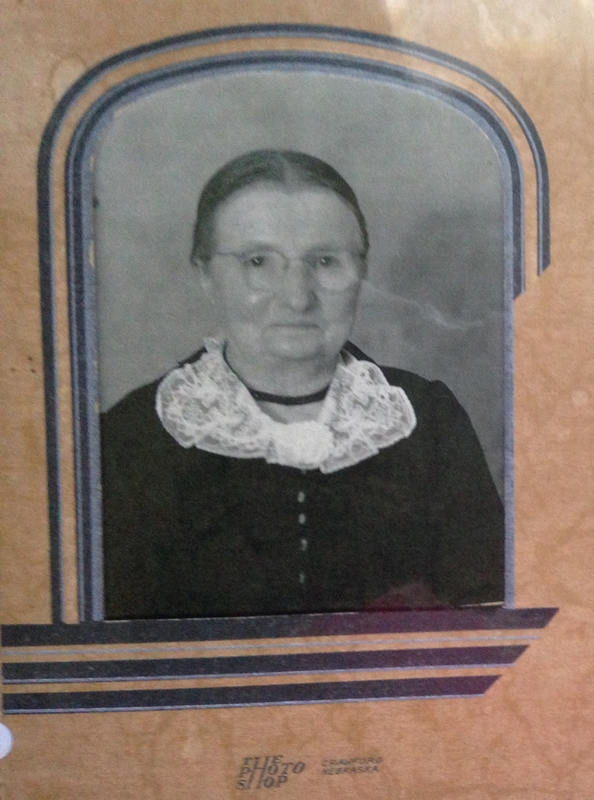 In 1890, her husband immigrated to Blair, Nebraska, and a year later Mrs. Larsen and their three small sons followed. They sailed on a German ship and were at sea three weeks. In 1900 they homesteaded in Douglas county, near Armour, South Dakota and later moved to a ranch forty miles south of Harrison, Nebraska. Her husband died in the fall of 1941 and Mrs. Larsen moved to Harrison, Nebraska to make her home. In the fall of 1954 she came to Geddes to make her home with her daughter. Mrs. Larsen is alert, has a good sense of humor, and is in good health. When asked to what she accredited her long life, she replied, "I have always had good health, for which I am thankful to God. I have worked hard, but that has not hurt me." 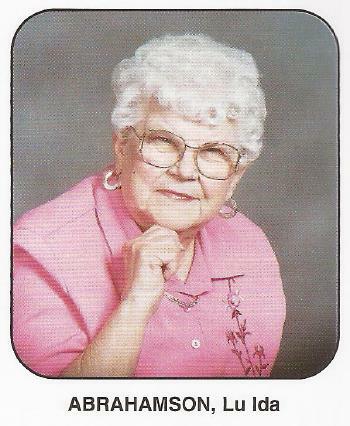 Inquiring about how many grand children she has, she wittingly replied, "I don't know, everybody calls me Grandma Larsen." She has knitted twenty-five pairs of mittens during the winter and crocheted thirty-one rugs and many fancy work items. She gave six pairs of mittens to a needy family. She says she can easily knit a pair a day. 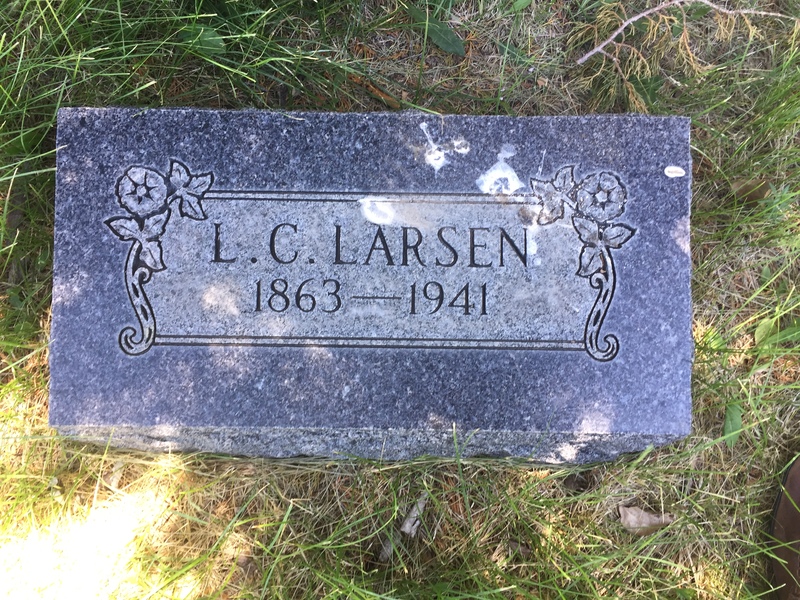 In reminiscing, Mrs. Larsen said, "I did house work for a family with three small children in Denmark, and helped milk ten cows three times a day, for which I was paid two and one-half crowns a week or fifteen cents a day we worked from sun rise until sun set." On 10 April 1955 Mrs. Mary Pedersen Larsen, who celebrated her 96th birthday last Sunday at her home in Geddes, S.D., holds the fifth generation member of her family while representatives of the other three generations gather 'round. 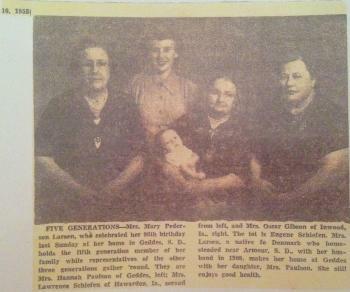 They are Mrs. Hannah Paulson of Geddes, left; Mrs. Lawrence Schiefen of Hawarden, Ia., second from left, and Mrs. Oscar Gibson of Inwood, Ia., right. The tot is Eugene Schiefen. Mrs. Larsen, a native of Denmark who homesteaded near Armour, S. D., with her husband in 1900, makes her home at Geddes with her daughter, Mrs. Paulson. She still enjoys good health. [S383] The Danish National Archives; Church Records, Image 28 Karup sogn (Viborg amt) Kontraministerialbog (1814 - 2002). [S384] The Danish National Archives; Census Records, 1860 Denmark Census - Viborg, Lysgaard, Karup, Wallerbek (Skoledistrikt) - Jens Pedersen. 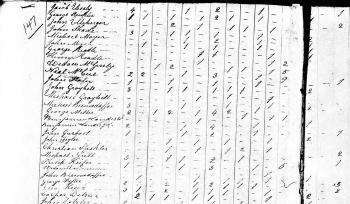 [S384] The Danish National Archives; Census Records, 1870 Denmark Census - Viborg, Lysgaard, Karup, Vallerbæk, Boelssted - Jens Pedersen. [S384] The Danish National Archives; Census Records, 1860 Denmark Census - Viborg, Lysgaard, Karup, Wallerbek (Skoledistrikt) - Ane Maria Pedersen comments. 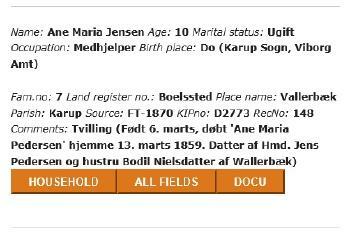 [S384] The Danish National Archives; Census Records, 1870 Denmark Census - Viborg, Lysgaard, Karup, Vallerbæk, Boelssted - Ane Maria Jensen comments. 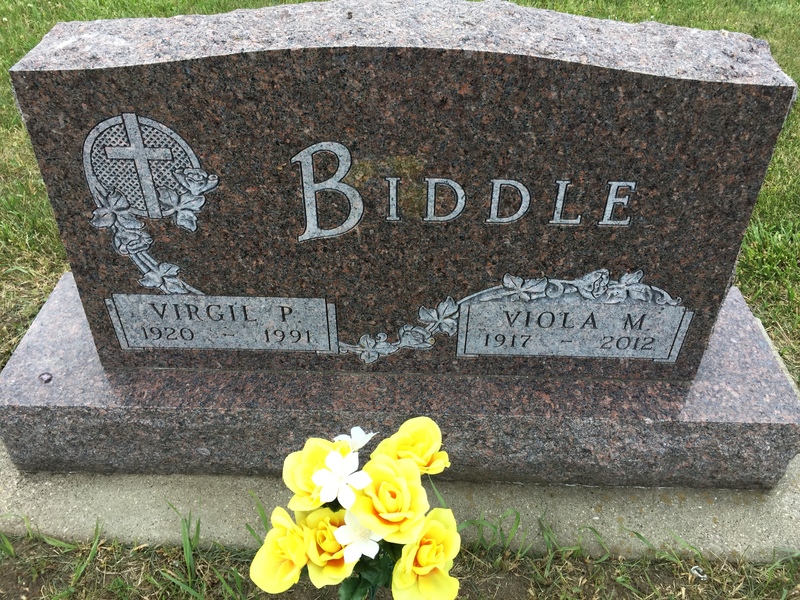 Virgil P. Biddle was born on 5 July 1920 at South Dakota. 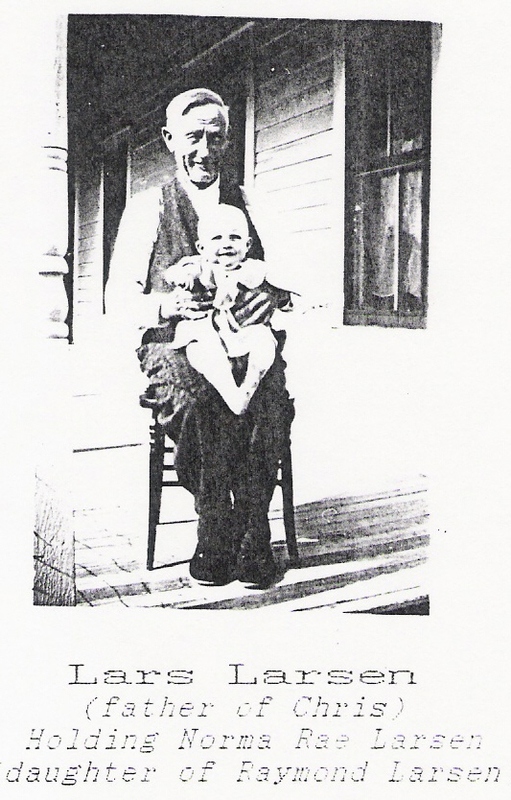 He was the son of Orville George Biddle and Gertrude Marie Miller. 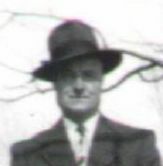 Virgil P. Biddle married Viola Marie Larson, daughter of Chris Larson and Louise Christine Frohreich, on 20 September 1941. He was buried after 19 December 1991 at Alcester Cemetery (Pleasant Hill Cemetery), Alcester, Union, South Dakota. Virgil P. Biddle obtained US Social Security Card at South Dakota; last residence not specified. On 10 April 1947 at spent Easter Sunday at the home of Mr and Mrs. Chris Larson. 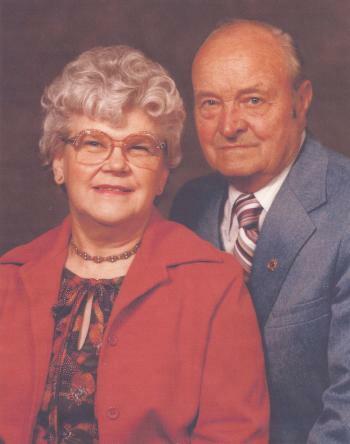 On 18 February 1968 at Hawarden, Iowa, Mr. and Mrs. Oscar Gibson of Canton were honored on their 40th wedding anniversary Sunday, February 18, at the home of their daughter, Mrs. J. Lawrence Schiefen of rural Hawarden. Dinner guests included Mr. and Mrs. Clifford Faughender and Gaylen and Mrs. Hannah Paulson, all of Geddes, South Dakota, and Mrs. Dorothy Schiefen of Hawarden. 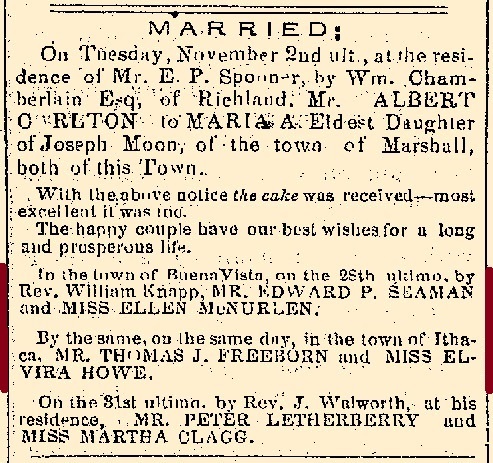 Friends and relatives who came in the afternoon to surprise the honored couple were Mr. and Mrs. Ernest Gibson of Tyndall, South Dakota; Mr. and Mrs. Norman Gibson, Mrs. Herb Olson and Mrs. Glen Jerke of Avon, South Dakota; Mr. and Mrs. Fred Strehlow and Vicky and Mr. and Mrs. Chester Vipond of Hudson; Mr. and Mrs. Verne Mollet and Mrs. Martha Smearman of Alcester; Mr. and Mrs. Virgil Biddle, Verla and Glenda of Garretson, South Dakota, and Mr. and Mrs. Rudolph Twedt of Canton. At the close of the social afternoon lunch was served by the hostess. [S250] U.S. Federal Census 1930 U.S. Federal Census, by Ancestry.com, ED12-13. Dwelling 9. 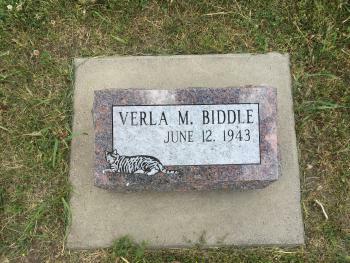 Verla Marie Biddle was born on 12 June 1943 at Akron, Iowa. 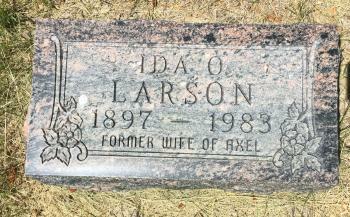 She was the daughter of Virgil P. Biddle and Viola Marie Larson. Verla Marie Biddle died on 11 August 2018 at Hutchinson, McLeod, Minnesota, at age 75 Verla Biddle, 75, of Hutchinson, Minnesota, died Saturday, August 11, 2018, at Harmony River Living Center in Hutchinson. Funeral services will be 10:30 a.m., Friday, August 17, 2018, at George Boom Funeral Home & Crematory, Sioux Falls. Visitation with family present to greet friends will be from 5:00 p.m. until 7:00 p.m., Thursday, August 16, 2018, also at George Boom Funeral Home & Crematory. Visitation will also begin at 9:30 a.m., until the time of service on Friday at the funeral home. 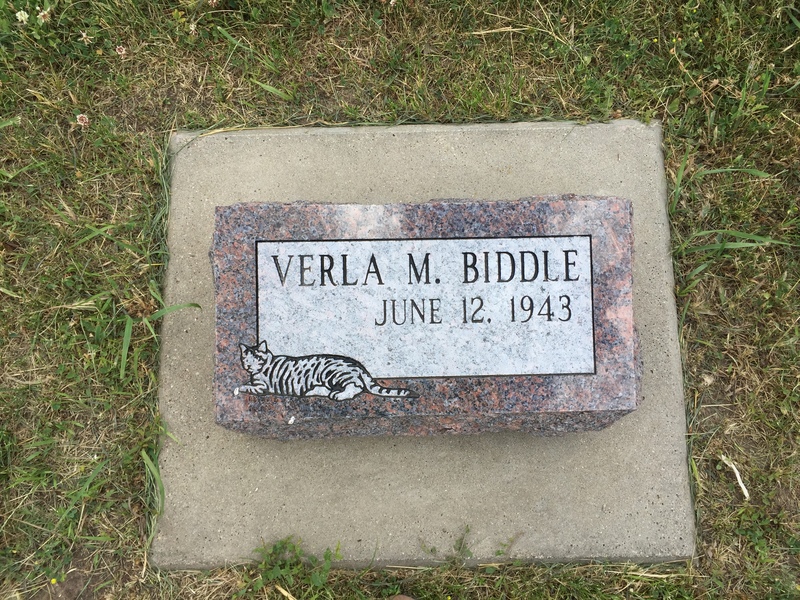 Verla Biddle, daughter of Virgil and Viola (Larson) Biddle was born June 12, 1943, at Akron, Iowa. 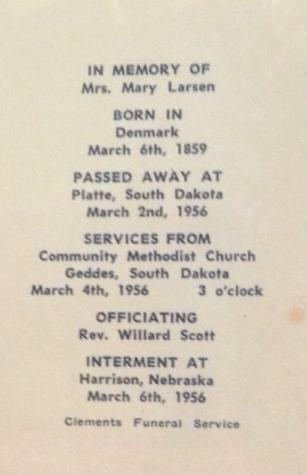 She was baptized on August 15, 1943, at Peace Lutheran Church, Alcester, SD. 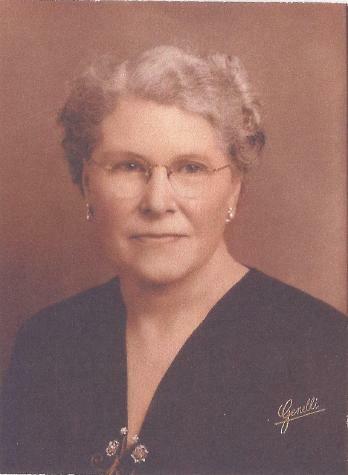 Verla attended rural schools in Alcester, Geddes and Garretson, South Dakota communities, where her parents were engaged in farming. Verla was confirmed in her faith at Zion Lutheran Church in Garretson. She enjoyed many years of involvement in the Yohoma 4-H Club. 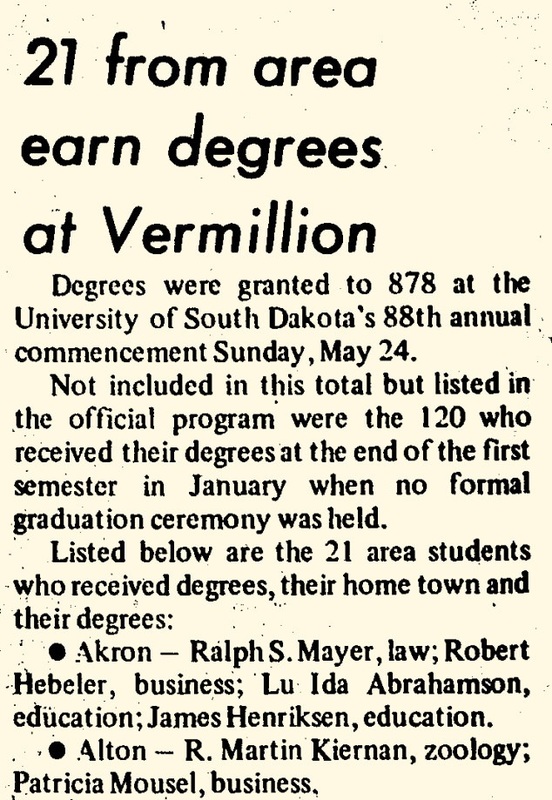 Verla graduated from Garretson High School with the class of 1964. During her working years she was employed many years in housekeeping at hotels in Sioux Falls. 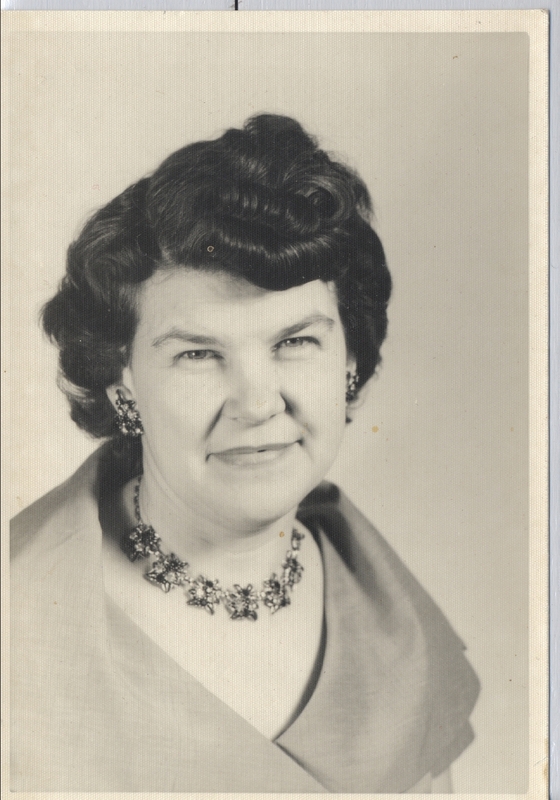 She also was dedicated kitchen help for the Sioux Falls Joe Foss Airport restaurant and the Crack’d Pot restaurant. 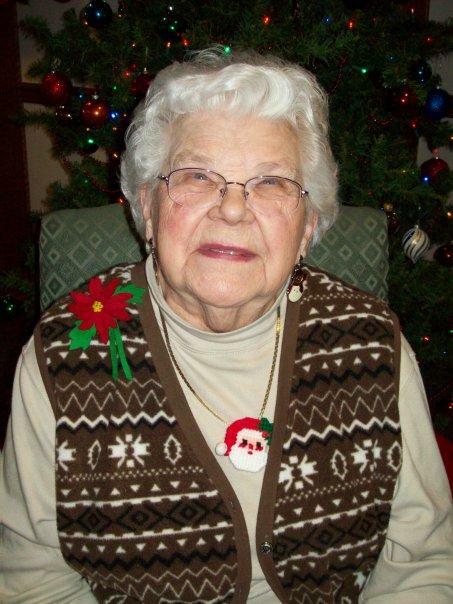 Over the years, Verla lived in various areas in Sioux Falls and was sure to get involved with a church in her neighborhood. She was a past member of Grace Lutheran Church in Sioux Falls where she enjoyed singing in the choir and attending Bible study classes. 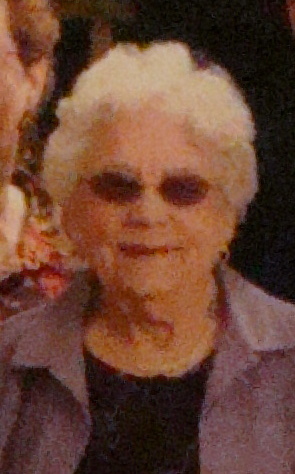 In the spring of 2014 Verla moved to Hutchinson, MN, where she was a faithful member of Faith Lutheran Church. Verla’s church involvement was very important to her and she was always sure to be lending a helping hand wherever needed. Her favorite church activities were attending Bible study and “Digging Deeper” classes. While living in Sioux Falls, Verla’s caring heart led her to volunteer at both Avera McKennan and Sanford hospitals for many years. Verla relished her volunteer work, even as she walked to the bus stop in the winter when it was still dark. She earned the volunteer of the month award from Sanford on one occasion. In her free time she loved to bake and enjoyed “spoiling” her friends and family with her sweets. She was known for her banana bread, which she always proudly explained was her niece Jessica’s recipe. Verla always looked forward to playing cards with her friends. Verla also did embroidery work, often while having coffee with friends. She even became a whiz at 1000 piece jigsaw puzzles. 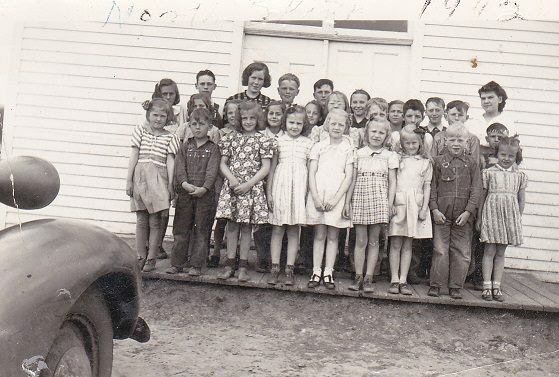 Verla was always game to go to church dinners and ice cream socials. She loved her beautiful cat Boots and later adopted her mother’s cat, Tiger, when Verla’s mother became too ill to care for him. Verla will be missed by many. 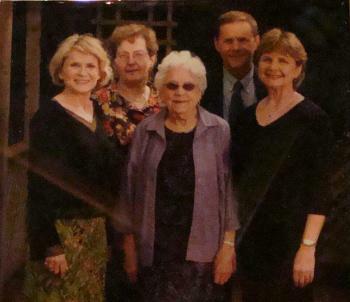 Left to cherish her memory are her sister, Glenda (Arnie) Jonson of Hutchinson, MN; brother, Gary (Hannele) Biddle of Lenoir, NC; nieces, Lisa (Kevin) Langton of Mankato, MN, Jessica Biddle of Fort Mill, SC, and Karen (Henry) Rosario of Charlotte, NC; and nephew, Eric (Kelly) Bunde of Mankato, MN; great-nieces, Miranda Bunde and Layla Rosario; great-nephews, Jacob Langton, Justin Biddle Rayak, Luc Biddle, and Evan Bunde; two aunts, Gladys Mollet of Alcester, SD, and Pat Biddle of Geddes, SD; eleven cousins and their families; and many other relatives and friends. 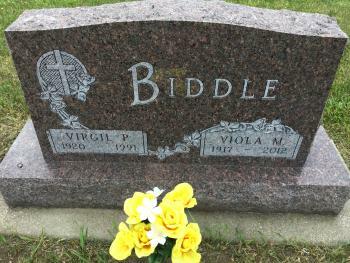 She was preceded in death by her parents Virgil and Viola Biddle; and sister Virginia (Ginny) Biddle. 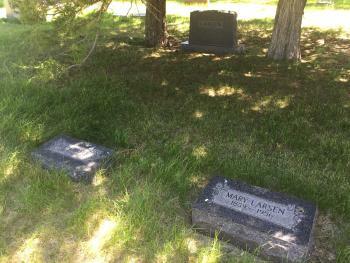 She was buried after 11 August 2018 at Alcester Cemetery (Pleasant Hill Cemetery), Alcester, Union, South Dakota. 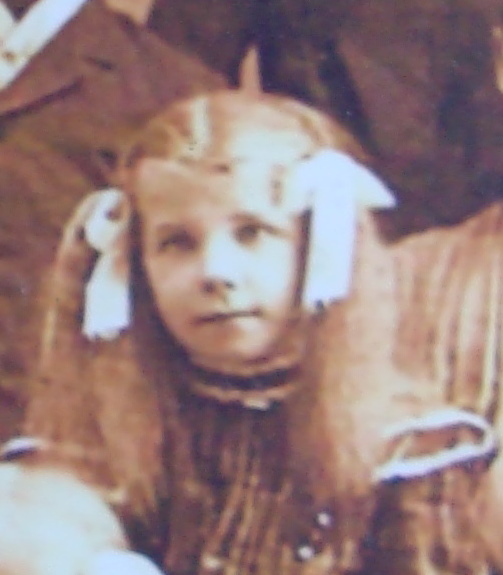 Nickname Virginia Biddle also went by the name of Ginny. Married Name August 1969 As of August 1969,her married name was Tiderman. 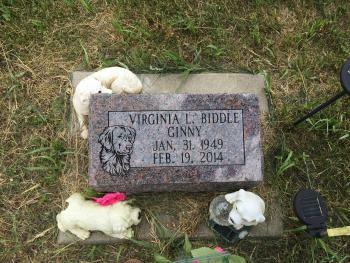 Virginia Biddle was buried at Alcester Cemetery (Pleasant Hill Cemetery), Alcester, Union, South Dakota. She was born on 31 January 1949. Virginia Biddle died on 19 February 2014 at age 65 Virginia "Ginny" Biddle, 65, died at her home in Minnetonka, Minnesota. Funeral services will begin at 1:00 PM Tuesday, February 25, 2014, at the Zion Lutheran Church in Garretson, with visitation beginning one hour prior at the church. 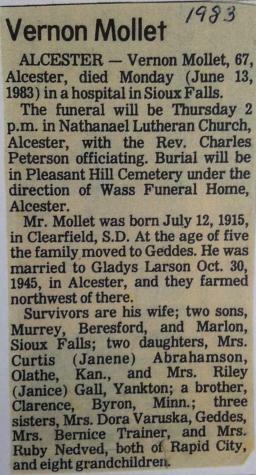 Burial will be at the Pleasant Hill Cemetery, Alcester, South Dakota. 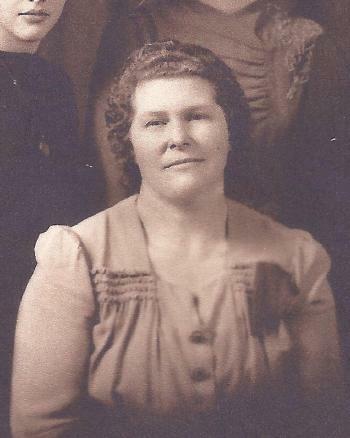 Survivors include her siblings: Verla Biddle, Sioux Falls, Glenda (Arnie) Jonson, Hutchinson, MN, Gary (Hannele) Biddle, Charlotte, NC; three nieces; one nephew; and six great nieces and nephews. 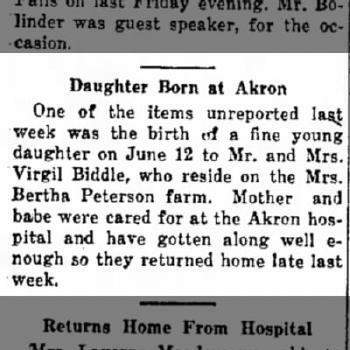 She was preceded in death by her parents, Virgil and Viola Biddle. 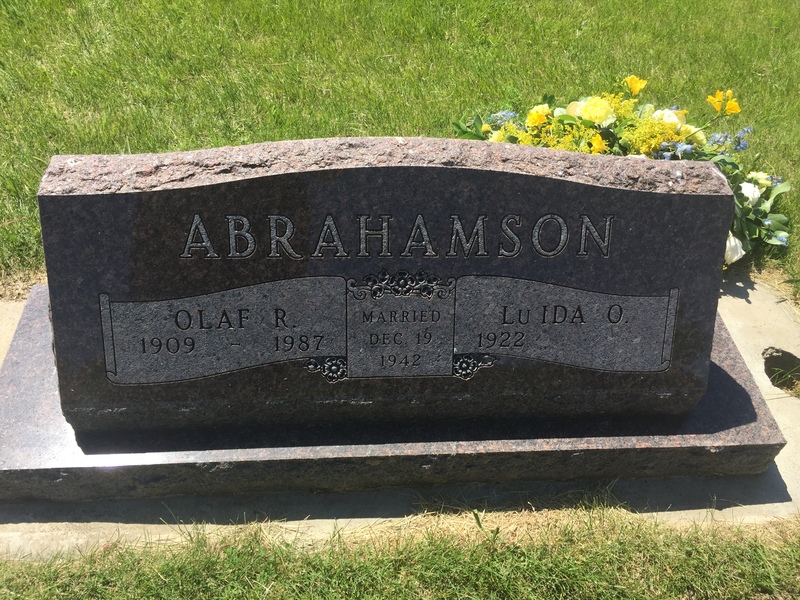 Name Variation Olaf Robert Abrahamson was also known as Oluf Abraham as written in his book, The Lutheran Hymnary "Oluf Abraham 14 October 1923." 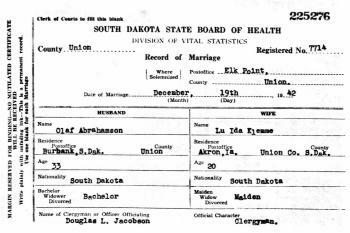 Olaf Robert Abrahamson was born on 16 January 1909 at Union, South Dakota. He was the son of Ole Andreas Abrahamson and Anna Mathiasdatter Eide. 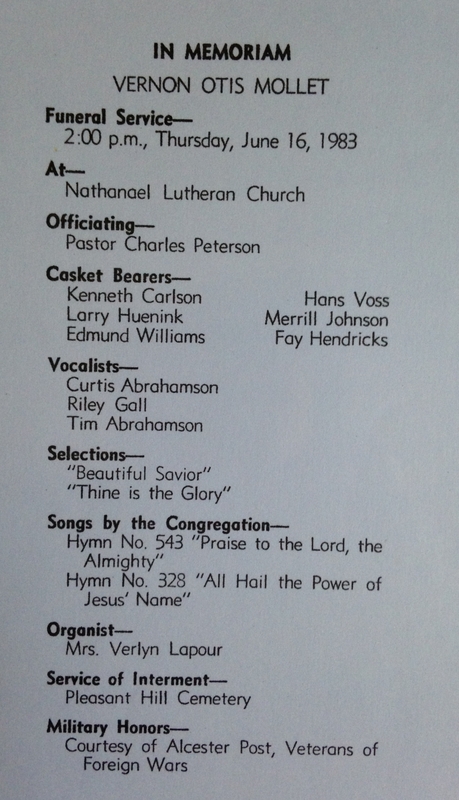 Olaf Robert Abrahamson was baptized on 28 March 1909 at Brule Creek Lutheran Church, Union, South Dakota. He was buried on 3 February 1987 at Brule Creek Cemetery, Union, South Dakota. 1935 South Dakota State Census, Spink, Union, South Dakota Olaf Robert Abrahamson appeared on the census of 1935 in the household of Ole Andreas Abrahamson at South Dakota State Census, Spink, Union, South Dakota. 1945 South Dakota State Census, Spink, Union, South Dakota Olaf Robert Abrahamson appeared on the census of 1945 at South Dakota State Census, Spink, Union, South Dakota. 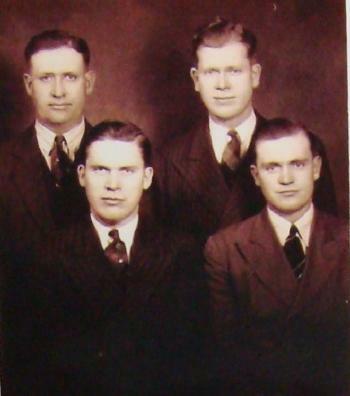 Olaf Robert Abrahamson and Lu Ida Olive Klemme were Family Photo of Olaf & LuIda Abrahamson with their three sons Larry, James, and Curtis. 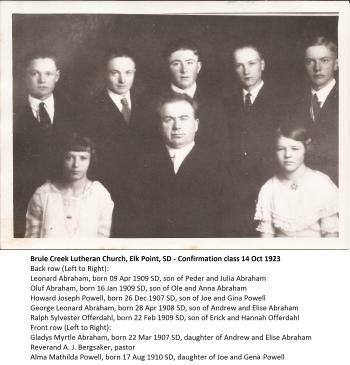 Olaf Robert Abrahamson and Leonard Abrahamson were confirmed on 14 October 1923 at Brule Creek Lutheran Church, Elk Point, South Dakota. In July 1949 at LeMars, Plymouth, Iowa, attended the Klemme family picnic. Olaf Robert Abrahamson attended the 13th annual Lykken family reunion Emil Fred Klemme and Anna Marie Lykken were The 13th annual Lykken reunion was held Sunday, August 17, at the home of Mr. And Mrs. Emil Klemme at Akron. Following the business meeting games were played and a social time was enjoyed. 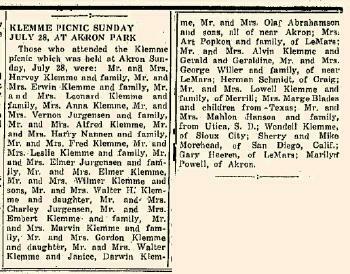 Those attending from this vicinity included: Mr. And Mrs. Olof Abrahamson and sons and Mr. And Mrs. August Anderson of Akron; Mr and Mrs. Leonard Wevik and Gloria of Remsen. Mr. And Mrs. Emil Engelbrecht, Mr and Mrs. John Engelbrecht and Mr. And Mrs. Ernest Charlson and children of Le Mars. on 17 August 1952 at Lykken reunion, Akron, Plymouth, Iowa.8 Olaf Robert Abrahamson obtained US Social Security Card at Iowa; Last residence Akron, Plymouth, Iowa. 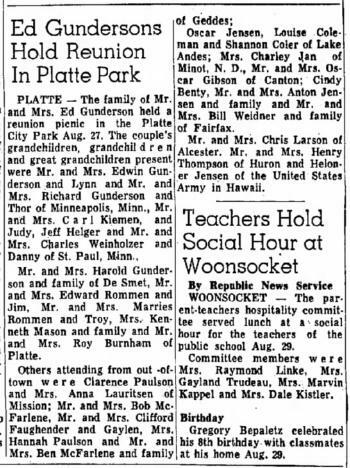 On 28 July 1957 at Akron, Plymouth, Iowa, attended Klemme Picnic family reunion. On 8 July 1962 at Akron, Iowa, Klemme Reunion 08 July 1962. 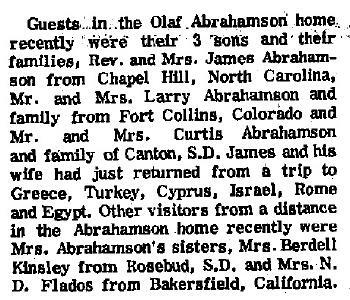 In June 1973 at Akron, Iowa, Family guests to Olaf Abrahamson home. 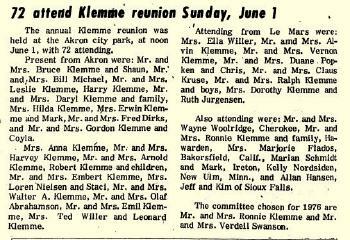 On 30 June 1974 at Akron, Plymouth, Iowa, 90 family members attended the annual Klemme Reunion. On 1 June 1975 at Akron, Plymouth, Iowa, attended Klemme family reunion. In November 1975 at at the Olaf Abrahamson home, Akron, Iowa, Emil Klemme 80th birthday dinner. 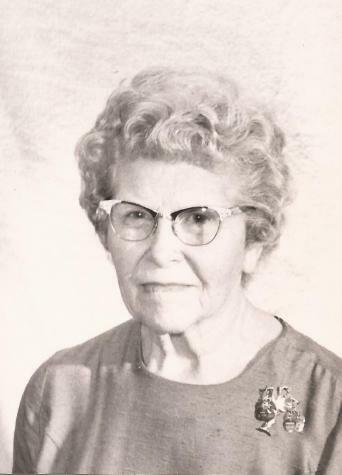 On 10 March 1977 at Sioux City, Iowa, Marie Olson celebrated her 104th birthday anniversary with family. He was a Retired farmer and musician. in 1983. As of 1983, Olaf Robert Abrahamson's address was 620 8th St, Akron, Iowa. [S7] "Anna Klemme Journal Sequel,", pg 53. [S184] Beresford Republic Newspaper, Vol. 94, 1987, Feb 5. [S244] U.S. Federal Census 1910 U.S. Federal Census, by Ancestry.com, Pg 3B. ED #430. #50, 55. [S243] U.S. Federal Census 1920 U.S. Federal Census, by Ancestry.com, Page 5B ED #252. [S250] U.S. Federal Census 1930 U.S. Federal Census, by Ancestry.com, ED64-15. Dwelling 53. [S373] U.S. Federal Census 1940 U.S. Federal Census, by Ancestry.com, Dwelling 17. ED64-16. Sheet 6b. 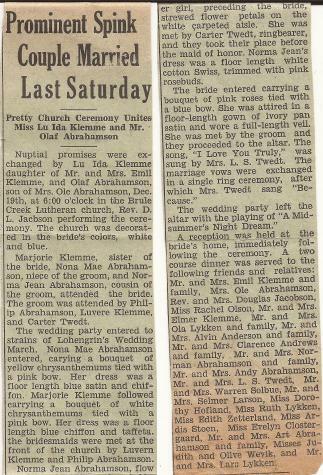 [S289] Iowa, Lemars Semi Weekly Sentinel (Le Mars, Iowa), 1952 August 29 - Lykken + Klemme - reunion. Name Variation Lu Ida Olive Klemme was also known as LuIda. 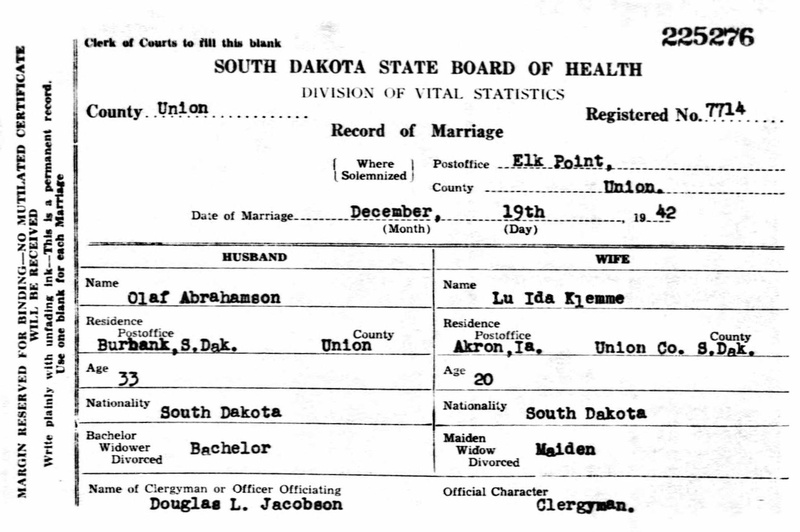 Married Name 19 December 1942 As of 19 December 1942,her married name was Abrahamson. Lu Ida Olive Klemme was born on 25 May 1922 at Union, South Dakota. 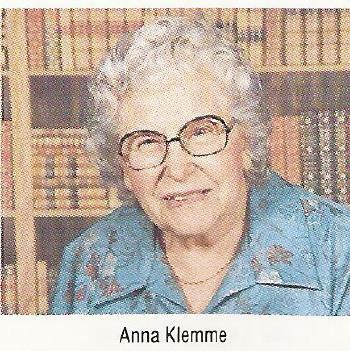 She was the daughter of Emil Fred Klemme and Anna Marie Lykken. 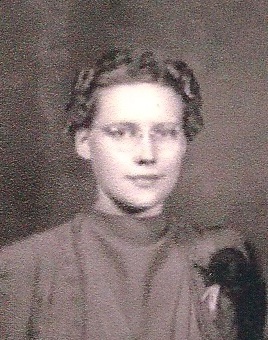 Lu Ida Olive Klemme was baptized on 2 July 1922. Lu Ida Olive Klemme died on 21 May 2017 at Colorado at age 94 LuIda Abrahamson, age 94, of Fort Collins, Colorado, formerly of Union County South Dakota and Akron, Iowa, passed away Sunday, May 21, 2017 at Brookdale Assisted Living Center in Fort Collins, after a brief illness. Funeral services will be 1:00 p.m. Wednesday, May 31, 2017 at Brule Creek Lutheran Church, rural Elk Point, South Dakota. Reverend Steve Martens will officiate. Burial will follow in Brule Creek Lutheran Cemetery. Visitation with the family present will be from 12:00 p.m. until service time on Wednesday at he church. Arrangements are with the Rexwinkel-Schroeder Funeral Home in Akron. Expressions of sympathy can be extended to the family through www.rexwinkelfh.com. 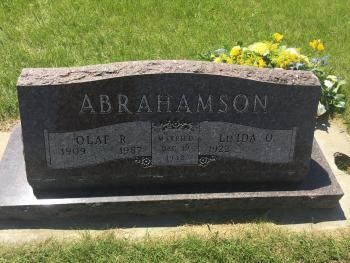 LuIda Olive Abrahamson was born May 25, 1922 near Nora, South Dakota to Emil and Anna Klemme. She was baptized July 2, 1922 at Peace Lutheran Church in Alcester, South Dakota and confirmed in 1936 in Brule Creek Lutheran Church by Rev. W.I. Aamoth. LuIda lived her early years on a farm near Spink, South Dakota. 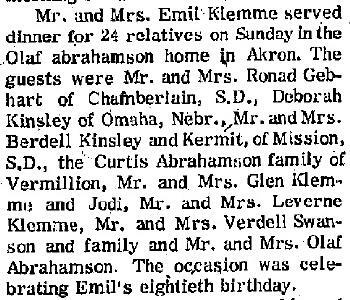 She married Olaf Abrahamson January 19, 1942, and they resided on the family farmstead until 1971, when they moved to Akron, Iowa. Olaf passed away on January 30, 1987 at their home in Akron. LuIda later moved to Fort Collins in 1999. LuIda taught school for 26 years, retiring in 1984. She attended Southern State Teacher’s College, Morningside University and graduated from the University of South Dakota in 1970. 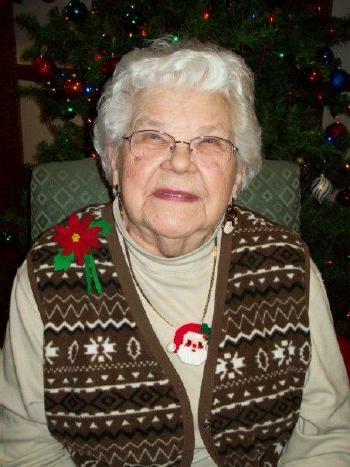 She had been a member of Brule Creek Lutheran Church since 1929. 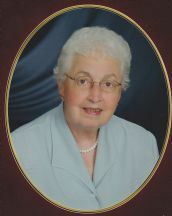 She served as Sunday School teacher and superintendent for many years and also as Ladies Aid officer. She was a past member of Union County Extension Club for several years serving as chairman for 2 years. She also was member of Women’s Federated Club, Lions, Senior Citizens Club, Golf Club and card clubs. LuIda is survived by her three sons James (Ceecy), Larry (LeAnn), and Curtis (Janene); ten grandchildren: Daniel, Deborah (Naoshi), David (Karen), Robert (Megan), Ryan (Tina), Marie, Collin (Heather), Timothy (Heather), Thomas (Adrianna), Tytus (Caroline); and 17 great-grandchildren. 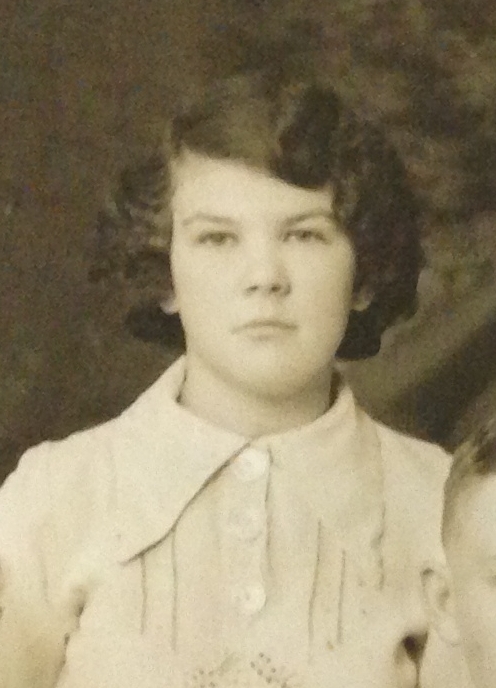 She is also survived by her sister Marge Flados of Harlingen, Texas, and several nieces and nephews. LuIda is preceded in death by her parents; husband, Olaf; her younger sister, Agnes Kinsley; brother-in-law, Berdell Kinsley; brother, Laverne Klemme; sister-in-law, LaVonne Klemme, and brother-in-law, Norman Flados. She was buried on 31 May 2017 at Brule Creek Cemetery, Spink, Union, South Dakota. 1925 South Dakota State Census, South Dakota Lu Ida Olive Klemme appeared on the census of 1925 in the household of Emil Fred Klemme at South Dakota State Census, South Dakota. 1935 South Dakota State Census, Spink, Union, South Dakota Lu Ida Olive Klemme appeared on the census of 1935 in the household of Emil Fred Klemme at South Dakota State Census, Spink, Union, South Dakota. 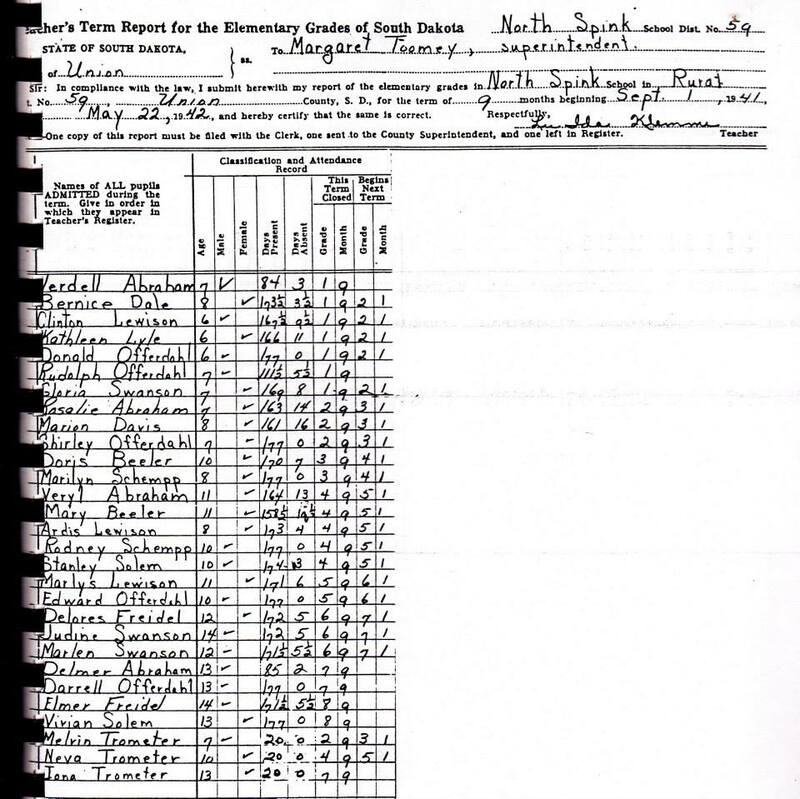 1945 South Dakota State Census, Spink, Union, South Dakota Lu Ida Olive Klemme appeared on the census of 1945 in the household of Olaf Robert Abrahamson at South Dakota State Census, Spink, Union, South Dakota. 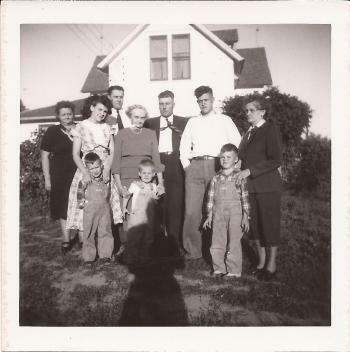 Lu Ida Olive Klemme and Olaf Robert Abrahamson were Family Photo of Olaf & LuIda Abrahamson with their three sons Larry, James, and Curtis. 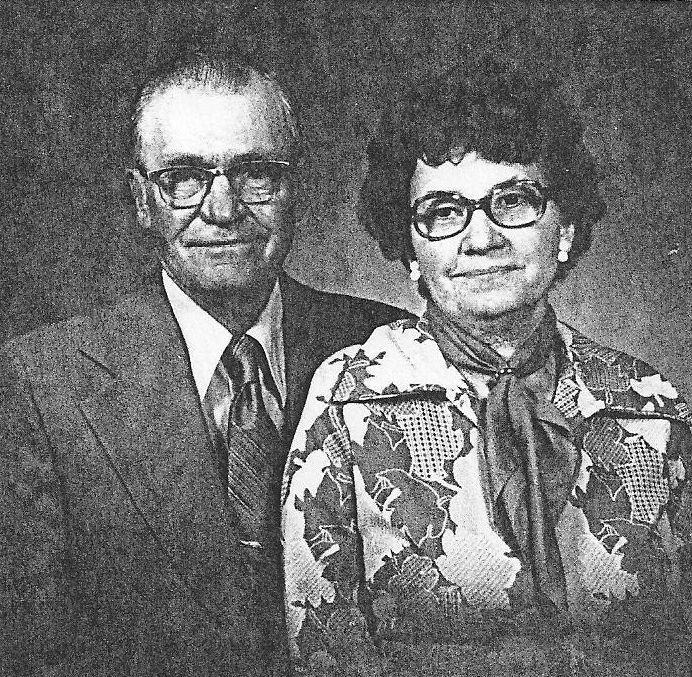 LuIda and Olaf farmed the Abrahamson family farm until Olaf retired in 1979. LuIda has taught school for 21 years, eleven of these years were in the Akron school system. Olaf and LuIda have lived in Akron since 1971. LuIda is a charming and vigorous individual. Her home displays her artful handwork. She spends her winters in Harlingen, Texas. 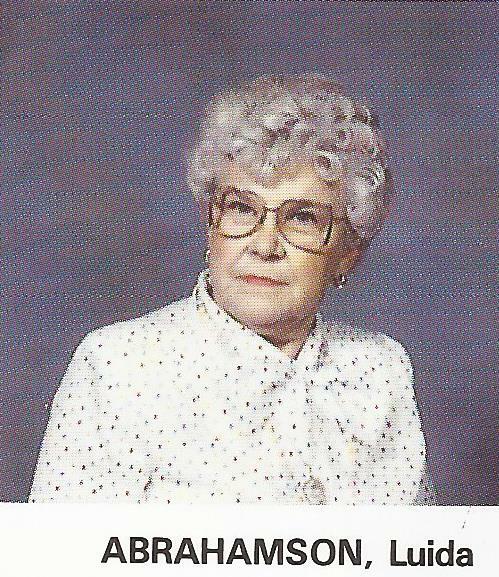 In July 1990, she graciously hostessed a picnic for the 50th Elk Point High School Class Reunion. 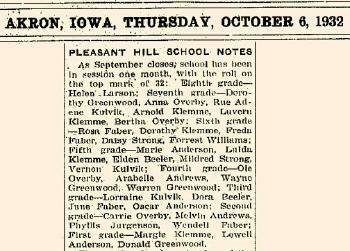 Lu Ida Olive Klemme attended school in September 1932 at Pleasant Hill School, Akron, Iowa, (listed in newspaper). 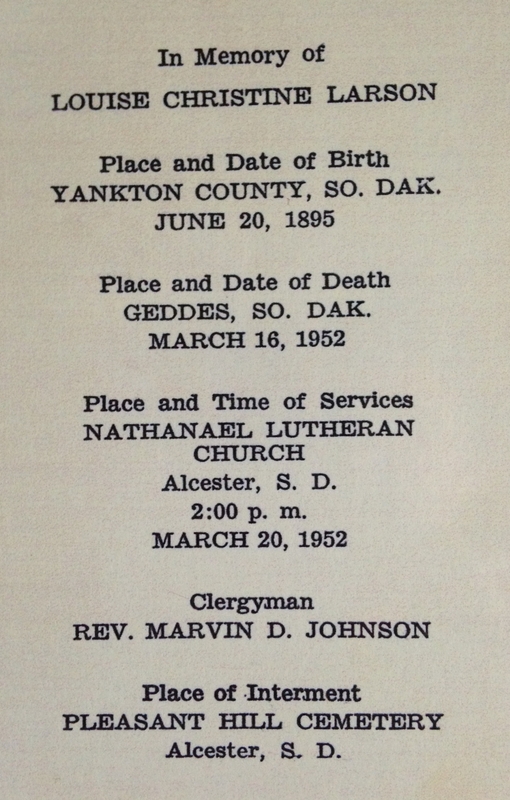 She was confirmed on 31 May 1936 at Brule Creek Lutheran Church, Elk Point, Union, South Dakota. 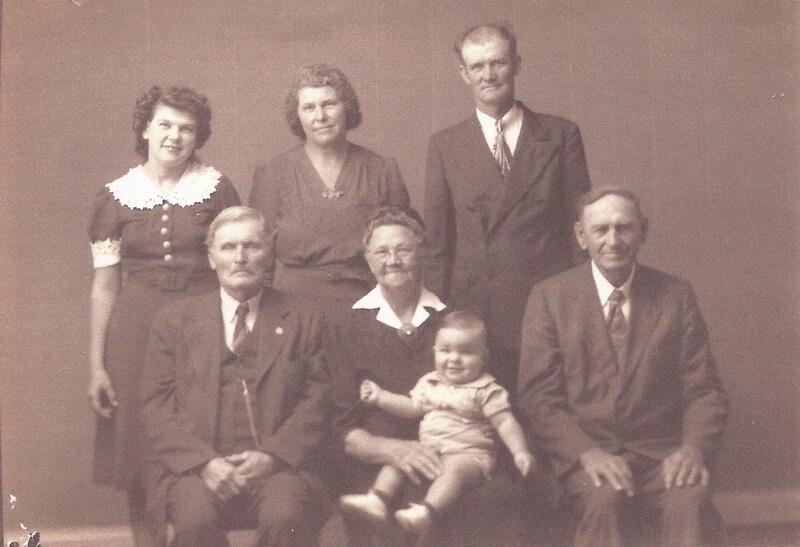 In July 1937 at LeMars, Plymouth, Iowa, attended the Klemme family reunion. She graduated in 1940 at Elk Point High, Elk Point, South Dakota. 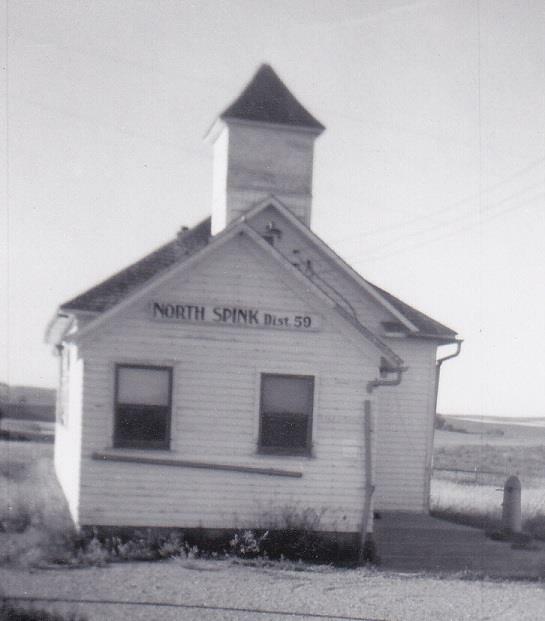 She was a North Spink School District 59 - Teacher LuIda Klemme in 1942. - Babe, Art and Martin Abraham, Jerry, Marie Olsen, LuIda, Rachel Olsen, Larry, Curt, Jim. In July 1949 at LeMars, Plymouth, Iowa, attended the Klemme family picnic. She attended the 13th annual Lykken family reunion Emil Fred Klemme and Anna Marie Lykken were The 13th annual Lykken reunion was held Sunday, August 17, at the home of Mr. And Mrs. Emil Klemme at Akron. She was a LuIda Abrahamson new teacher at Akron Community Schools in October 1970 at Akron, Plymouth, Iowa. 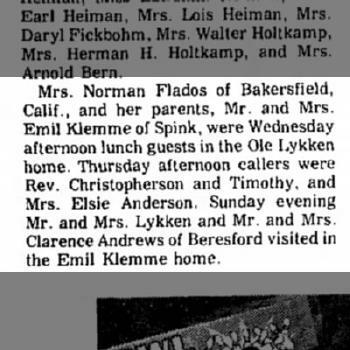 In June 1973 at Akron, Iowa, Family guests to Olaf Abrahamson home. 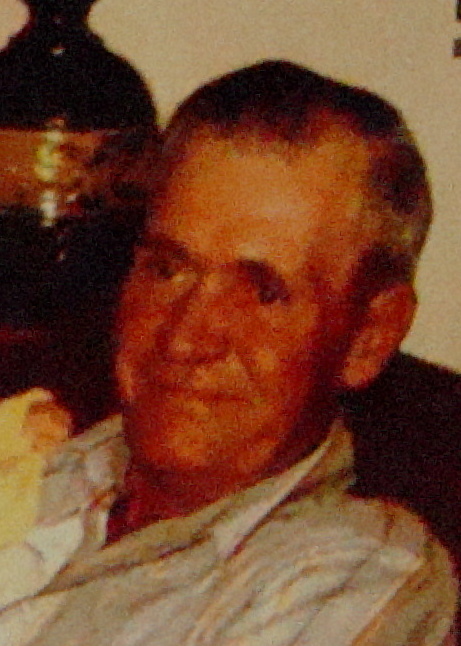 On 1 June 1975 at Akron, Plymouth, Iowa, attended Klemme family reunion. In December 1990 photo of siblings LuIda Abrahamson, Leverne Klemme, Marge Flados, Agnes Kinsley. In 2006 Cousins LuIda Abrahamson, Leverne Klemme, Elna Solbue, Gene Lykken. [S250] U.S. Federal Census 1930 U.S. Federal Census, by Ancestry.com, ED64-15. Dwelling 45. [S373] U.S. Federal Census 1940 U.S. Federal Census, by Ancestry.com, Dwelling 18. ED64-16. Sheet 6b. [S7] "Anna Klemme Journal Sequel,", pg 37. Name Variation Emil Fred Klemme was also known as Emil Fritz. Nickname Emil Fred Klemme also went by the name of Emo. 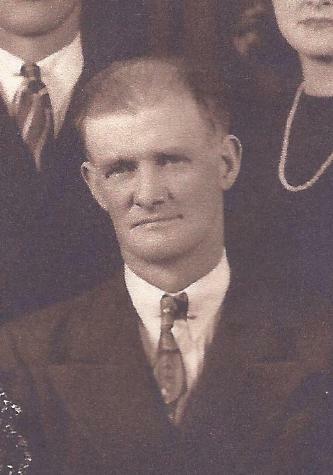 Emil Fred Klemme was born on 3 November 1895 at Marion, Kansas. He was the son of Henry Fritz Klemme and Magdalena Catharina Dorothea Maria Sophia Frahm. 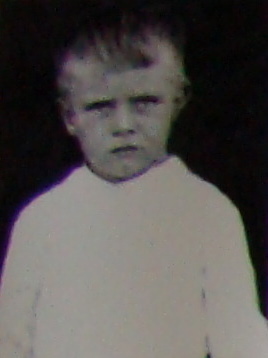 Emil Fred Klemme was baptized on 9 February 1896. 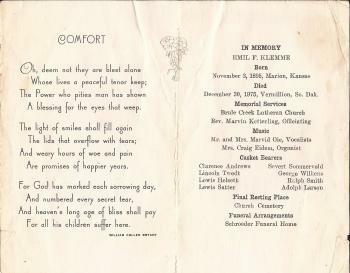 Emil Fred Klemme died on 30 December 1975 at Vermillion, South Dakota, at age 80 Emil Fred Klemme obituary; from leukemia which he had for 20 years; had ulcers, suffered depression and arthritis drove him nearly suicidal as a young man. He was buried on 3 January 1976 at Brule Creek Cemetery, Spink, Union, South Dakota. 1905 State Census, Plymouth, Iowa Emil Fred Klemme appeared on the census of 1905 in the household of Henry Fritz Klemme at State Census, Plymouth, Iowa. 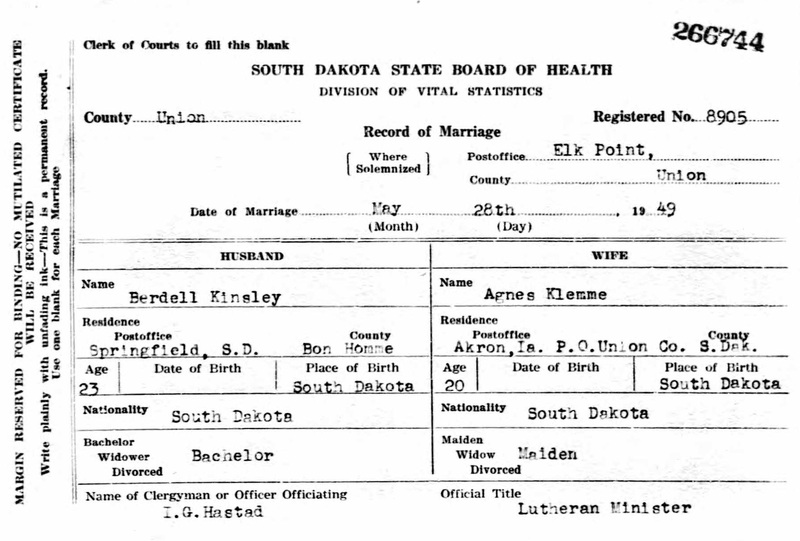 1915 South Dakota State Census, South Dakota Emil Fred Klemme appeared on the census of 1915 in the household of Henry Fritz Klemme at South Dakota State Census, South Dakota. 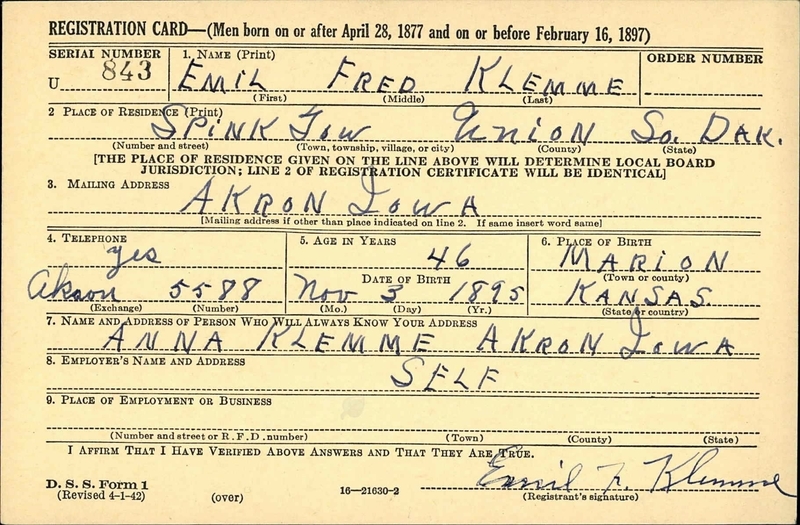 1925 South Dakota State Census, South Dakota Emil Fred Klemme appeared on the census of 1925 at South Dakota State Census, South Dakota. 1935 South Dakota State Census, Spink, Union, South Dakota He appeared on the census of 1935 at South Dakota State Census, Spink, Union, South Dakota. 1945 South Dakota State Census, Spink, Union, South Dakota He appeared on the census of 1945 at South Dakota State Census, Spink, Union, South Dakota. Farmed and lived on 80 acres inherited from his dad. Circa 1900 Klemme family photo including H F Klemme family. 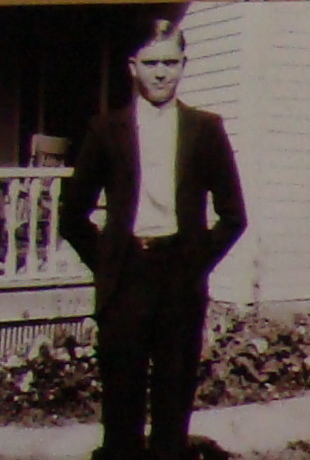 Emil Fred Klemme was confirmed on 20 March 1910 at Peace Lutheran Church, Alcester, South Dakota, "Emil was confirmed in the Peace Luteran Church up by Alcester. It was a German Lutheran congregation, where they went to church and were members. 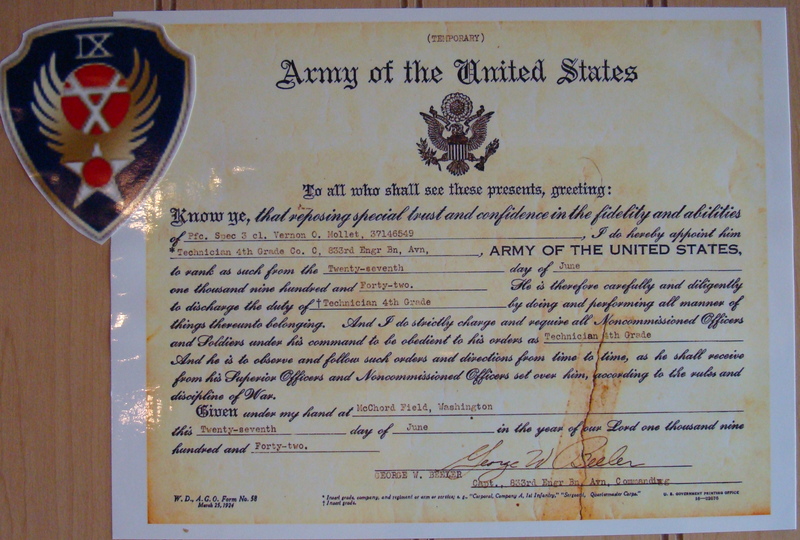 "8 On 5 June 1917 at WWI Registration, Union, South Dakota. 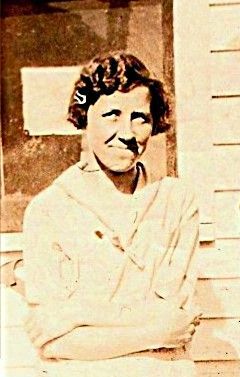 He began military service in July 1918 Anna Lykken visited Emil before he left Camp Dodge, Iowa for duty at Jacksonville, Florida. He was in Florida until his discharge. 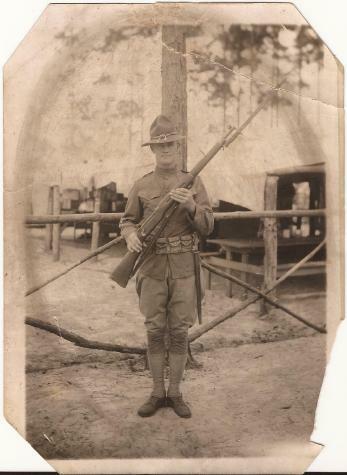 He had the flu at the time his company went overseas and so was not sent to Europe.9 In 1919 military photo - WWI. He ended Army military service in January 1919. 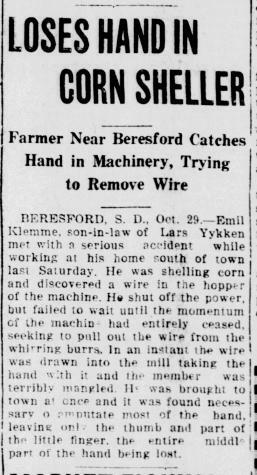 In October 1924 Emil Klemme loses hand in corn sheller. In November 1936 at Plymouth, Iowa, Thanksgiving guests at the H F Klemme home. 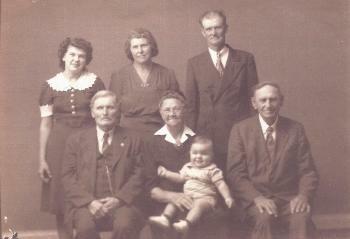 In July 1937 at LeMars, Plymouth, Iowa, attended the Klemme family reunion. 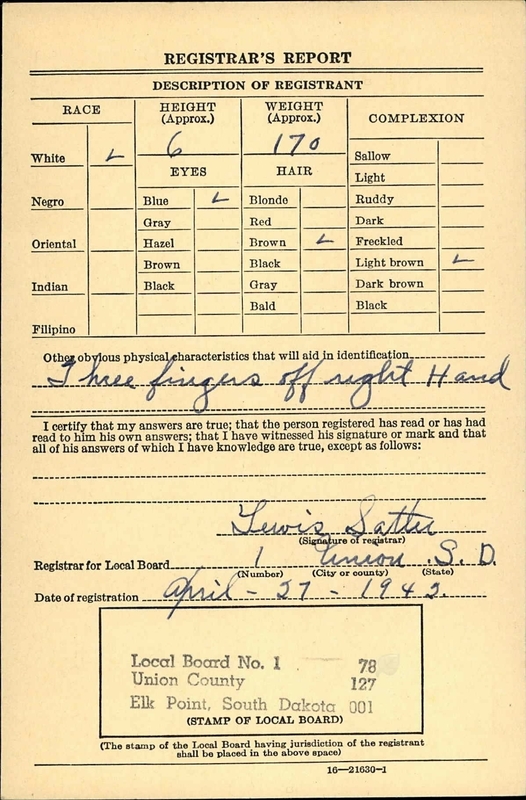 On 27 April 1942 at WWII Registration Card, Union, South Dakota, reported missing 3 fingers off of right hand. In November 1944 Emil and Anna (Lykken) Klemme 25th wedding anniversary. In July 1949 at LeMars, Plymouth, Iowa, attended the Klemme family picnic. 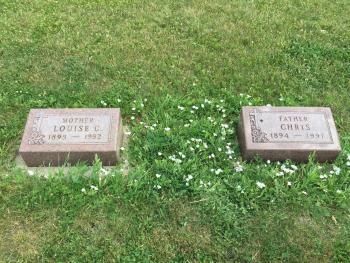 He and Anna Marie Lykken lived on 17 August 1952 at Akron, Plymouth, Iowa. Emil Fred Klemme and Anna Marie Lykken were The 13th annual Lykken reunion was held Sunday, August 17, at the home of Mr. And Mrs. Emil Klemme at Akron. 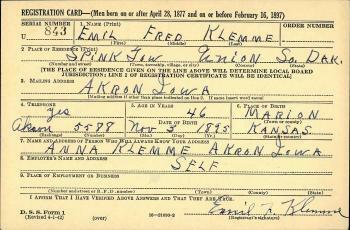 Emil Fred Klemme obtained US Social Security Card at Iowa. On 8 July 1962 at Akron, Iowa, Klemme Reunion 08 July 1962. 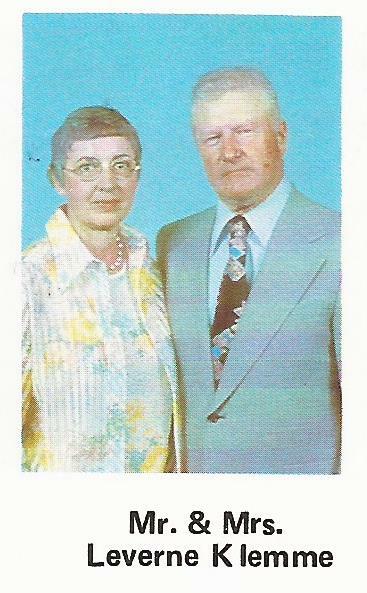 On 28 November 1969 at Elk Point, South Dakota, Mr and Mrs Emil Klemme celebrated 50th wedding anniversary. On 28 June 1973 at Family visitors to Ole Lykken home. On 30 June 1974 at Akron, Plymouth, Iowa, 90 family members attended the annual Klemme Reunion. 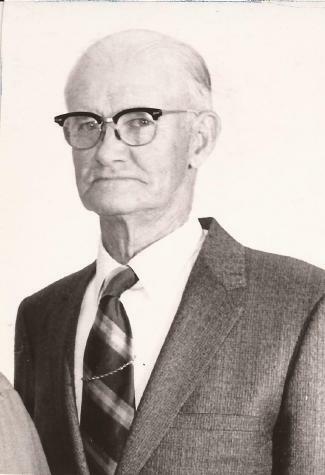 On 1 June 1975 at Akron, Plymouth, Iowa, attended Klemme family reunion. 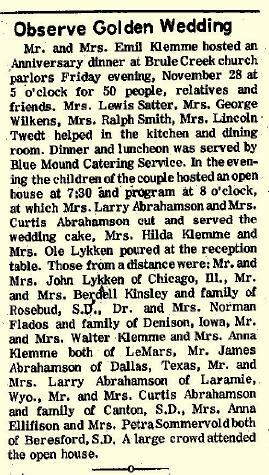 In November 1975 at at the Olaf Abrahamson home, Akron, Iowa, Emil Klemme 80th birthday dinner. [S8] "Anna Klemme Journal,", pg 29. 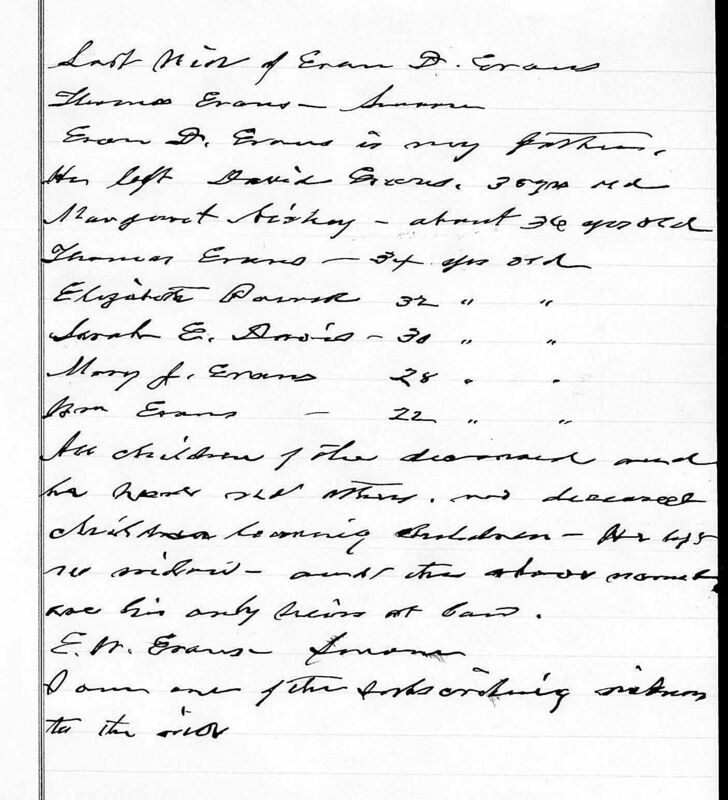 [S245] U.S. Federal Census 1900 U.S. Federal Census, by Ancestry.com, Sheet 6B. ED109. Dwelling 116. [S244] U.S. Federal Census 1910 U.S. Federal Census, by Ancestry.com, Pg. 1B. ED 430. #12, 13. [S243] U.S. Federal Census 1920 U.S. Federal Census, by Ancestry.com, ED250, Sheet 5B, dwelling 84. [S8] "Anna Klemme Journal,", pg 33. [S8] "Anna Klemme Journal,", Pg 27. 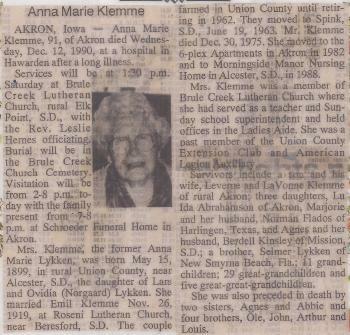 Nickname Anna Marie Lykken also went by the name of Annie. 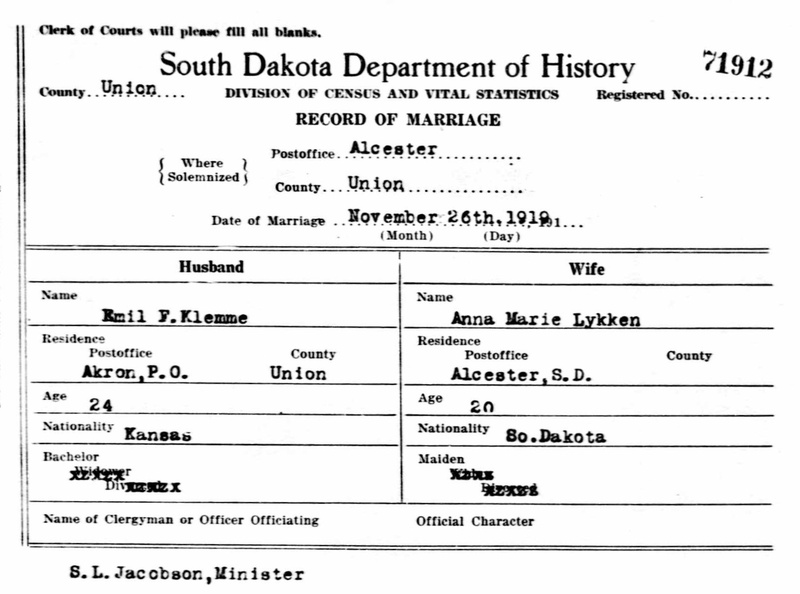 Married Name 26 November 1919 As of 26 November 1919,her married name was Klemme. 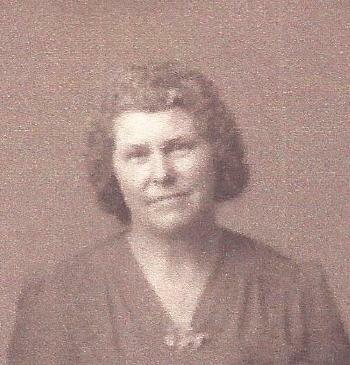 Anna Marie Lykken was born on 15 May 1899 at Beresford, Union, South Dakota, also reported as Alcester. She was the daughter of Lars Olsen Lykken and Ovidia Nordgaard. Anna Marie Lykken was baptized on 4 June 1899 at Rosine Norsk Evangelisk Luthersk Menigheg (Roseni Lutheran Congregation), Beresford, Union, South Dakota. She was buried after 12 December 1990 at Brule Creek Cemetery, Spink, Union, South Dakota. 1905 State Census, South Dakota Anna Marie Lykken appeared on the census of 1905 in the household of Lars Olsen Lykken at State Census, South Dakota. 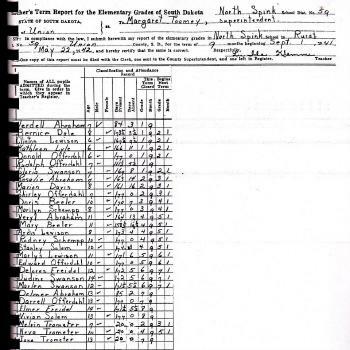 1915 South Dakota State Census, South Dakota Anna Marie Lykken appeared on the census of 1915 in the household of Lars Olsen Lykken at South Dakota State Census, South Dakota. 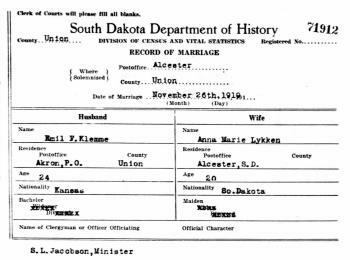 1925 South Dakota State Census, South Dakota Anna Marie Lykken appeared on the census of 1925 in the household of Emil Fred Klemme at South Dakota State Census, South Dakota. 1935 South Dakota State Census, Spink, Union, South Dakota Anna Marie Lykken appeared on the census of 1935 in the household of Emil Fred Klemme at South Dakota State Census, Spink, Union, South Dakota. 1945 South Dakota State Census, Spink, Union, South Dakota Anna Marie Lykken appeared on the census of 1945 in the household of Emil Fred Klemme at South Dakota State Census, Spink, Union, South Dakota. 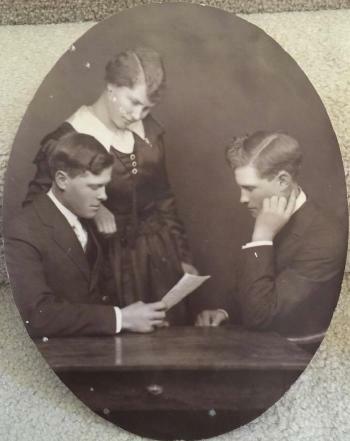 Portrait of Anna Lykken Klemme with brothers John and Ole. 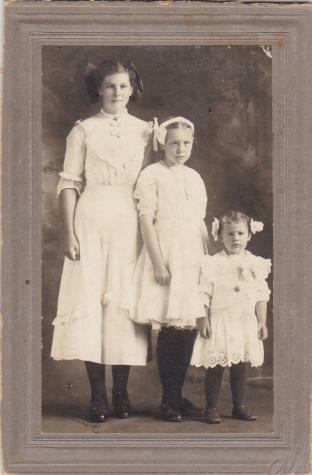 Circa 1913 photo of Lykken sisters Anna (age 13), Agnes (age 11), Abbie (age 5). 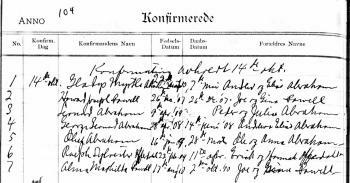 Anna Marie Lykken was confirmed on 28 September 1913 at Roseni Church "Sixty-seven years ago on the 28th of September I was confirmed at the Roseni Church. That would be 1913, and I was 14 years old at the time. I remember that day real well. I wore a white viole dress and I had a redvelvet hood to wear that fall. 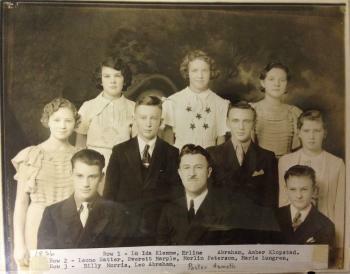 "9 In November 1936 at Plymouth, Iowa, Thanksgiving guests at the H F Klemme home. 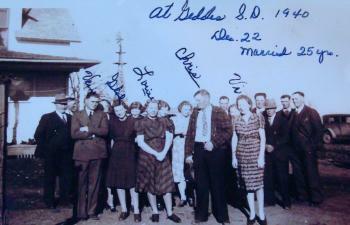 In July 1937 at LeMars, Plymouth, Iowa, attended the Klemme family reunion. 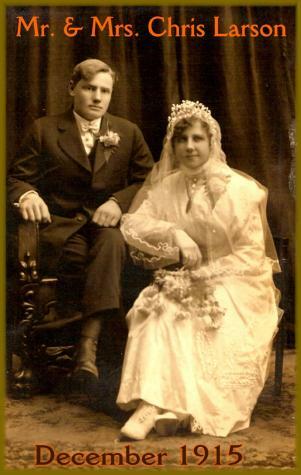 In November 1944 Emil and Anna (Lykken) Klemme 25th wedding anniversary. In July 1949 at LeMars, Plymouth, Iowa, attended the Klemme family picnic. Circa 1952 paralyzed at age 53 on left side following surgery to remove a brain tumor. 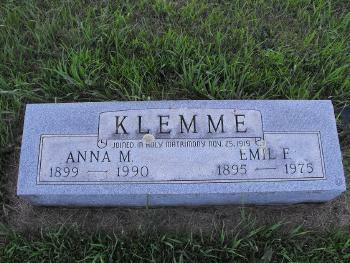 She and Emil Fred Klemme lived on 17 August 1952 at Akron, Plymouth, Iowa. Anna Marie Lykken and Emil Fred Klemme were The 13th annual Lykken reunion was held Sunday, August 17, at the home of Mr. And Mrs. Emil Klemme at Akron. On 8 July 1962 at Akron, Iowa, Klemme Reunion 08 July 1962. Anna Marie Lykken obtained US Social Security Card at Iowa. On 28 November 1969 at Elk Point, South Dakota, Mr and Mrs Emil Klemme celebrated 50th wedding anniversary. 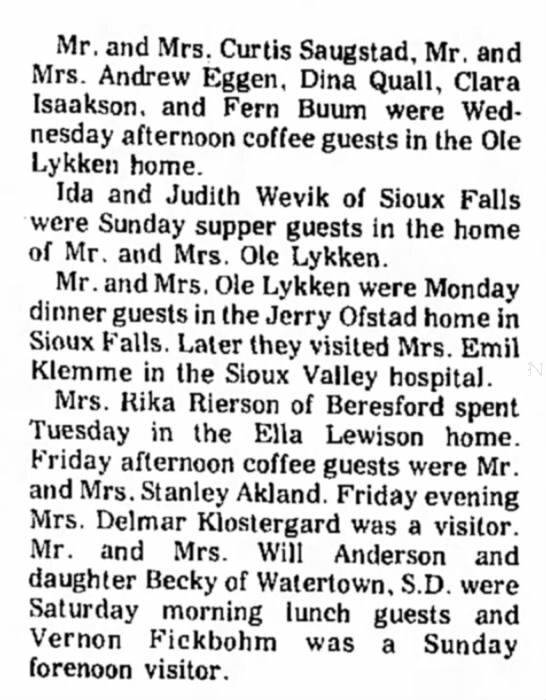 On 29 March 1973 Social engagements of Ole Lykken family including visiting Mrs. Emil Klemme in the hospital. On 28 June 1973 at Family visitors to Ole Lykken home. In 1976. On 15 May 1975 Anna (Lykken) Klemme birthday celebration. In August 1976 John Lykken, Mrs Abbie Anderson and Mrs Lewis Satter were Friday visitors of Mrs Emil Klemme. 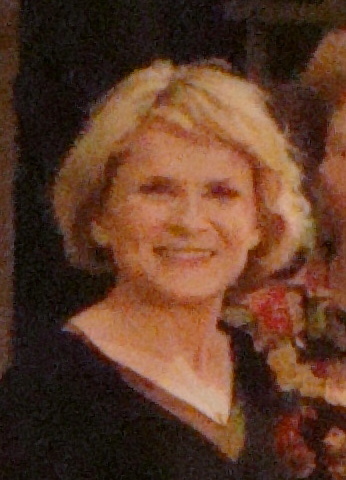 In 1982 Anna (Lykken) Klemme published two memoirs: My Life As I Remember It (1971), and Sequel To My Life As I Remember It (1982). [S184] Beresford Republic Newspaper, Vol. 97, 1990, Dec 20. [S245] U.S. Federal Census 1900 U.S. Federal Census, by Ancestry.com, Sheet 15B. Dwelling 282. ED 332. [S244] U.S. Federal Census 1910 U.S. Federal Census, by Ancestry.com, ED431. Sheet 7B. Dwelling 99. [S7] "Anna Klemme Journal Sequel,", pg 24. Name Variation Leverne Harold Klemme was also known as Luverne. 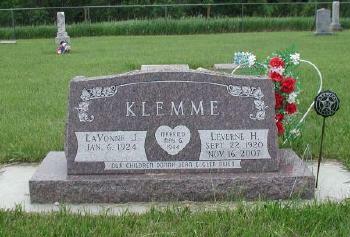 Leverne Harold Klemme was born on 22 September 1920 at Emmet, Union, South Dakota. 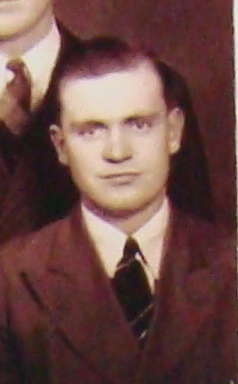 He was the son of Emil Fred Klemme and Anna Marie Lykken. 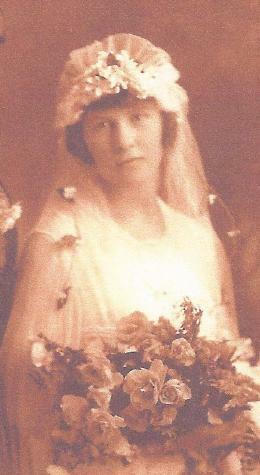 Leverne Harold Klemme was baptized on 4 October 1920. Leverne Harold Klemme married LaVonne Jean Hornstein, daughter of Clarence Nicholas Hornstein and Cecelia A. 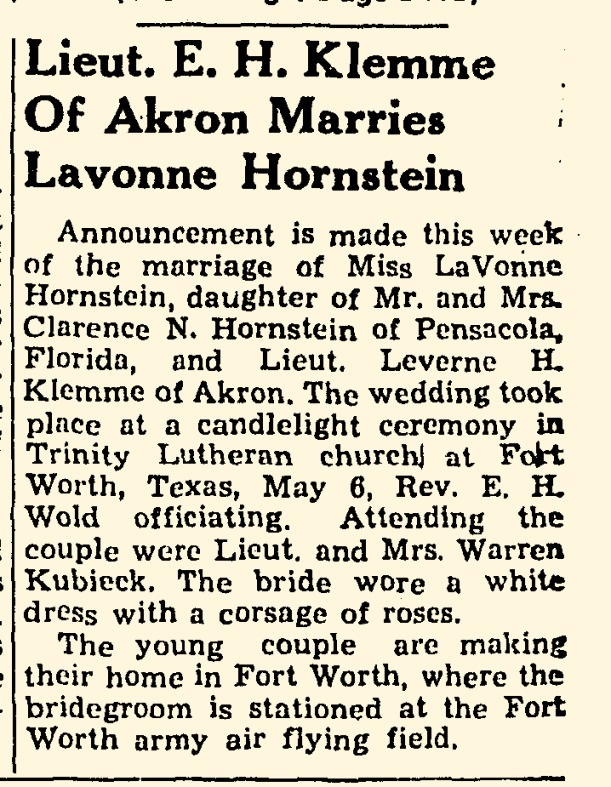 Fields, on 3 May 1944 at Fort Worth, Texas, Leverne Klemme and LaVonne Hornstein marriage announcement. Leverne Harold Klemme died on 16 November 2007 at age 87 Leverne H. Klemme, 87, of Akron passed away Friday, Nov. 16, 2007, at Akron Care Center in Akron. 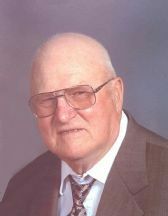 Services will be 11 a.m. Tuesday at Brule Creek Lutheran Church, rural Elk Point, S.D., with the Rev. Jared Rakness officiating. Burial will be in the parish cemetery, with military rites conducted by American Legion, Hoschler Post 186 of Akron. Visitation will be after 3 p.m. today, with the family present after 5:30 p.m., and a prayer service at 6:30 p.m., all at Carlsen Funeral Home-Schroeder Chapel in Akron. Visitation will resume one hour prior to the services on Monday at the church. 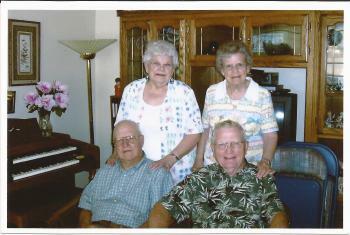 Expressions of sympathy can be extended to the family through www.carlsenfuneralhome.com. 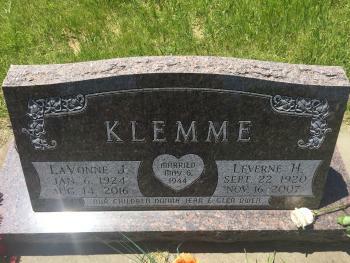 Leverne Harold Klemme was born Sept. 22, 1920, on the family farm near Nora, S.D., the son of Emil and Anna (Lykken) Klemme. He was baptized and confirmed into the Christian faith. He attended Nora Country School and later, Pleasant Hill Country School. He attended high school in Elk Point and graduated from Elk Point High School. 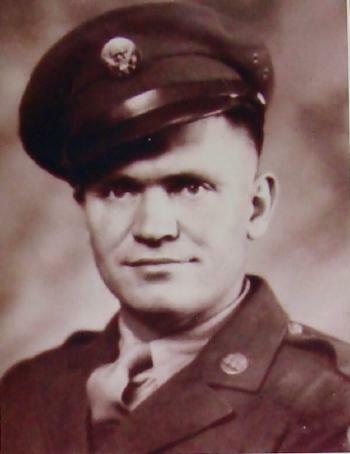 He enlisted in the U.S. Air Force on Jan. 30, 1943. He served our country during World War II as an instructor pilot for B-24s and B-32s at Tarrant Field in Fort Worth, Texas. 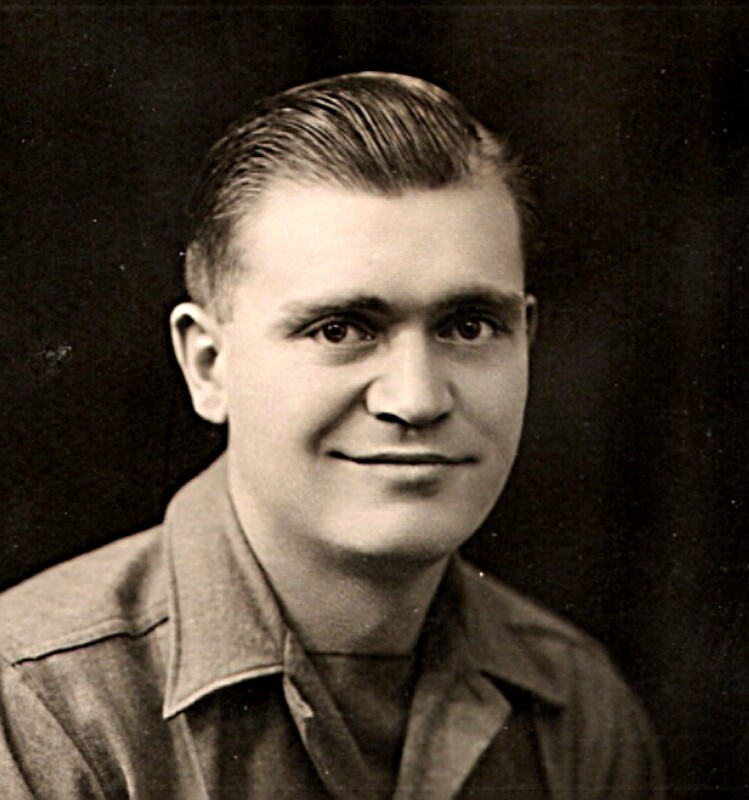 While stationed in Texas, he was united in marriage to LaVonne Hornstein on May 6, 1944. He was honorably discharged on Dec. 20, 1946. Following his discharge, they returned to Union County, S.D., and farmed near Spink. On May 2, 1951, Leverne was called back to service. 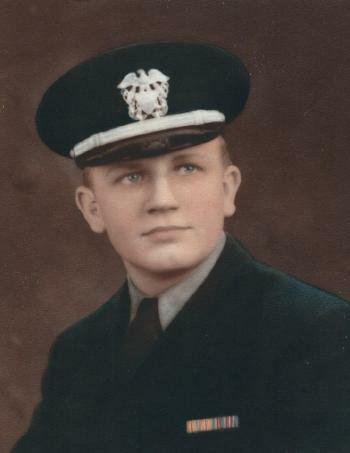 He was an aircraft commander for B-29s stationed in San Antonio, Texas. He and his crew of 10 men were assigned to Yakota Air Force base in Tokyo, Japan. He and his bombing crew flew 35 missions over Korea, seven of which were as a lead bomber. Together, he and his crew flew more than 300 combat hours in Korea. On Feb. 1, 1953, he was honorably discharged as a captain. For his service to our country, he was awarded the World War II Victory Medal, Korean Service Medal, United Nations Service Medal and the Air Medal with one Cluster. After returning from the Korean Conflict, he and LaVonne farmed near Union Creek, S.D., for 12 years. Later, they moved to the family farm of his parents near Spink, S.D. He and LaVonne farmed there for more than 33 years. In 1999, they moved to their home in Akron. Leverne was very active in church and community works. He was a longtime member of Brule Creek Lutheran Church, where he served on church council and was past church treasurer and council president. He was president of the Brule Creek Cemetery Board. He was a 50-year member of the Hoschler American Legion Post 186 in Akron, where he was past commander and post historian. 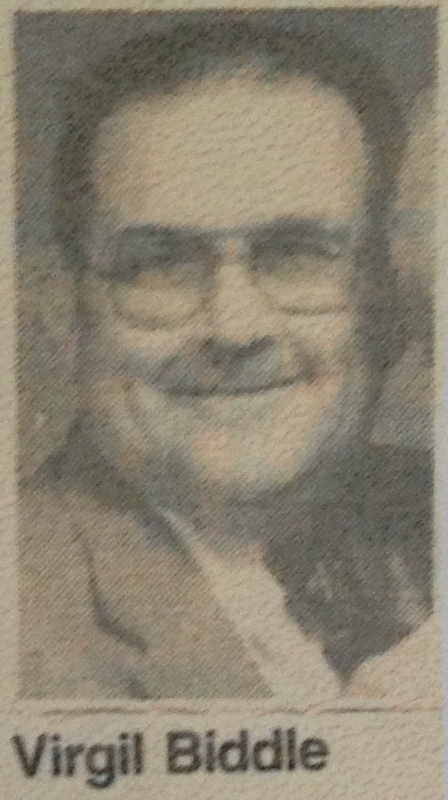 He also served as chairman of the School Board for Union County, S.D. District 33. 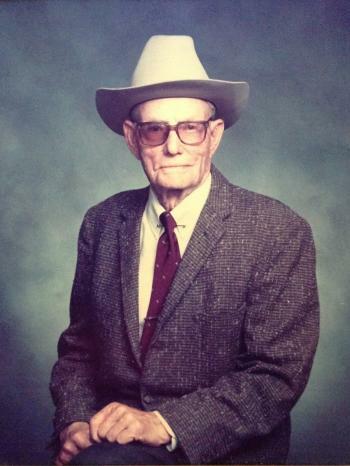 He served as president of the Cattle Feeder Association and served on the Union County Extension Board. He was past president of the Union County Farm Bureau and former vice president for the state of South Dakota Farm Bureau. He was a member of the Akron Lion's Club. Leverne enjoyed reading books about the Civil War era. He was very proud of his service to his country. He wrote and published a book about his military history during World War II and the Korean Conflict. He enjoyed assembling and collecting models of the planes that he flew during his military service. He also enjoyed listening to big band music from the '40's and photography. But most all he enjoyed the times spent with his family and friends. He will be greatly missed by all who knew him. Survivors include his wife of more than 63 years, LaVonne of Akron; a son, Glen Klemme and his wife, Vicki of Sioux Falls, S.D; a daughter, Donna Swanson and her husband, Verdell of Alcester, S.D; six grandchildren; 10 great-grandchildren; two sisters, LuIda Abrahamson of Akron and Marjorie Flados of Harlingen, Texas; and several nieces and nephews. He was preceded in death by his parents; a sister, Agnes Kinsley; and a daughter-in-law, Donna Rae Klemme. 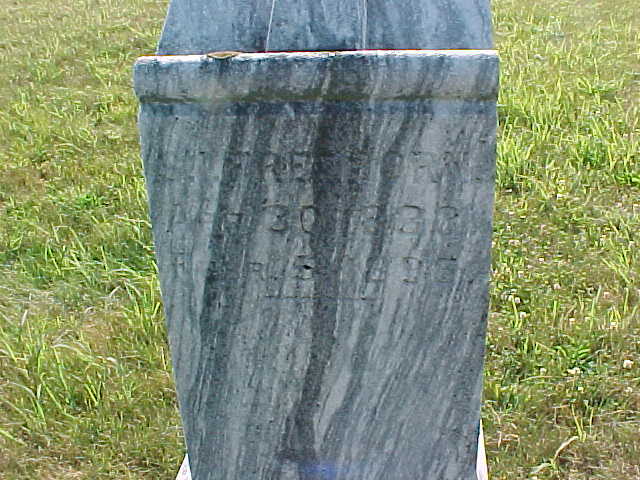 He was buried after 16 November 2007 at Brule Creek Cemetery, Spink, Union, South Dakota. 1925 South Dakota State Census, South Dakota Leverne Harold Klemme appeared on the census of 1925 in the household of Emil Fred Klemme at South Dakota State Census, South Dakota. 1935 South Dakota State Census, Spink, Union, South Dakota Leverne Harold Klemme appeared on the census of 1935 in the household of Emil Fred Klemme at South Dakota State Census, Spink, Union, South Dakota. 1945 South Dakota State Census, Spink, Union, South Dakota Leverne Harold Klemme appeared on the census of 1945 in the household of Emil Fred Klemme at South Dakota State Census, Spink, Union, South Dakota. 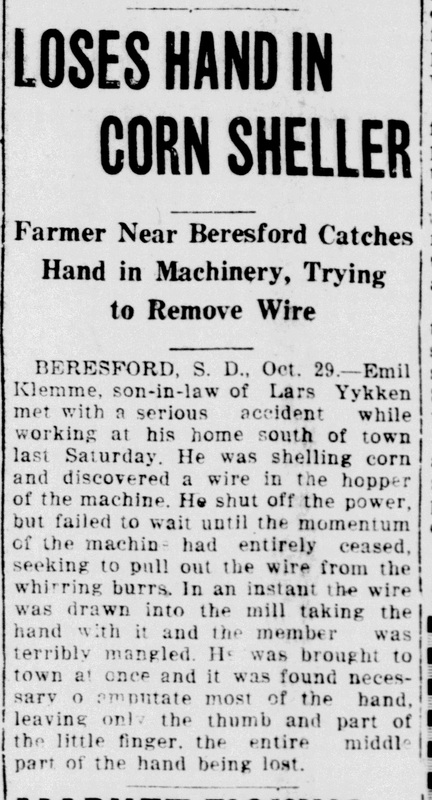 Leverne Harold Klemme was a Farmer on the farm that H. F Klemme bought in 1912. 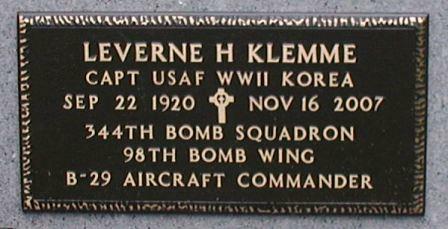 Leverne Harold Klemme is active in Farm Bureau on the state level and is a veteran of W.W. II and Korean Conflict where he served as a B-29 pilot. He witnessed Lu Ida Olive Klemme attending school in September 1932 at Pleasant Hill School, Akron, Iowa; (listed in newspaper). 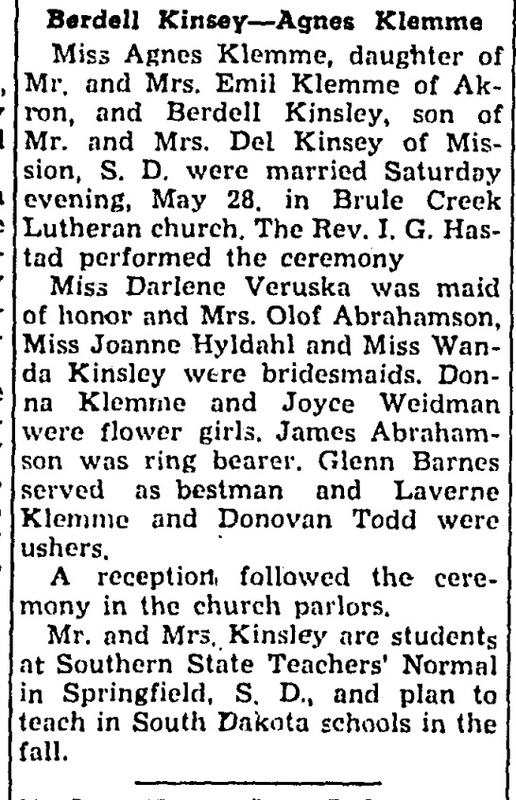 Leverne Harold Klemme was confirmed on 27 May 1934 at Brule Creek Lutheran Church, Union, South Dakota. In July 1937 at LeMars, Plymouth, Iowa, attended the Klemme family reunion. On 30 June 1974 at Akron, Plymouth, Iowa, 90 family members attended the annual Klemme Reunion. 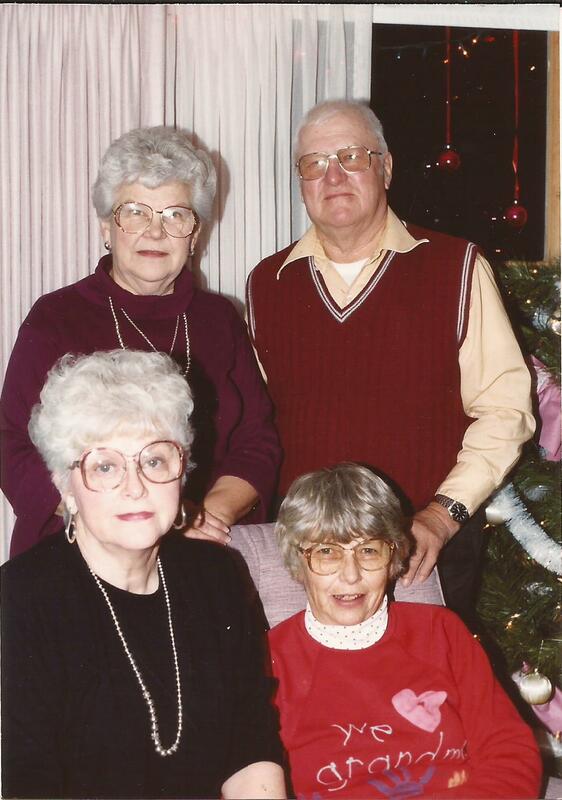 In November 1975 at at the Olaf Abrahamson home, Akron, Iowa, Emil Klemme 80th birthday dinner. In 1976. 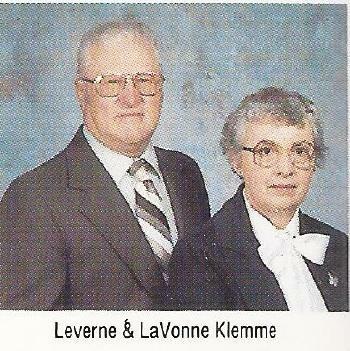 As of 1983, Leverne Harold Klemme's address was RR #2, Akron, Iowa; but they live in southeastern South Dakota. In 1983. 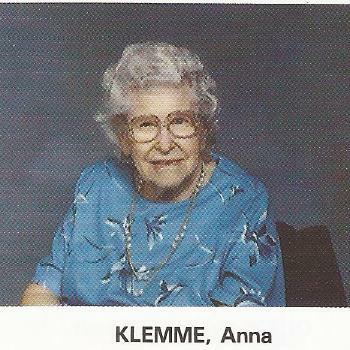 Married Name 3 May 1944 As of 3 May 1944,her married name was Klemme. 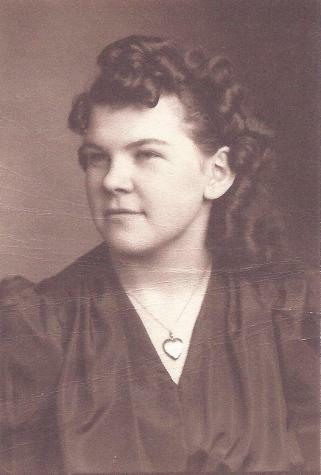 LaVonne Jean Hornstein was born on 6 January 1924 at Platte, South Dakota. She was the daughter of Clarence Nicholas Hornstein and Cecelia A. Fields. 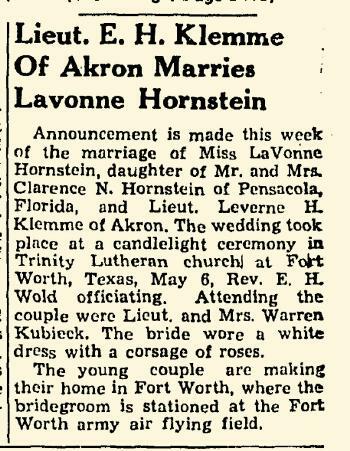 LaVonne Jean Hornstein married Leverne Harold Klemme, son of Emil Fred Klemme and Anna Marie Lykken, on 3 May 1944 at Fort Worth, Texas, Leverne Klemme and LaVonne Hornstein marriage announcement. LaVonne Jean Hornstein died on 14 August 2016 at age 92 Lavonne Klemme, 92, of Hawarden, Iowa, formerly of Akron, Iowa passed away Sunday, August 14, 2016 at Hillcrest Health Care Center in Hawarden. A Memorial Service will be at 10:30 a.m., Friday, August 19, 2016 at Brule Creek Lutheran Church in rural Elk Point, South Dakota with Pastor Steve Martens officiating. A visitation with the family present will be from 9:30 a.m. until the start of the service at the church. Burial will be at Brule Creek Lutheran Cemetery in rural Elk Point, South Dakota. She was buried on 19 August 2016 at Brule Creek Cemetery, Spink, Union, South Dakota. In November 1975 at at the Olaf Abrahamson home, Akron, Iowa, Emil Klemme 80th birthday dinner. In 1976. [S250] U.S. Federal Census 1930 U.S. Federal Census, by Ancestry.com, ED22. Dwelling 19. 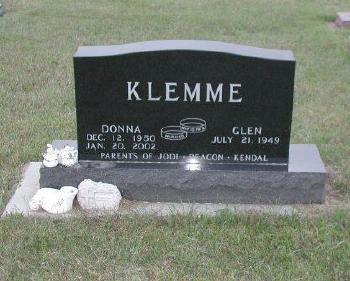 Married Name 13 May 1972 As of 13 May 1972,her married name was Klemme. Donna Rae Johnson was born on 12 December 1950 at LeMars, Plymouth, Iowa. She was the daughter of Walter John Johnson. 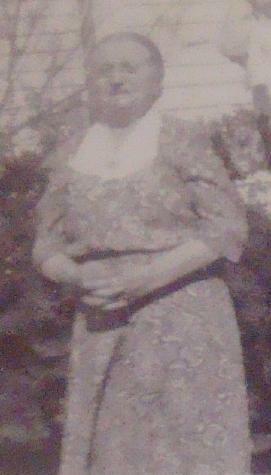 Donna Rae Johnson was baptized on 17 December 1950. She died on 20 January 2002 at auto accident, Akron, South Dakota, at age 51 AKRON, S.D. -- Donna R. Klemme, 51, of Akron died Sunday, Jan. 20, 2002, from injuries suffered in an automobile accident. Memorial services will be 7 p.m. Thursday at Trinity Lutheran Church in Akron, Iowa, with the Rev. Sonja Brucklacher officiating. The family will be present from 6 p.m. until service time at the church. Cremation has taken place. Arrangements are under the direction of Schroeder Funeral Home in Akron, Iowa. Donna was born Dec. 12, 1950, to Walter and Helen (Ohlrichs) Johnson. She graduated from Le Mars (Iowa) High School. She attended Spencer School of Business in Spencer, Iowa, for one year. 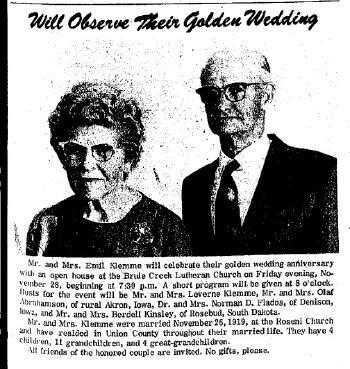 She married Glen Klemme on May 13, 1972, at Christ Lutheran Church in Grant Township, Iowa. The couple had three children, Jodi, Deacon and Kendal. Donna was employed with Union County Electric for 18 years. She was a member of the Akron chapter of the P.E.O. 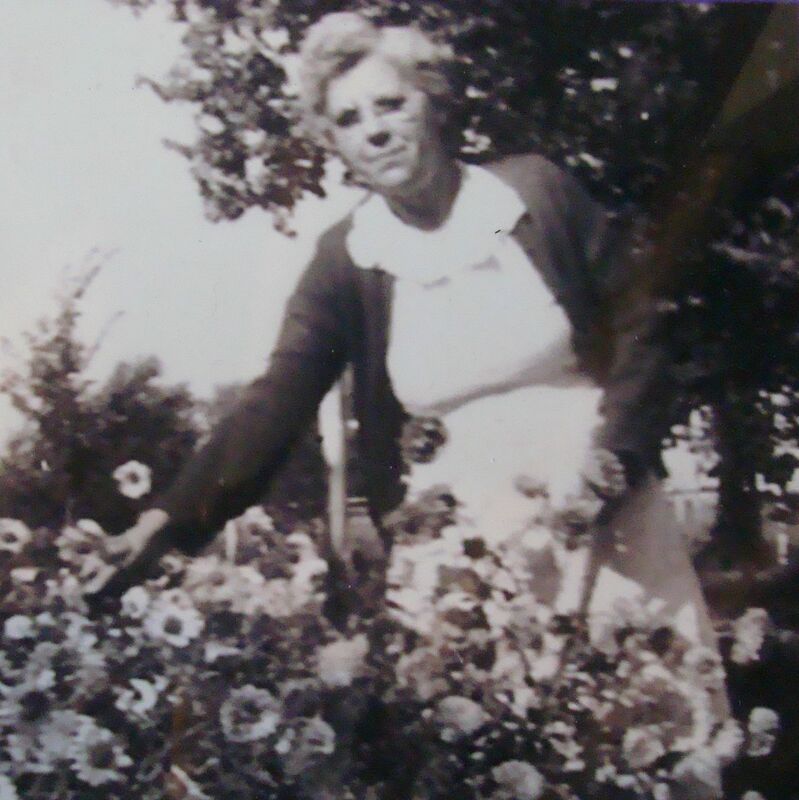 She enjoyed cross stitching, working in the yard and her flowers beds. 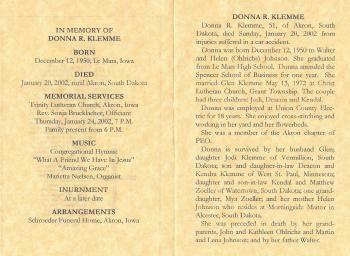 Donna is survived by her husband, Glen; a daughter, Jodi Klemme of Vermillion, S.D; a son and his wife, Deacon and Kendra Klemme of West St. Paul, Minn; a daughter and her husband, Kendal and Matthew Zoeller of Watertown, S.D; a granddaughter, Mya Zoeller; and her mother, Helen Johnson of Morningside Manor in Alcester, S.D. Donna was preceded in death by her grandparents, John and Kathleen Ohlrichs and Martin and Lena Johnson; and her father, Walter. ~Source: The Sioux City Journal. 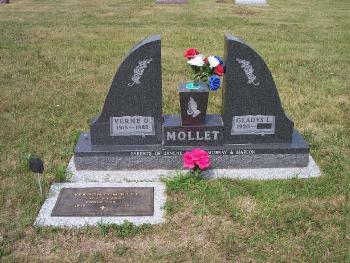 She was buried after 20 January 2002 at Brule Creek Cemetery, Spink, Union, South Dakota. 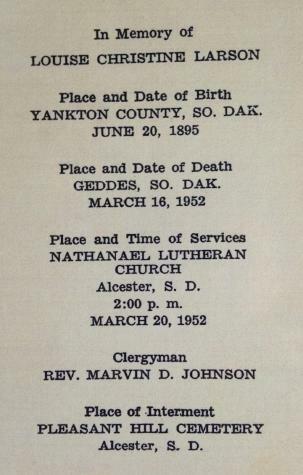 Donna Rae Johnson was confirmed on 14 June 1964. 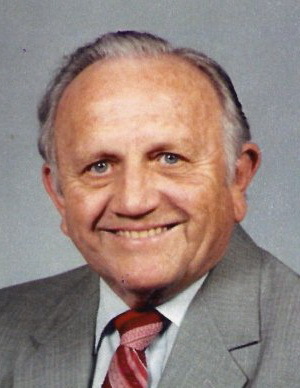 Norman D. Flados was born on 2 January 1923 at Nacona, Texas. He was the son of Ole Ludwig Flados and Una Missouri Flournoy. Norman D. Flados died on 13 October 2006 at age 83 Norman Flados, resident of Palm Valley, passed away on October 13, 2006 at the age of 83. 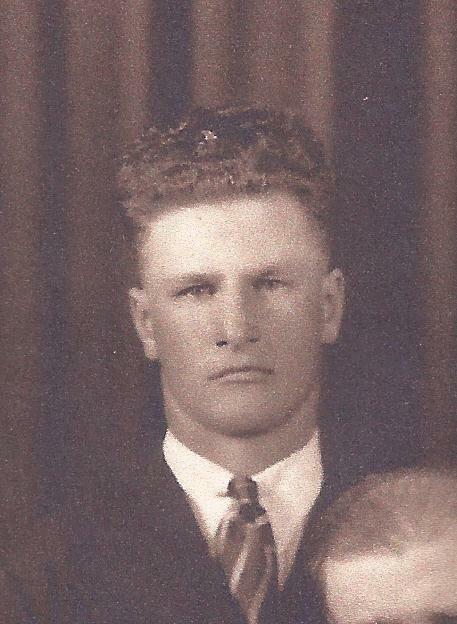 He was born on January 2, 1923 in Nocona, Texas to Ole and Una Flados; they and his siblings, Richard and Dorthea Flados have preceded him in death. 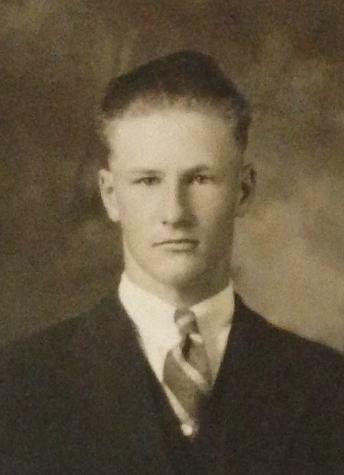 After graduation from Nocona High School he attended the University of Texas at Austin and in 1943 was granted an NROTC commision in the U.S. Navy. During World War II he served in surface craft and after the war as a member of the Submarine Service. 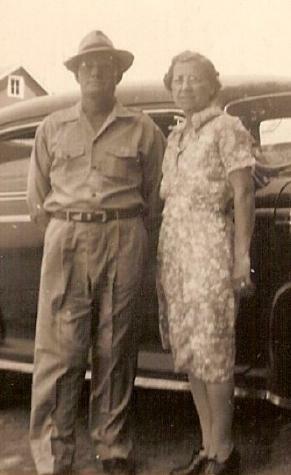 In 1946 he married Marjorie Klemme of Elk Point, South Dakota and they lived in port cities on the East Coast, West Coast and Panama during the nine years he served in the Navy. After leaving the Service he received a Master’s Degree in Education from the University of Texas followed by a second Bachelor of Science Degree and a Ph.D. in Plant Science from Texas A&M University at College Station. During his career as a college professor he taught biological and plant sciences at Sam Houston State University, Midwetern College in Denison, Iowa and at California State College in Bakersfield, California. He has maintained farming interests in the Valley since 1950, and has made his home in the Harlingen area since 1975. 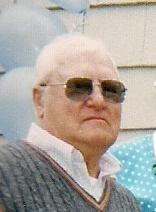 He was a member of St. Paul Lutheran Church where he had served as a Church Elder. In the past he served as faculty advisor/mentor to the Kappa Alpha fraternity and was a member of Sigma Xi, scientific honorary fraternity. In recent years he enjoyed membership in the Rhinos, a local discussion group of learned fellows. A scholarly man he was a devoted husband, caring father, grandfather and great grandfather. He is survived by his wife of 60 years, Marjorie Flados; his children, Fara Jones (Joe) of Palm Valley, Mark Flados (Deb) of Austin, Texas, John Flados of Houston, four grandchildren and three great grandchildren. A Service of Remembrance will be held at St. Paul Lutheran Church, 602 Morgan Boulevard, Harlingen, Texas on Tuesday, October 17th at 11 a.m. with Rev. Bill Reagan officiating. The family request that in lieu of flowers, those desiring to do so may make memorial contributions to St. Paul Lutheran Church, 602 Morgan Boulevard, Harlingen, Texas or the charity of your choice. Funeral arrangements are under the direction of Buck Ashcraft Funeral Home. In 1983 Norman is a Navy veteran of W. W. II, a graduate of the University of Texas and Texas A&M with a doctorate in Plant Pathology. His is presently working in Real Estate. [S250] U.S. Federal Census 1930 U.S. Federal Census, by Ancestry.com, ED39-1. Dwelling 44. Married Name 28 May 1949 As of 28 May 1949,her married name was Kinsley. 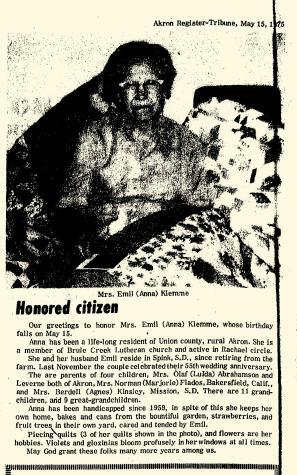 Agnes Fern Klemme was born on 28 December 1928 at Union, South Dakota. 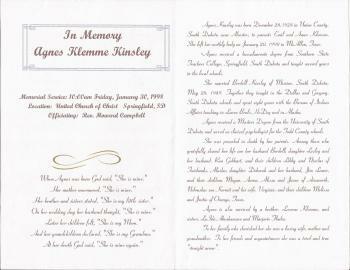 SPRINGFIELD -- Agnes Klemme Kinsley, 69, of Springfield died Jan. 20, 1998, in McAllen, Texas. Memorial services are at 10 a.m. Friday at the United Church of Christ, Springfield, with the Rev. Howard Campbell officiating. Burial is in the Springfield Cemetery. The Crosby-Jaeger Funeral Home, Springfield, is in charge of arrangements. 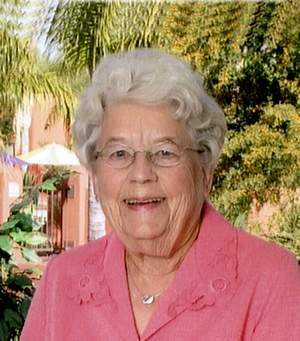 Agnes Kinsley, 69, of Springfield died Tuesday, Jan. 20, 1998, in McAllen, Texas. Memorial services will be at 10 a.m. Friday at United Church of Christ in Springfield, with the Rev. Howard Campbell officiating. Burial will be in Springfield cemetery. The Crosby-Jaeger Funeral Home in Springfield in handling local arrangements. 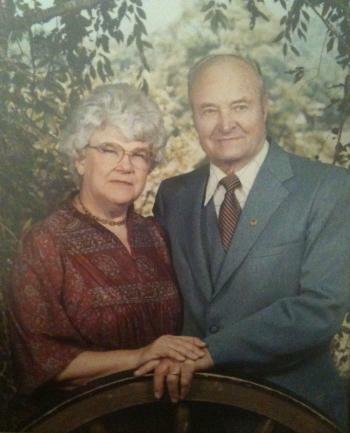 Mrs. Kinsley was born Dec. 28, 1928, in Union County near Alcester, S.D., the daughter of Emil and Anna Klemme. She received a baccalaureate degree from Southern State Teacher's College in Springfield and taught for several years in the local rural schools. 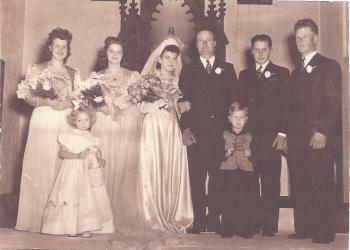 She married Berdell Kinsley of Mission, S.D., on May 28, 1949. The couple taught in the Dallas and Gregory schools and spent eight years with the Bureau of Indian Affairs teaching in Lower Brule, HeDog and Alaska. She received a master's degree from the University of South Dakota and served as clinical psychologist for the Todd County Schools. Survivors include her husband; two daughters and their husbands, Lesley and Ron Gebhart of Fairbanks, Alaska, and Deborah and Jim Lauer of Ainsworth, Neb; a son and his wife, Kermit and Virginia of Orange, Texas; eight grandchildren, Libby and Nicolas Gebhart, Megan, Aaron, Alissa and Jason Lauer and Melissa and Justin Kinsley; a brother and his wife, Leverne and LaVonne Klemme of West Akron, S.D; and two sisters, Lulda Abrahamson of Akron, Iowa, and Marjorie and her husband, Norman Flados, of Harlingen, Texas. She was buried after 20 January 1998 at Springfield Cemetery, Springfield, Bon Homme, South Dakota. 1935 South Dakota State Census, Spink, Union, South Dakota Agnes Fern Klemme appeared on the census of 1935 in the household of Emil Fred Klemme at South Dakota State Census, Spink, Union, South Dakota. 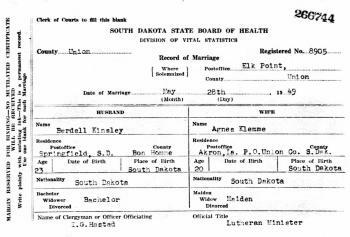 1945 South Dakota State Census, Spink, Union, South Dakota Agnes Fern Klemme appeared on the census of 1945 in the household of Emil Fred Klemme at South Dakota State Census, Spink, Union, South Dakota. 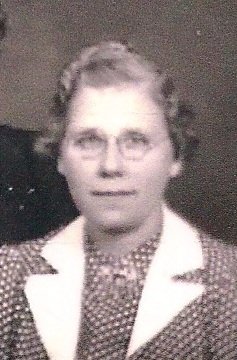 Agnes Fern Klemme obtained US Social Security Card at South Dakota. In July 1937 at LeMars, Plymouth, Iowa, attended the Klemme family reunion. In November 1975 at at the Olaf Abrahamson home, Akron, Iowa, Emil Klemme 80th birthday dinner. 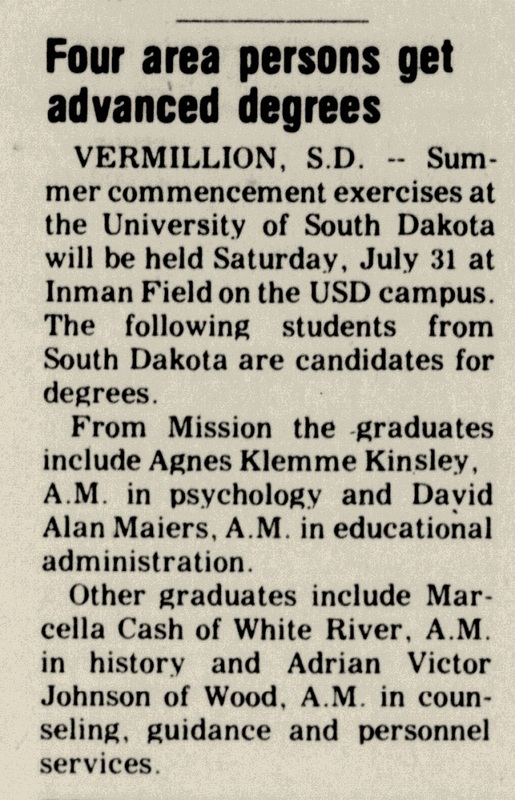 She obtained a degree in August 1976 Agnes Klemme Kinsley earns education degree from University of South Dakota. She was a school psychologist for Todd County. in 1983 at Todd, South Dakota.